© Thoralf Doehring. Used with permission. 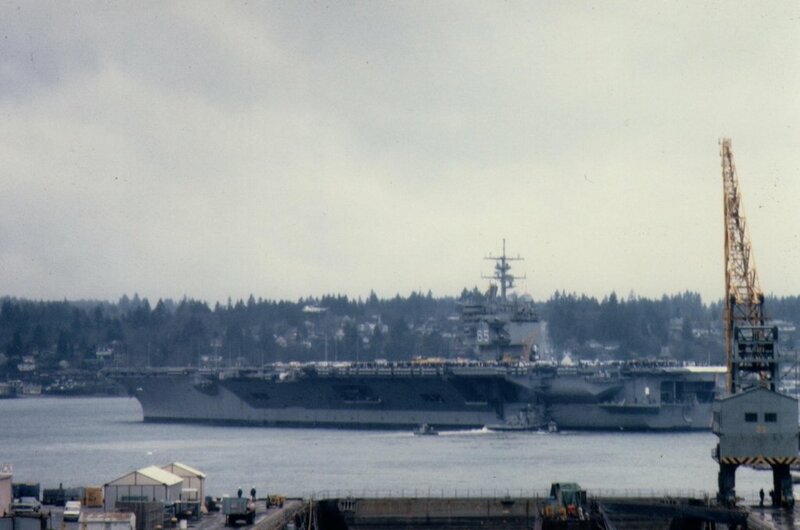 Aerial port quarter view of USS Enterprise (CVN-65) underway off the coast of Washington, early February 1982, following a long Puget Sound refit begun in 1979. 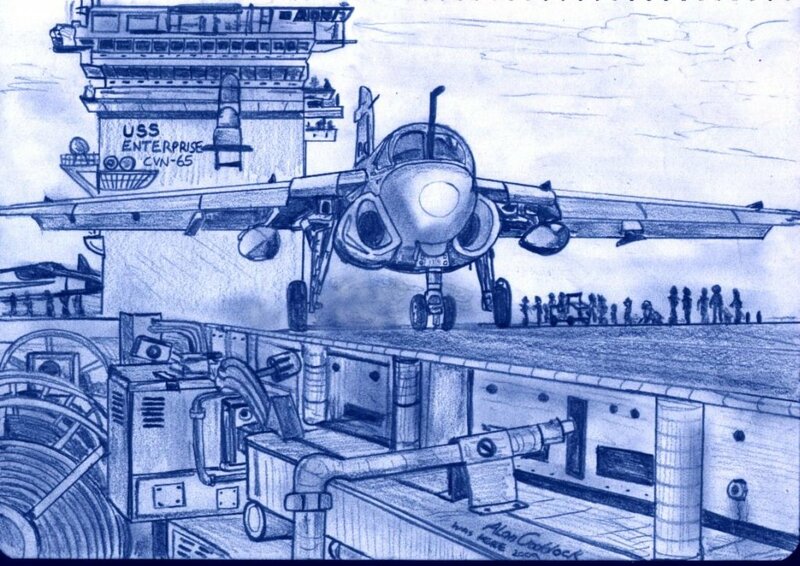 The most noticeable change was the reconstruction of her island: her futuristic electronic-scan radars were removed and replaced by an SPS-48 3/D radar (forward) and an SPS-49 long-range air search set (aft), as well as an SPN-41 for CCA aft on the starboard side of her flight deck. At the same time three 8-cell NATO Sea Sparrow Mk.29 launchers (one on the after port sponson) replaced the BPDMS installed in 1967, and the ship was also fitted with three Phalanx CIWS (one of them visible on the port forward sponson and another on the after port edge of her quarterdeck). US Navy photo by PHS Ronald Cabral (DVIC id: DNSN8206011). 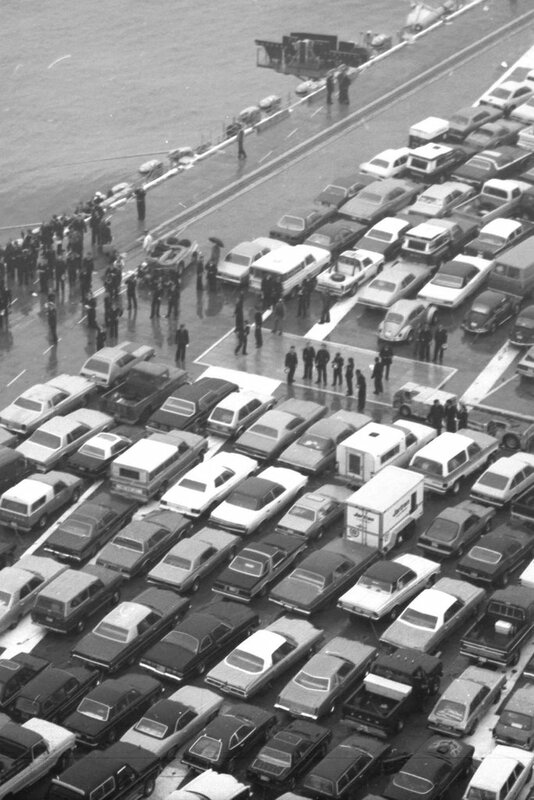 "These photos are all of the Big E loaded up with cars for the transit back to Alameda from PSNSY Feb 11, 1982." 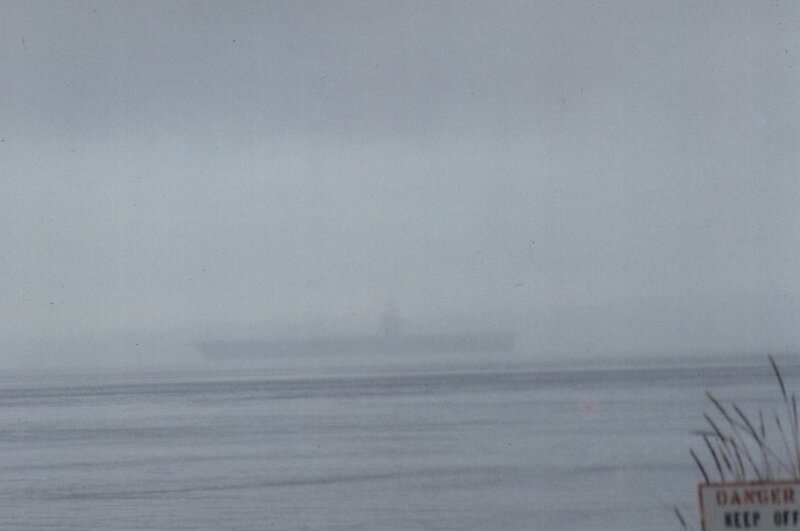 "The one shrouded in fog was taken near the entrance to the Strait of Juan de Fuca at Worden State Park." "All photos taken by Kent Smith (ET2), Dallas TX. Crewman at the time." Two days later, on 13 February 1982, Enterprise arrived in Alameda, California. 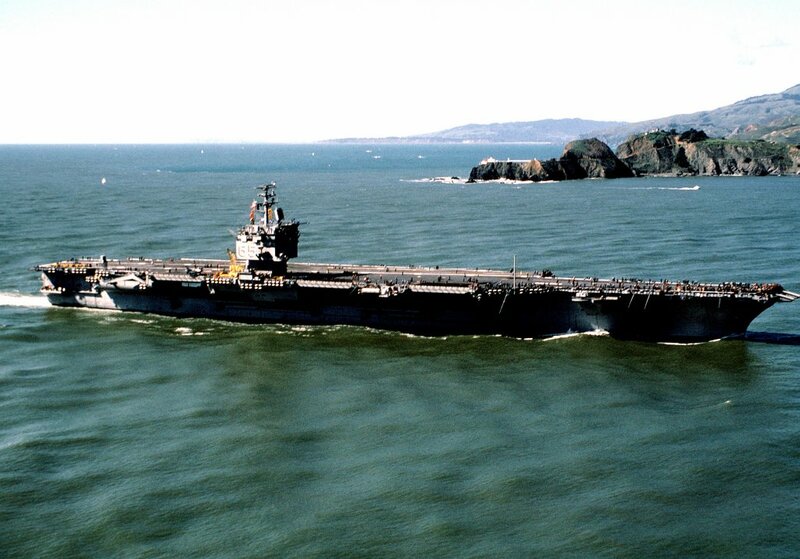 A starboard beam view of USS Enterprise (CVN-65) approaching the entrance to the San Francisco Bay, March 4, 1982. US Navy photo by PH3 Curt Fargo (DVIC id: DN-ST-82-05108). 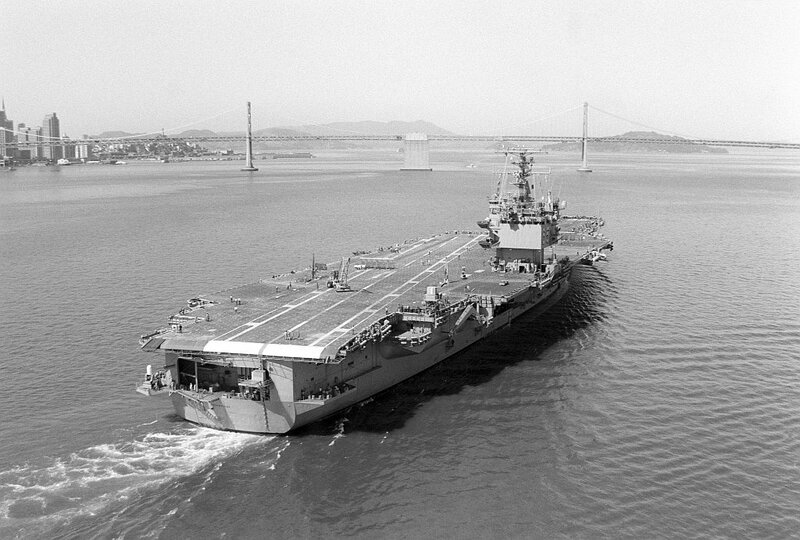 A starboard bow view of USS Enterprise (CVN-65), NAS Alameda, April 1982. 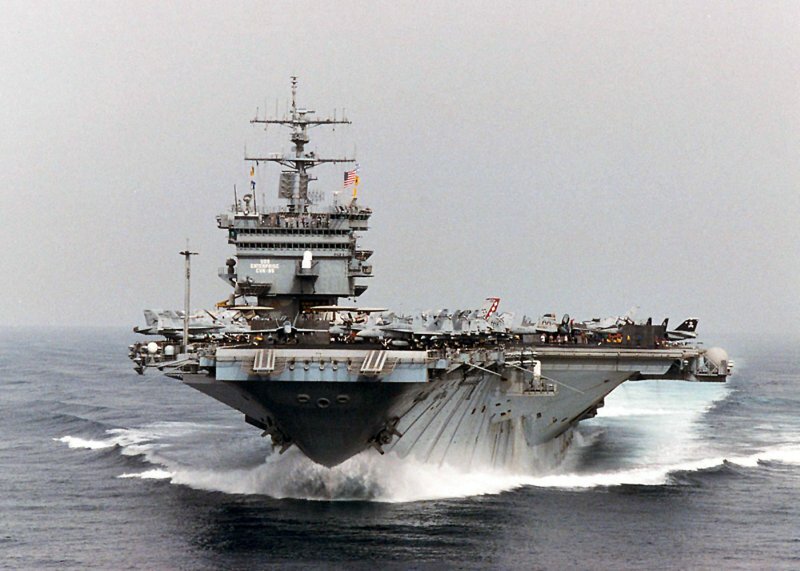 The nuclear-powered aircraft carrier had returned to port following a short cruise after the completion of renovations that included the rebuilding of the superstructure. US Navy photo by PHAN Kathy Moss (DVIC id: DN-ST-82-05733). 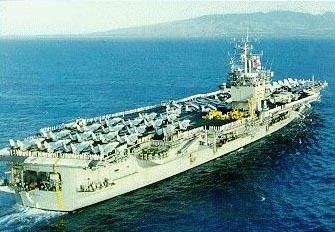 A high angle vertical view of USS Enterprise (CVN-65) underway in the Southern California Operations Area (SOCAL OPAREA), May 10, 1982. US Navy photo by PH3 Cabral (DVIC id: DN-SC-83-00345). 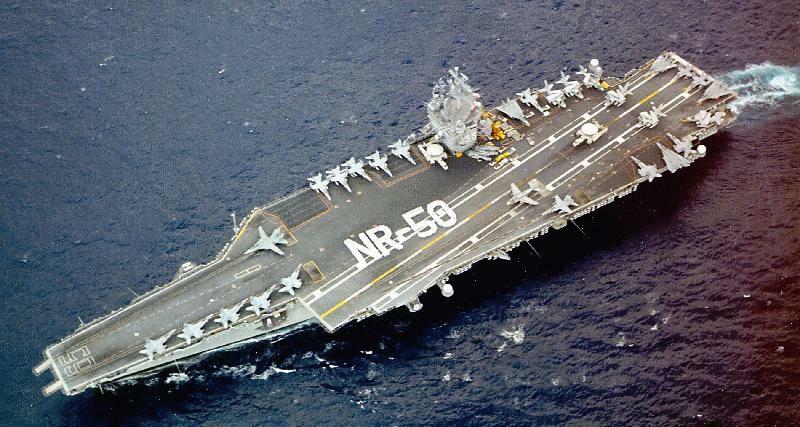 Aerial starboard quarter view of USS Enterprise (CVN-65) underway for a Western Pacific deployment, September 1, 1982. The San Francisco-Oakland Bay Bridge is visible in the background. US Navy photo by PHAN Watts (DVIC id: DN-SN-85-07563). 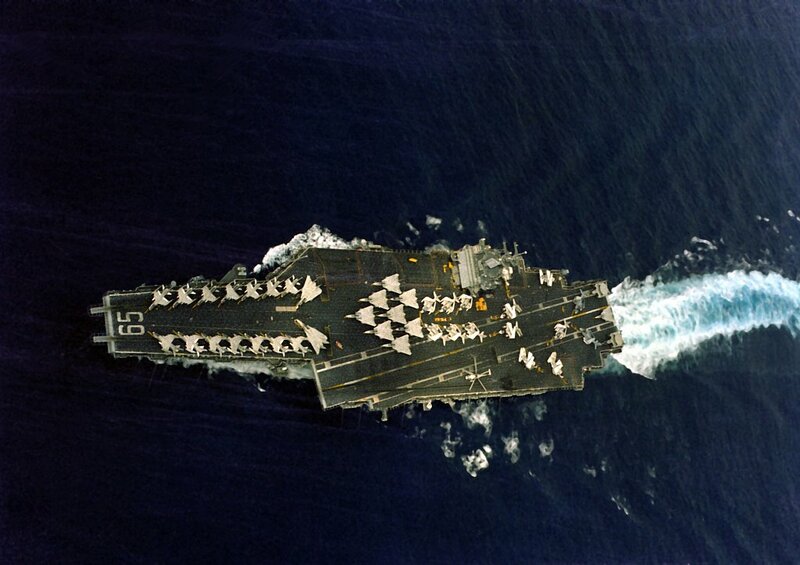 An aerial port bow view of USS Enterprise (CVN-65) underway for a Western Pacific deployment, September 1, 1982. The Golden Gate Bridge is visible in the background. US Navy photo by PHAN Watts (DVIC id: DN-SN-85-07559). An air-to-air right side view of a Medium Attack Squadron 95 (VA-95, "Green Lizards") A-6E Intruder, BuNo. 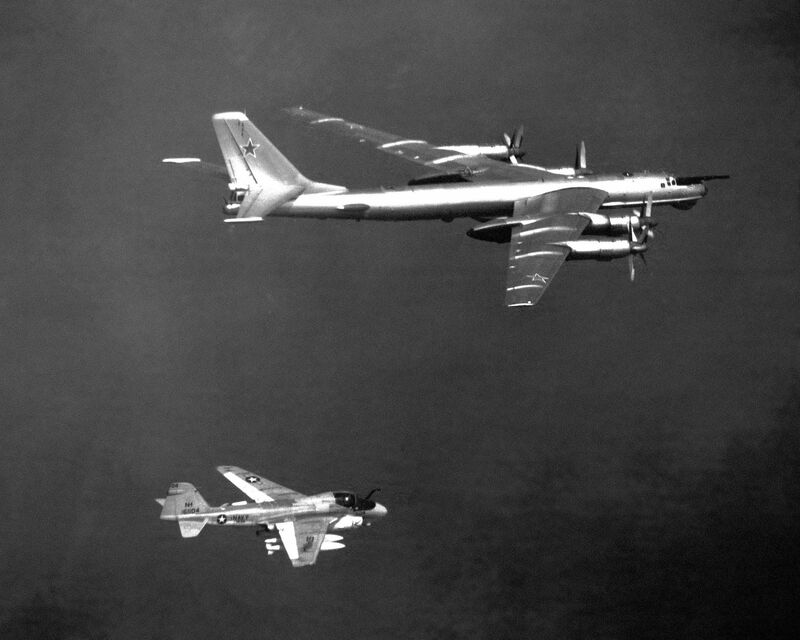 161104, assigned to USS Enterprise (CVN-65), escorting a Soviet Tu-142 Bear-D, October 1982. US Navy photo (DVIC id: DN-SN-84-03469). Aerial starboard side view of the nuclear-powered aircraft carrier USS Enterprise (CVN-65) and the aircraft carrier USS Midway (CV-41), background, underway with their task groups. The frigate USS Hepburn (FF-1055) is underway in the foreground. 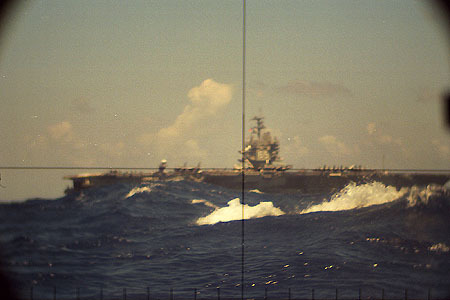 Pacific Ocean, October 1982. US Navy photo by PHAN Mellendorf (DVIC id: DN-SN-85-07596). 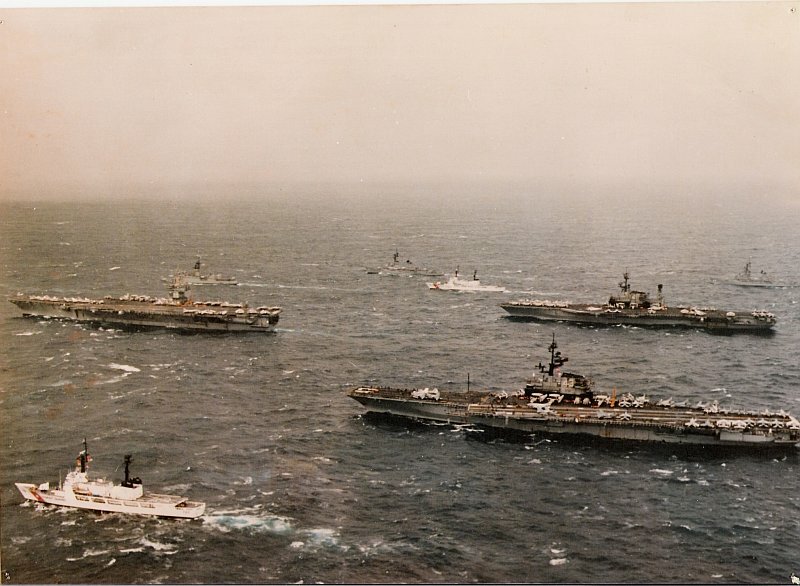 Photo taken on 13 April 1983, during exercise FleetEx 83-1, in the North Pacific Ocean. 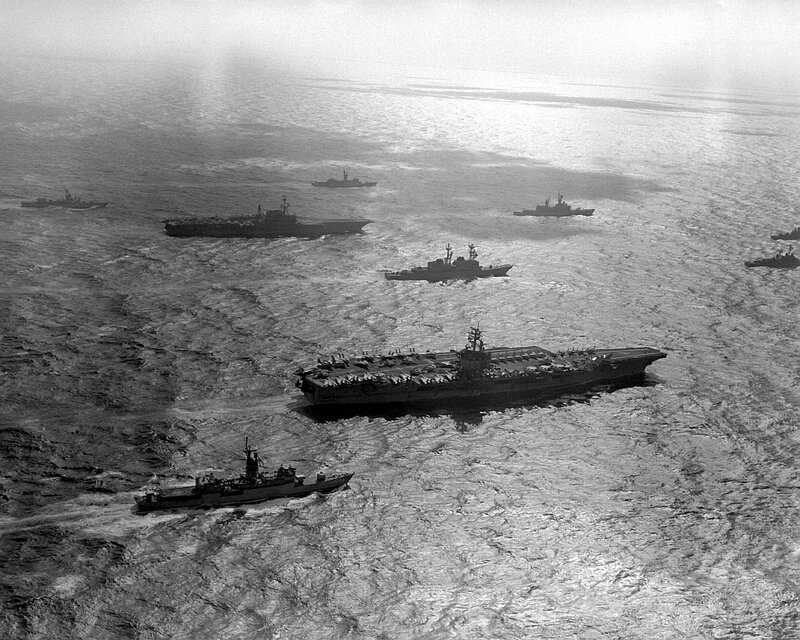 The three carriers are, clockwise from left, USS Enterprise (CVN-65), USS Midway (CV-41), and USS Coral Sea (CV-43). 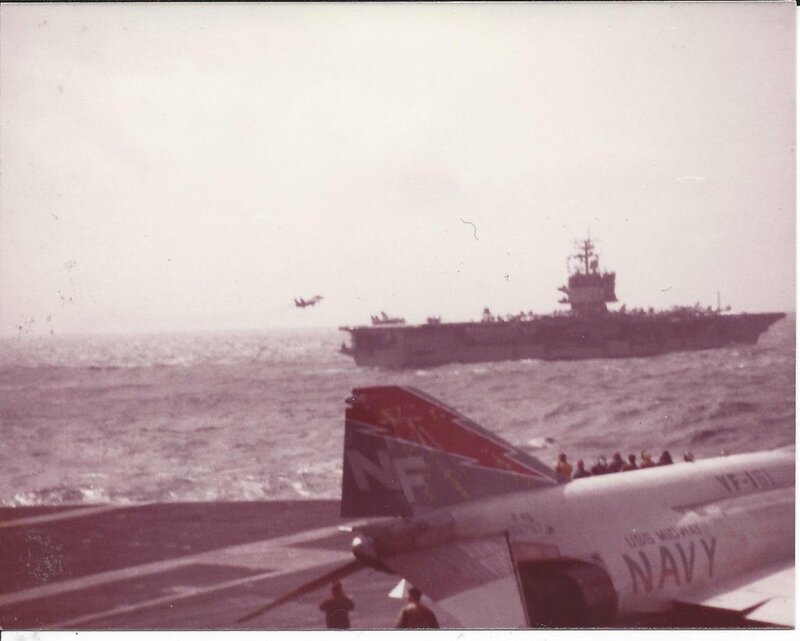 Then LT Jim Petroski was aboard the Big E in the Reactor Dept., as RC division officer, and comments: "I spent some time up on the signal bridge during this photo op and got some great pictures of aircraft flying over us. Our air wing was the only one which could fly that day as the sea was quite rough—wave splashes were coming over the hurricane bow—and neither the Coral Sea nor Midway could launch/recover a/c. The frigate to starboard of "E" went up to 1/2 under in the waves, and the Coast Guard cutter to port came about 2/3 out of water. Quite a sight that day." "The April 13 date sounds correct. We were crossing and re-crossing the international date line a lot at that time. So some days were 46 hours long, and others were 2 hours long. It was easy to forget what day it was!" F-14 Tomcat recovering aboard USS Enterprise (CVN-65), NORPAC 82, as seen from USS Midway (CV-41). 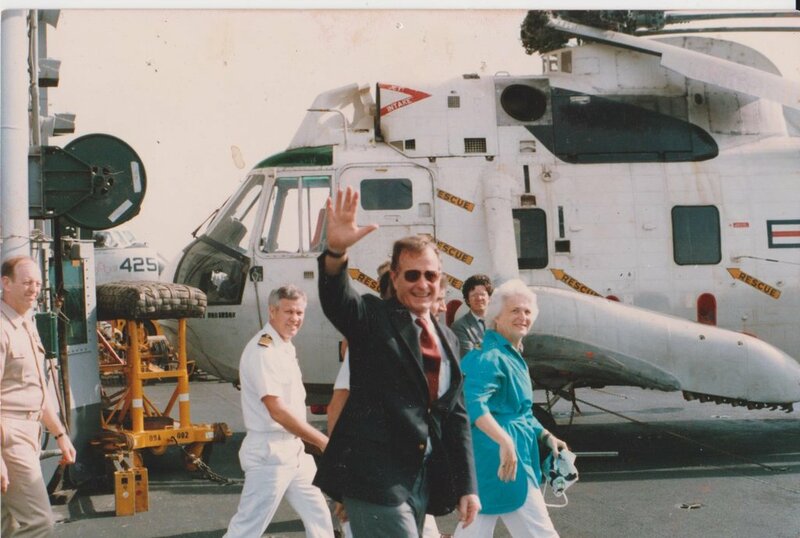 At Subic Bay Naval Base, 1984, during a liberty stop on her WestPac/Indian Ocean cruise. 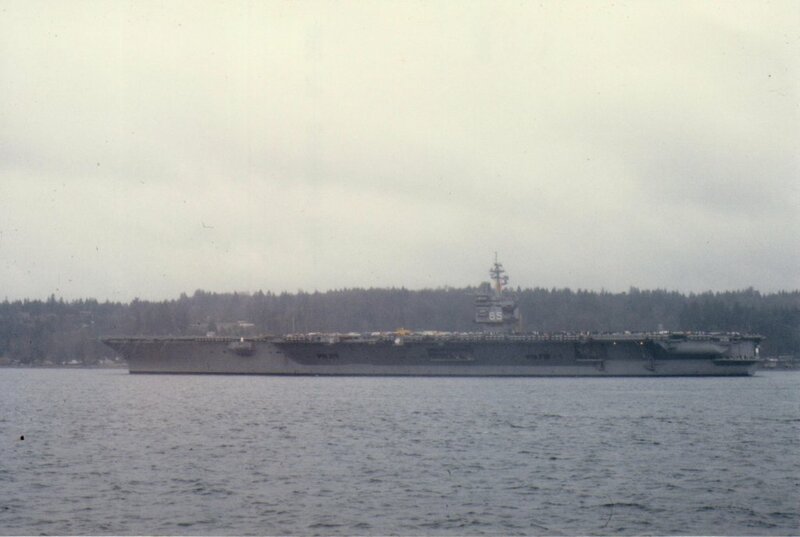 A stern view of USS Enterprise (CVN-65) as she departs Naval Air Station, North Island, California, in mid-January 1984. 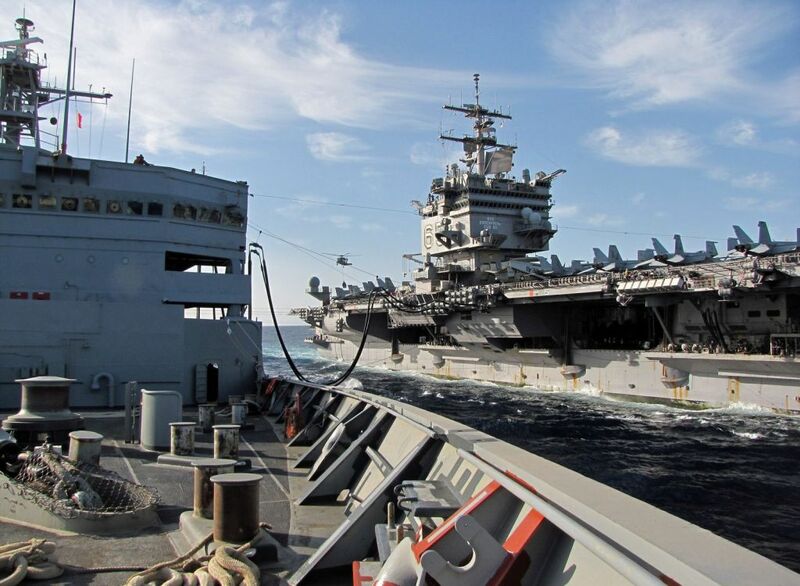 The nuclear-powered aircraft carrier and embarked Air Wing, Carrier Air Wing (CVW) 11, were conducting ship and air wing training operations at sea in the Southern California (SOCAL) area, in preparation for an upcoming deployment. U.S. Navy photo by PH1 Bennett (# DN-SC-85-07388). 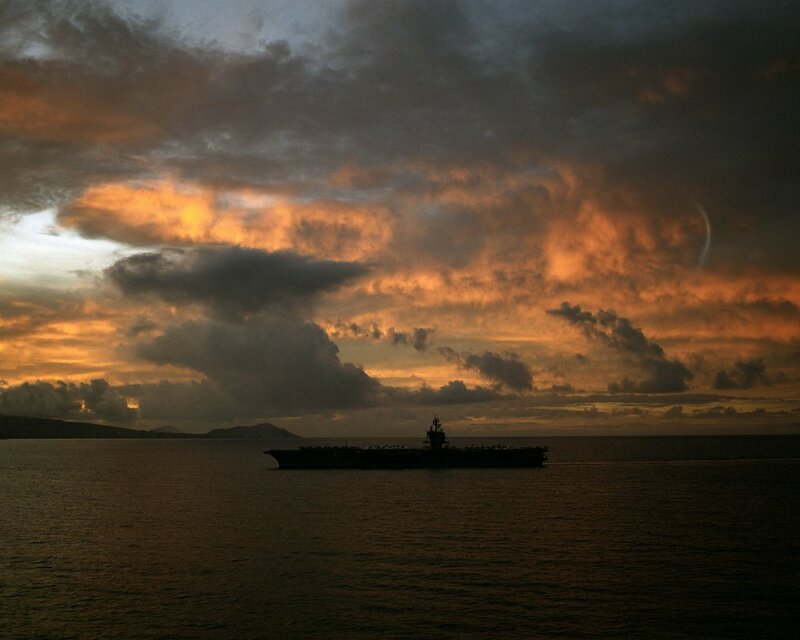 A silhouetted port beam view of the nuclear-powered aircraft carrier USS Enterprise (CVN-65) as she enters Pearl Harbor. U.S. Navy photo by PH1 Bennett. Available from Defense Imagery Management Operations Center (# DN-SC-85-07419). 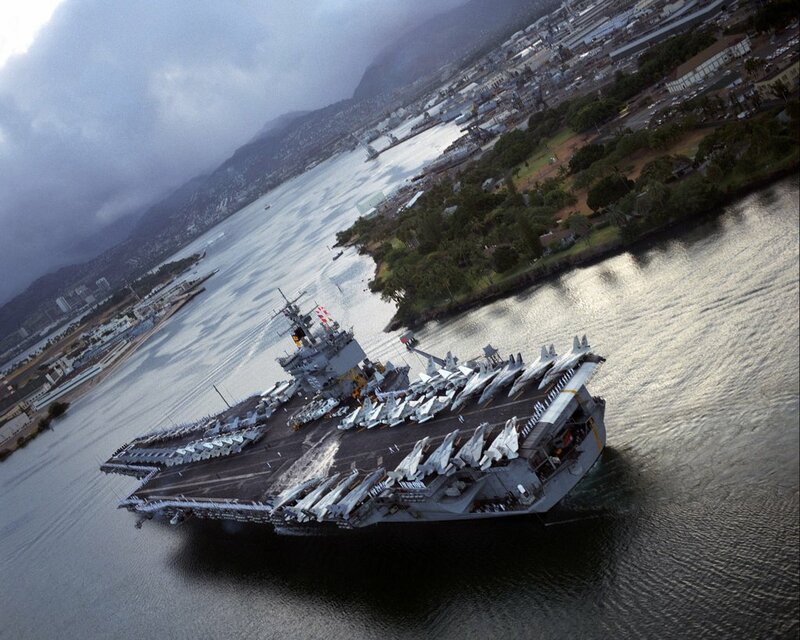 An aerial port bow view of the nuclear-powered aircraft carrier USS Enterprise (CVN-65) as she enters Pearl Harbor. Members of the crew man the rail. U.S. Navy photo by PH1 Bennett. Available from Defense Imagery Management Operations Center (# DN-SC-85-07423). 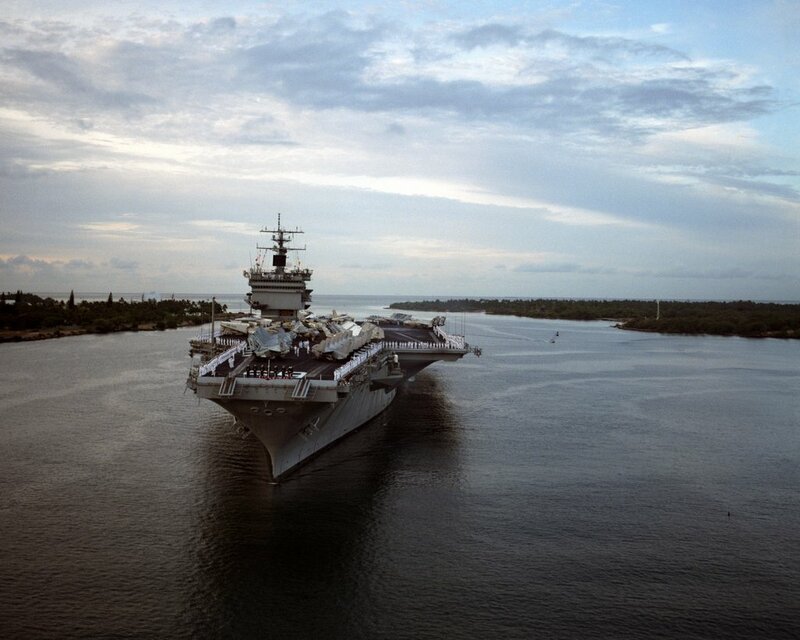 Aerial starboard quarter view of the nuclear-powered aircraft carrier USS Enterprise (CVN-65) as she enters Pearl Harbor. Members of the crew man the rail. U.S. Navy photo by PH1 Bennett. Available from Defense Imagery Management Operations Center (# DN-SC-85-07413). 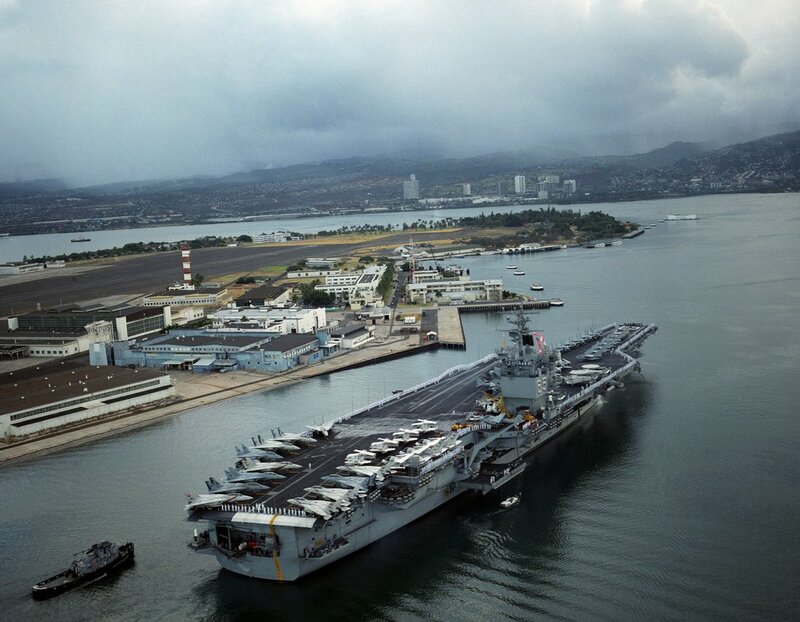 An aerial port view of the nuclear-powered aircraft carrier USS Enterprise (CVN-65) as she enters Pearl Harbor, 15 June 1984. Members of the ship's crew man the rail. U.S. Navy photo by PH1 Bennett. Available from Defense Imagery Management Operations Center (# DN-SC-85-07417). 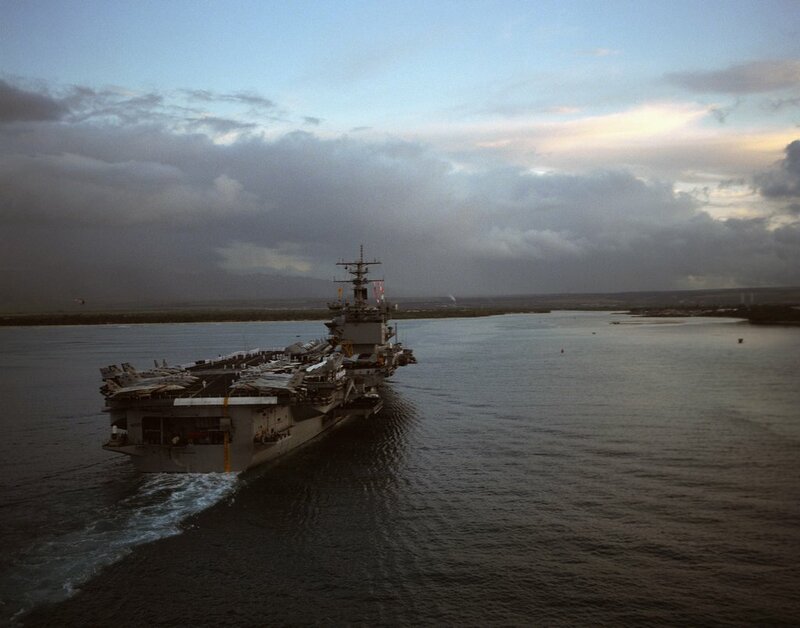 Aerial port bow view of the nuclear-powered aircraft carrier USS Enterprise (CVN-65) as she enters Pearl Harbor. Members of the crew man the rail. U.S. Navy photo by PH1 Bennett. Available from Defense Imagery Management Operations Center (# DN-SC-85-07429). 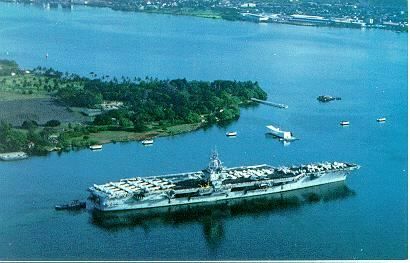 An aerial starboard quarter view of the nuclear-powered aircraft carrier USS Enterprise (CVN-65) as she enters Pearl Harbor. Visible in the background is the USS Arizona Memorial. Members of the crew man the rail. U.S. Navy photo by PH1 Bennett. Available from Defense Imagery Management Operations Center (# DN-SC-85-07415). 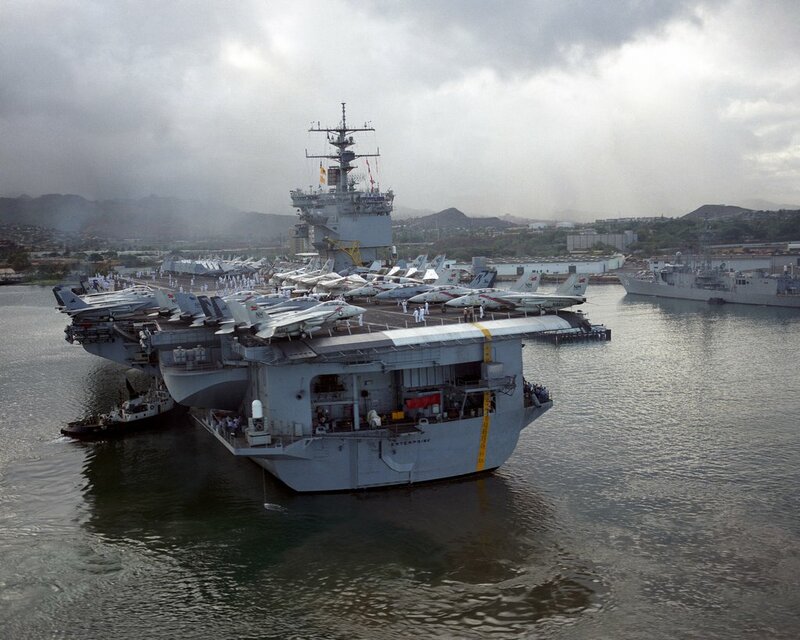 A stern view of the nuclear-powered aircraft carrier USS Enterprise (CVN-65), with embarked Carrier Air Wing (CVW) 11, as a harbor tug assists her into her berth at Pearl Harbor. Guided missile frigate USS Reid (FFG-30) is on the right background. U.S. Navy photo by PH1 Bennett. Available from Defense Imagery Management Operations Center (# DN-SC-85-07427). 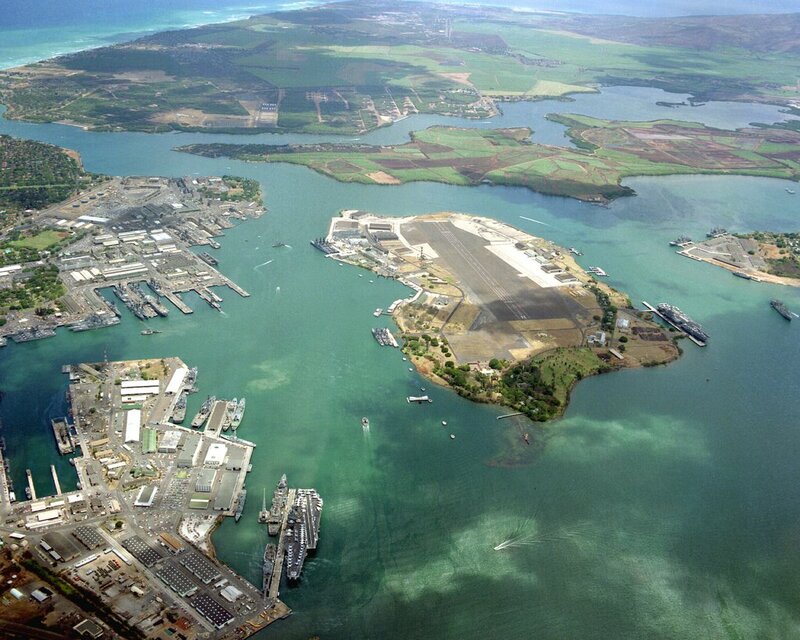 Aerial view of Pearl Harbor with the nuclear-powered aircraft carrier USS Enterprise (CVN-65) visible, center. The Nimitz-class, nuclear-powered aircraft carrier USS Carl Vinson (CVN-70) is on the far side of Ford Island, and the amphibious assault ship USS Peleliu (LHA-5) on the bottom left of the photo. U.S. Navy photo by PH1 Bennett. Available from Defense Imagery Management Operations Center (# DN-SC-85-07394). 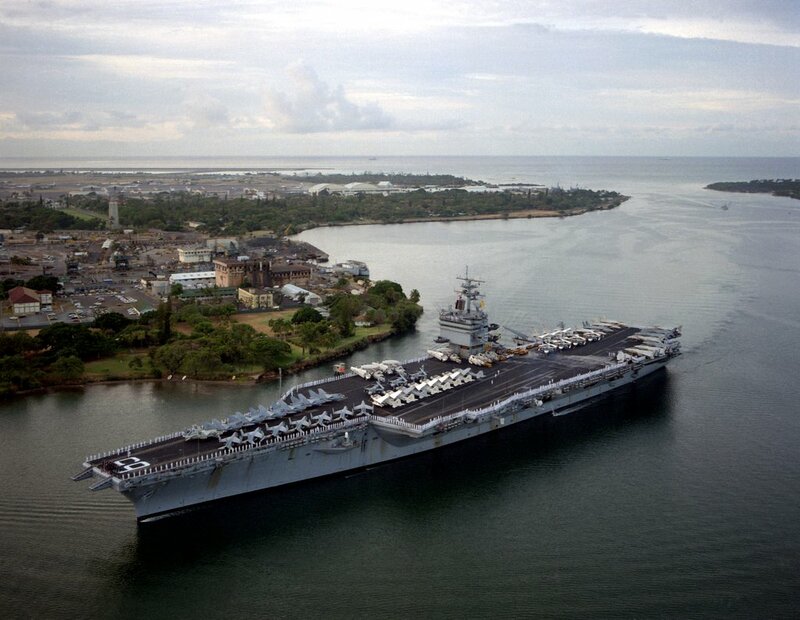 Aerial port side view of the nuclear-powered aircraft carrier USS Enterprise (CVN-65) berthed at Pearl Harbor. 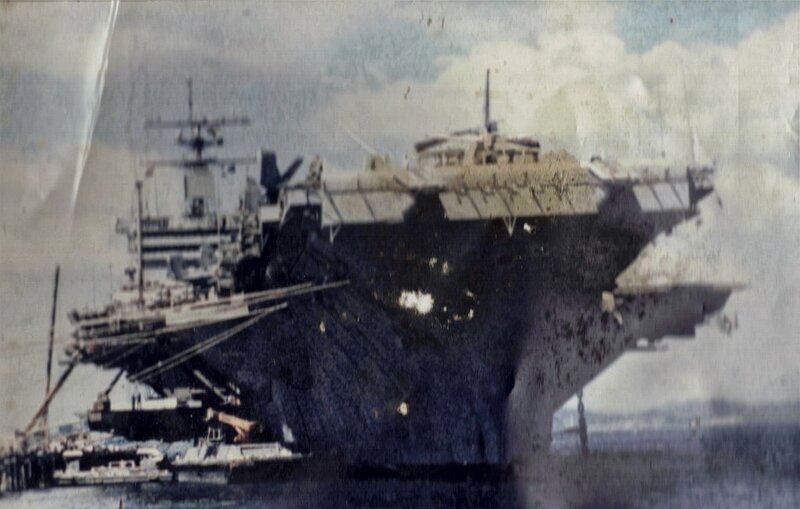 Tank landing ship USS Schenectady (LST‑1185) is partially visible beyond the Big E's bow. U.S. Navy photo by PH1 Bennett. Available from Defense Imagery Management Operations Center (# DN-SC-85-07398). 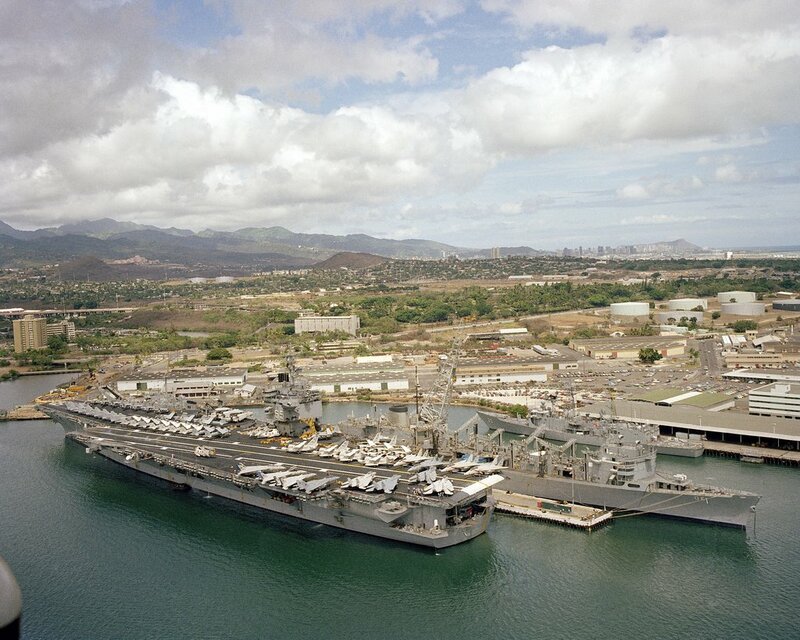 Aerial port quarter view of the nuclear-powered aircraft carrier USS Enterprise (CVN-65) berthed at Pearl Harbor. Moored nearby are the fast combat support ship USS Sacramento (AOE-1) and the guided-missile frigate USS Reid (FFG-30). U.S. Navy photo by PH1 Bennett. Available from Defense Imagery Management Operations Center (# DN-SC-85-07399). 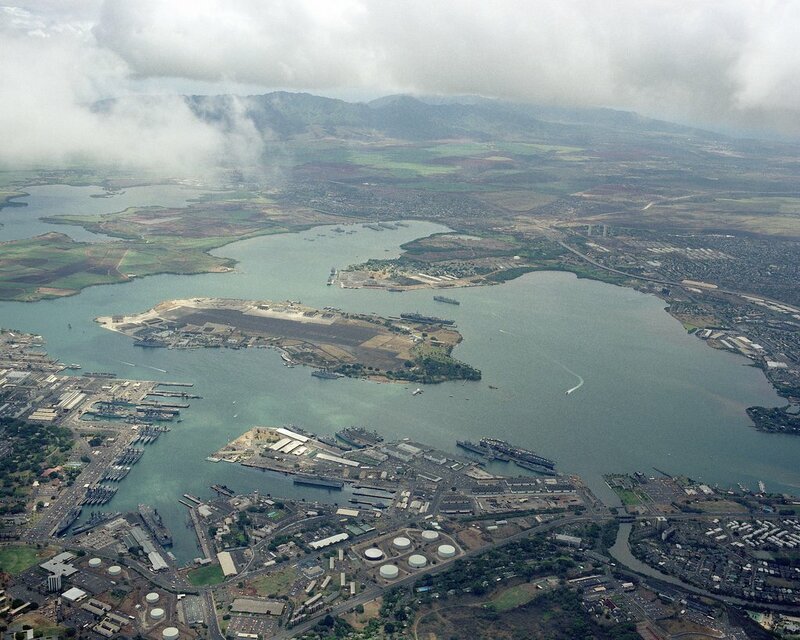 An aerial view of Pearl Harbor with the nuclear-powered aircraft carrier USS Enterprise (CVN-65) visible to the left, bottom, and the nuclear-powered aircraft carrier USS Carl Vinson (CVN-70) visible to the right. U.S. Navy photo by PH1 Bennett. Available from Defense Imagery Management Operations Center (# DN-SC-85-07404). 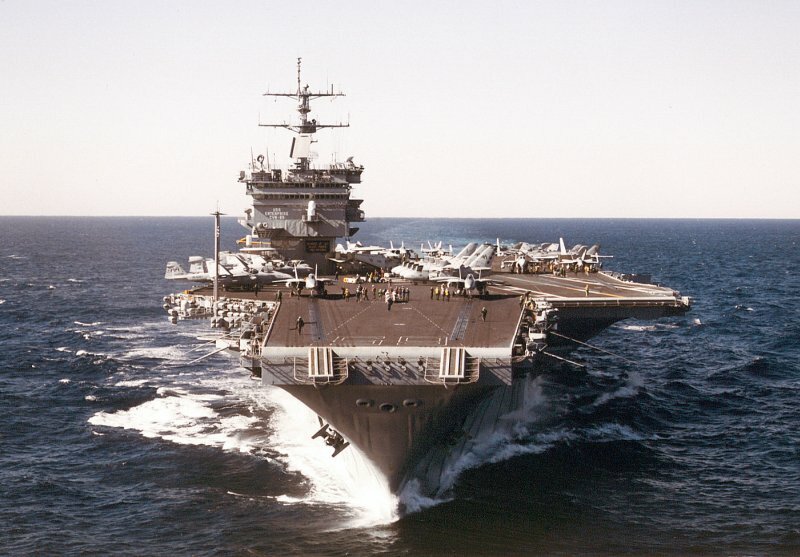 Bow on view of USS Enterprise (CVN-65) underway, with Carrier Air Wing (CVW) 11 embarked, possibly circa 1985. 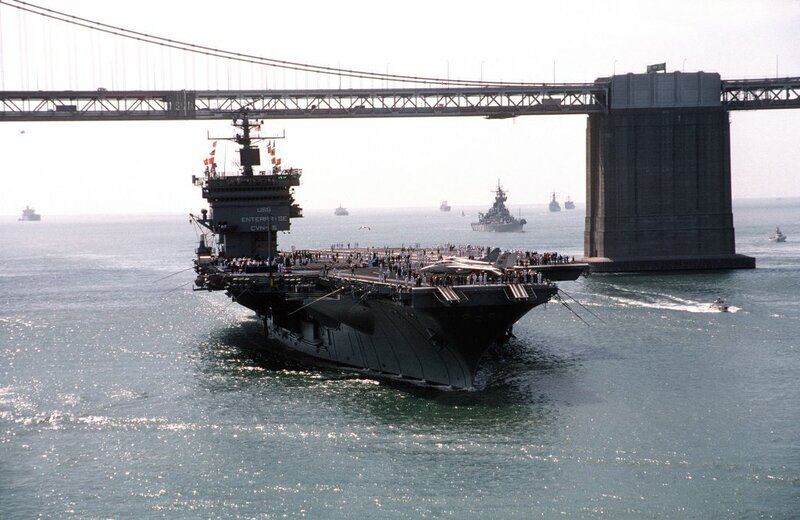 Aerial starboard bow view of USS Enterprise (CVN-65) passing under the San Francisco Bay Bridge, August 14, 1985. In the background is the battleship USS New Jersey (BB-62). The ships were taking part in the Peace in the Pacific celebration being held in commemoration of the 40th anniversary of the end of the war with Japan. US Navy photo by PHC John Kristofferson (DVIC id: DN-ST-85-10658). 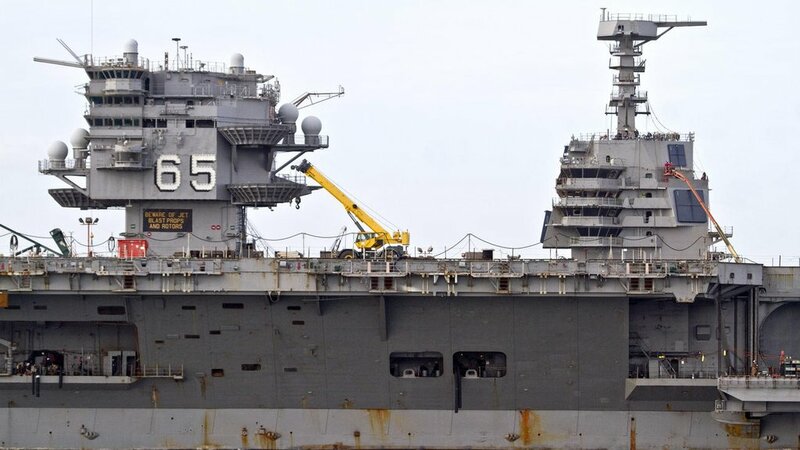 USS Enterprise (CVN-65) being eased into Hunters Point Navy Yard Dry Dock No. 4, 28 November 1985. Library of Congress photo, id. : HAER CAL,38-SANFRA,195A-21. Dry dock No. 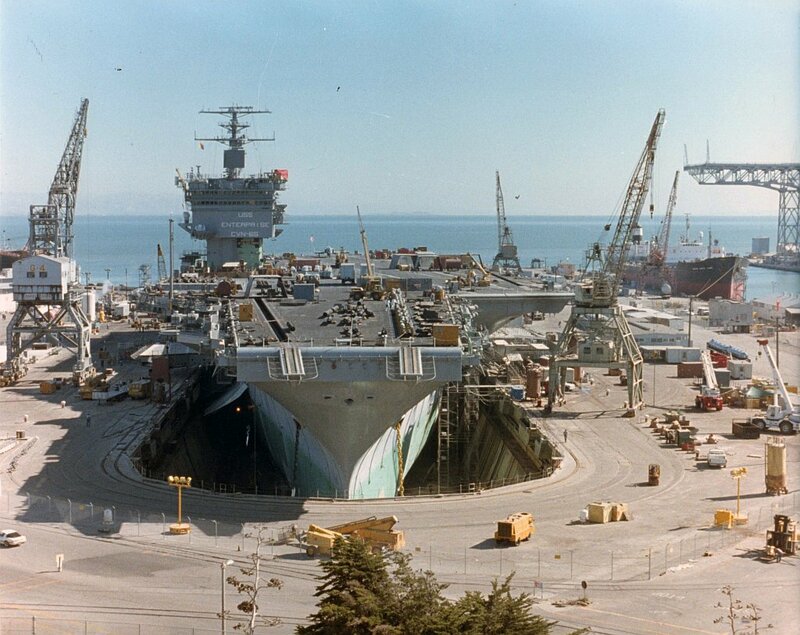 4 at Hunters Point Navy Yard being pumped out, 28 November 1985. 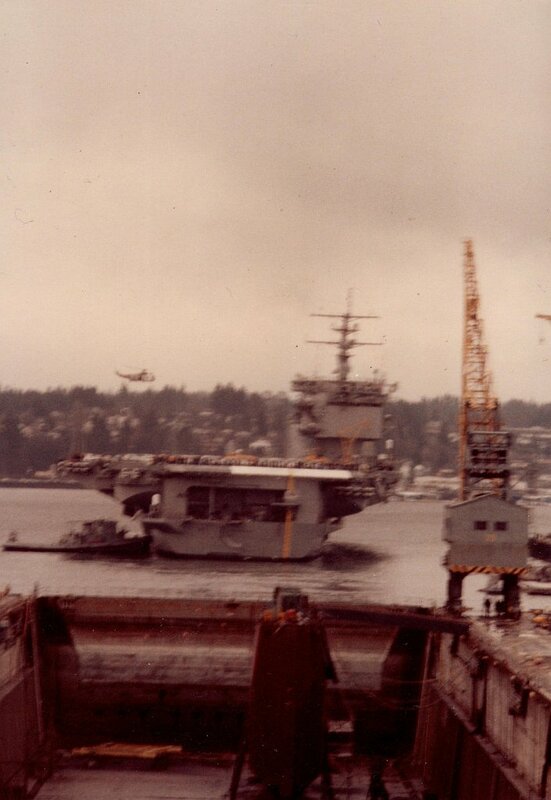 USS Enterprise (CVN-65) is positioned over the keel blocks as the dock is being emptied. Library of Congress photo, id. : HAER CAL,38-SANFRA,195A-22. 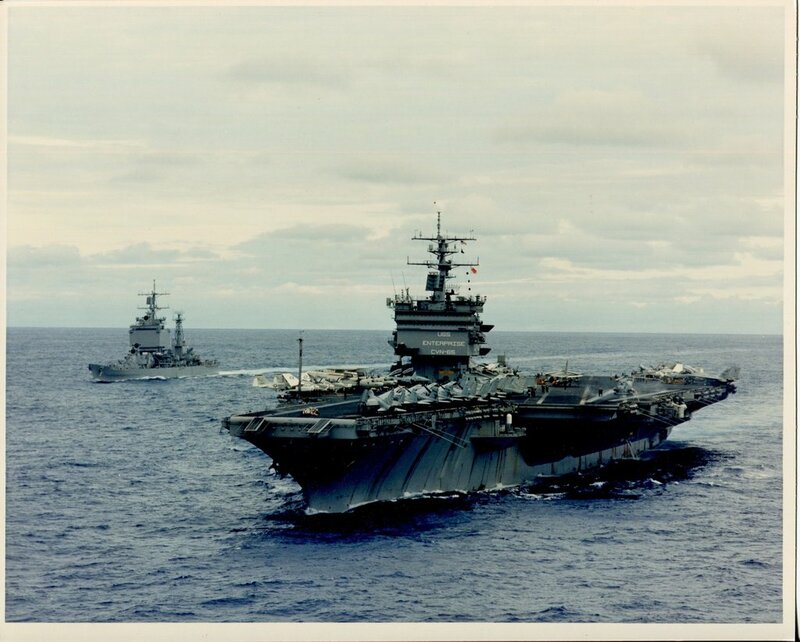 USS Enterprise (CVN-65), with Carrier Air Wing (CVW) 11 embarked, steaming in company with the nuclear-powered guided-missile cruiser USS Long Beach (CGN-9), possibly circa 1986. 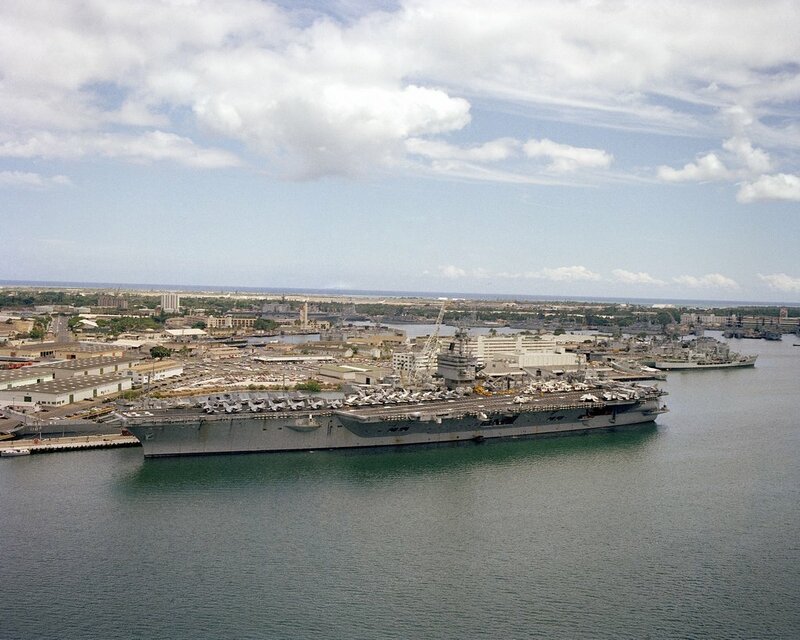 A port view of the nuclear-powered aircraft carrier USS Enterprise (CVN-65) departing Pearl Harbor, 2 February 1986. 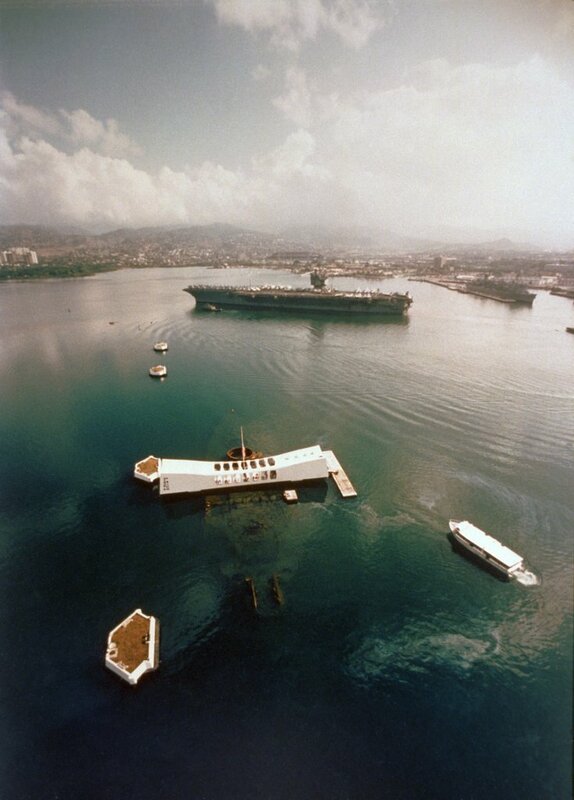 The Arizona Memorial is in the foreground. Department of Defense photo (# DN-SC-86-06730), courtesy of Hughes Aircraft. 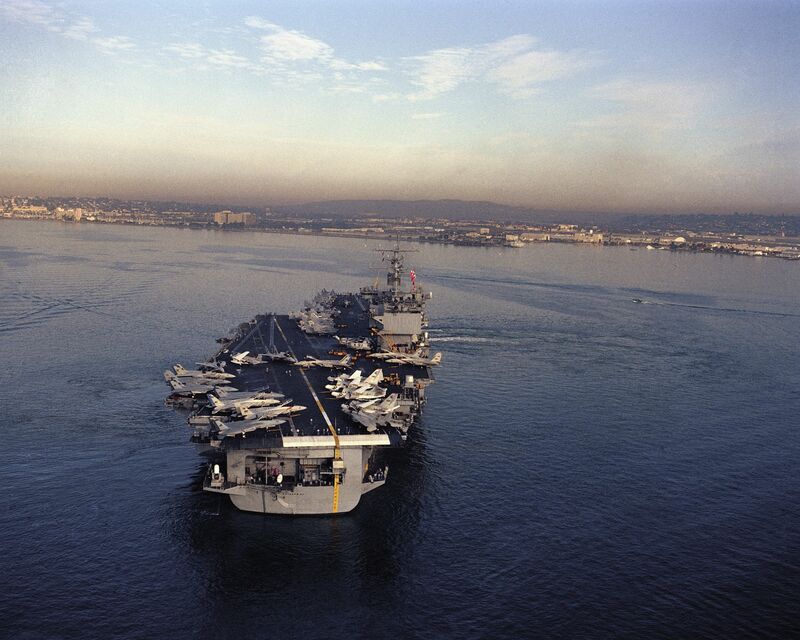 A starboard bow view of the nuclear-powered aircraft carrier USS Enterprise (CVN-65) departing Pearl Harbor, 2 February 1986, with Carrier Air Wing (CVW) 11. Several large tugs are maneuvering around the carrier. USS Hewitt (DD-966) is in the background. Department of Defense photo (# DN-SC-86-06733), courtesy of Hughes Aircraft. 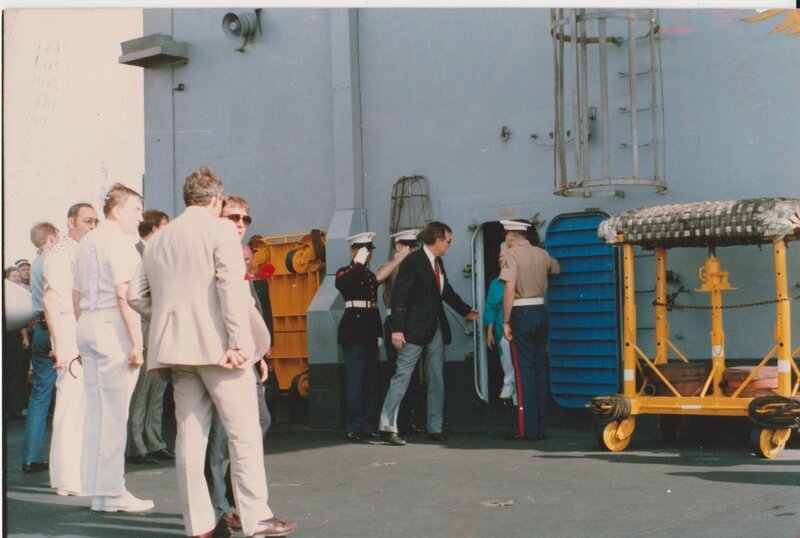 "[S]ome pictures I took in [April] 1986 during George Bush's visit to the USS Enterprise while he was Vice President. The pics [were] taken with a Nikon 35mm camera. These photographs were taken off of the Gulf of Oman just prior to our participation in Operation Eldorado Canyon in 1986." 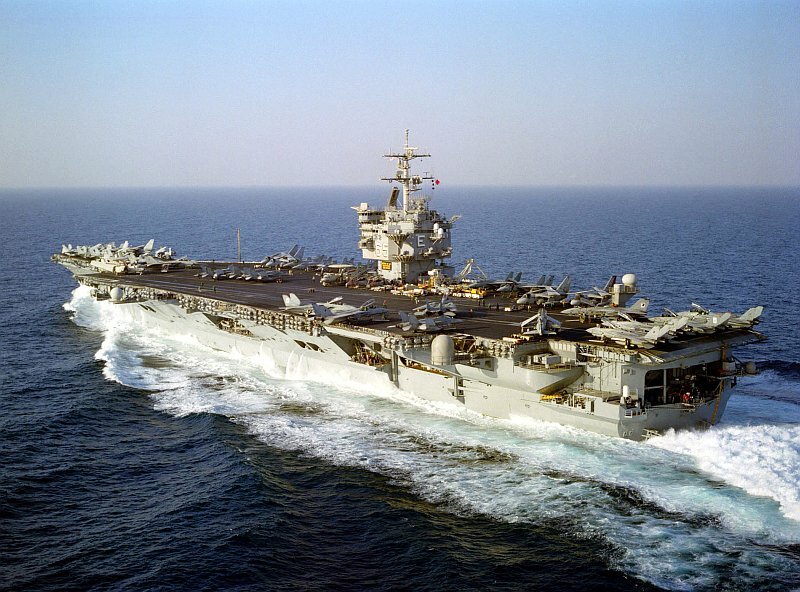 USS Enterprise (CVN-65) with Carrier Air Wing (CVW) 11, Toulon, France, 30 May–9 June 1986. 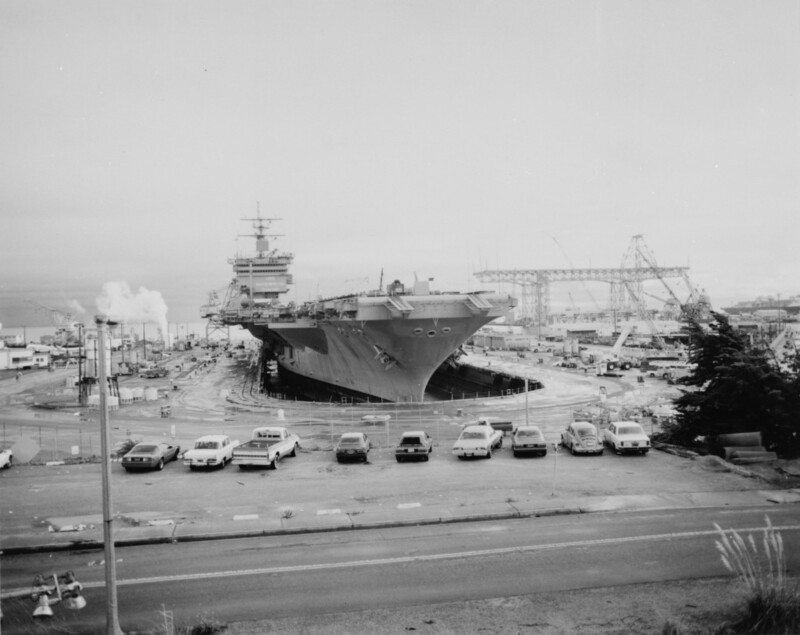 USS Enterprise (CVN-65) is seen in dry dock #4 at the former Hunters Point Naval Shipyard. 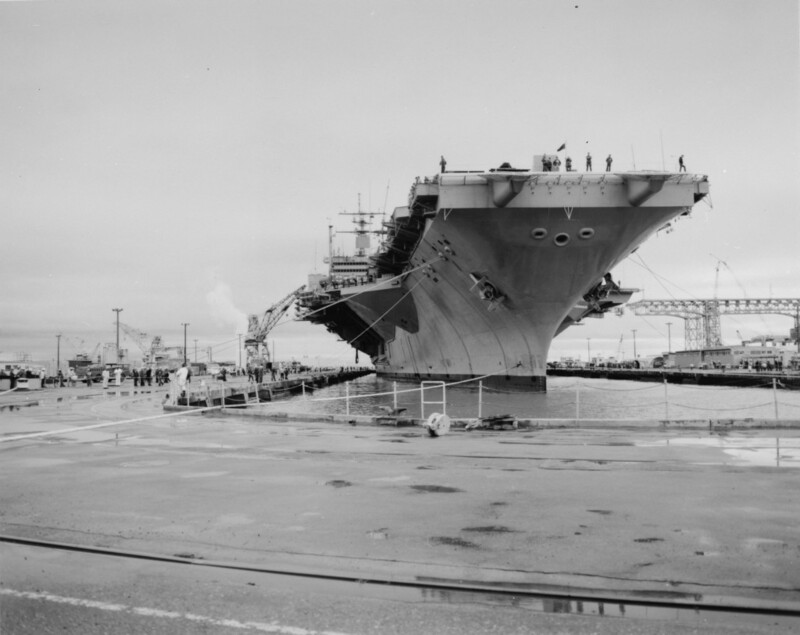 Mare Island Naval Shipyard was using the dry dock to maintain carriers homeported in the San Francisco Bay area at this time. U.S. Navy photo, November 1986, file name CVN 65 217505-11-86. A very curious photograph taken in Singapore in late December 1989. 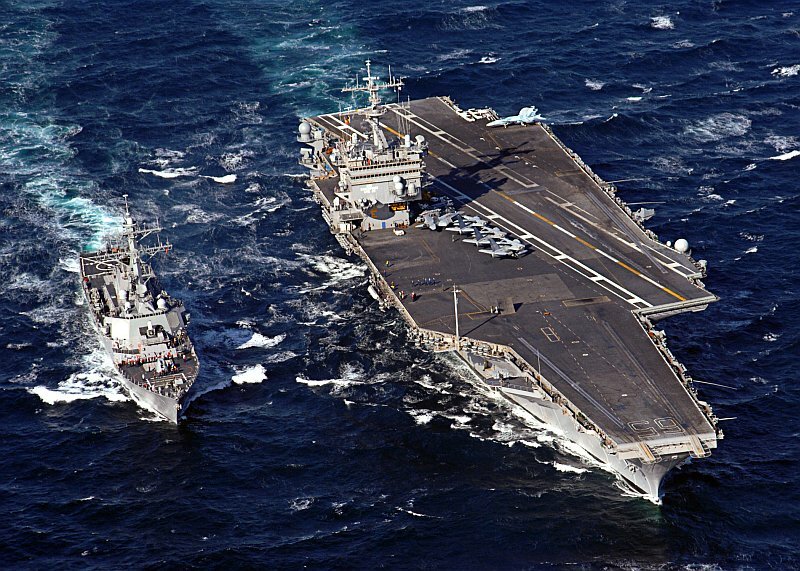 There's an aircraft carrier, USS Enterprise (CVN-65), but the boxy "island" structure does not belong to the Big E, but to the nuclear-powered guided missile cruiser USS Long Beach (CGN-9)—you have to look closely to discern her!. Just to the right of the carrier, in the background, is the battleship USS New Jersey (BB-62) and, further right, a Ticonderoga-class guided missile cruiser, possibly USS Lake Champlain (CG-57). Long Beach, New Jersey and Lake Champlain were part of Battle Group Romeo, led by the battleship. 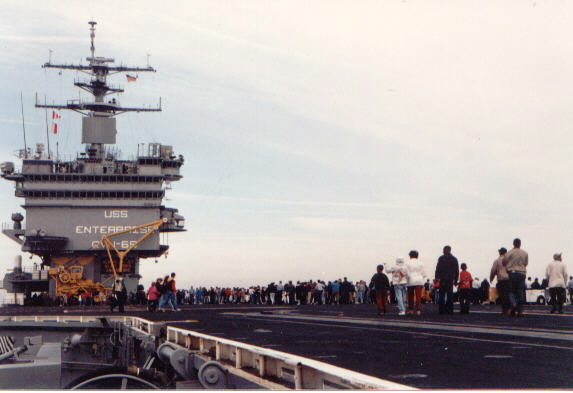 USS Enterprise (CVN-65) underway, probably in the 1990s. This photograph was received in 1998. Official U.S. Navy photograph, from the collections of the Naval History and Heritage Command (# NH 106551-KN). 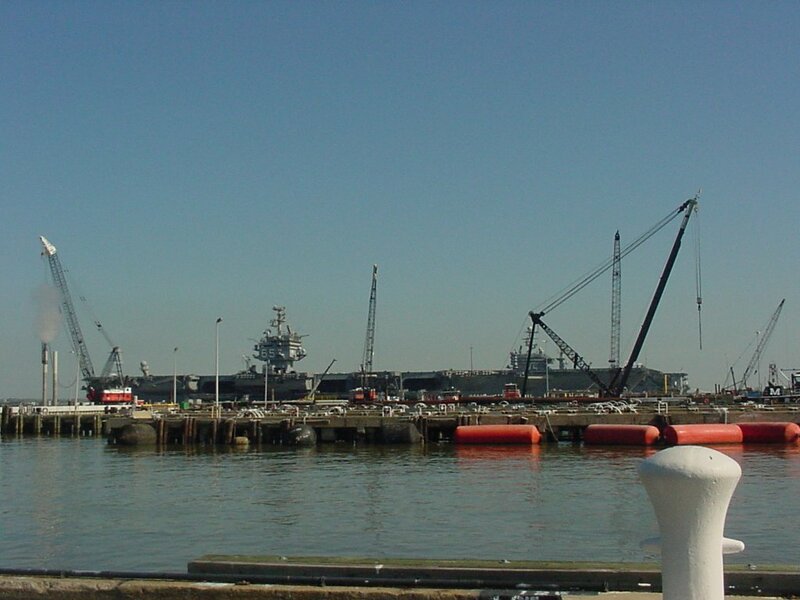 A stern view of USS Enterprise (CVN-65) undergoing overhaul at the Newport News Shipbuilding and Dry Dock Corporation dry dock 11 on the James River. Newport News, VA, June 29, 1991. Photo by Don S. Montgomery, USN (Ret.) (DVIC id: DN-SC-92-01234). NS026528 33k At the pier in Norfolk, Virginia, in the 1990s. Carroll W. Goss, OS1 (SW) Ret. 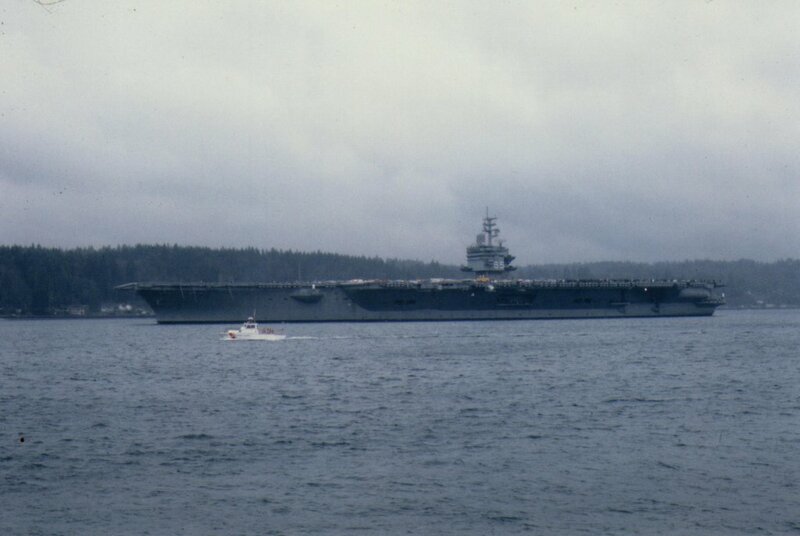 USS Enterprise (CVN-65) steams in the Virginia Capes operating area during carrier qualifications, December 11, 1995. U.S. Navy photo by Photographer's Mate Airman Nicholas H. Griseto (# 951211-N-4700G-002). 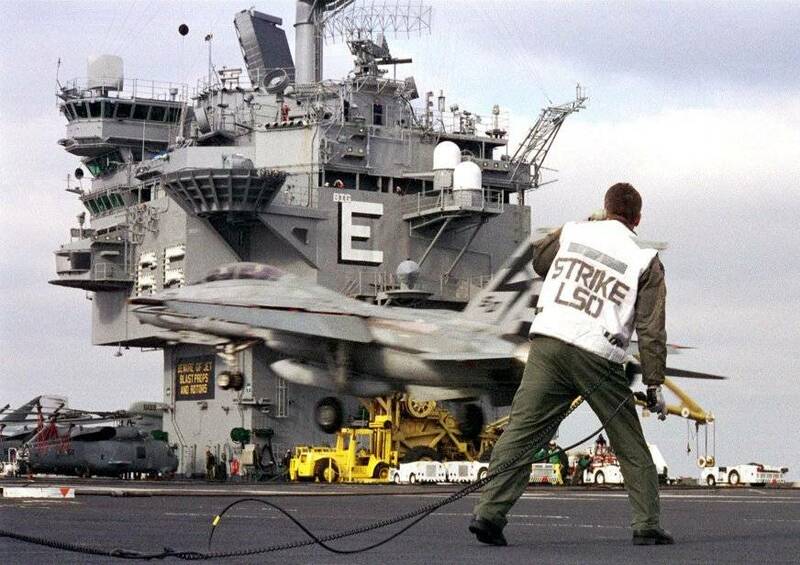 "Catapult Intruder," air operations aboard USS Enterprise (CVN-65) in the mid-1990s. Artwork © by Alan Craddock, used with permission. 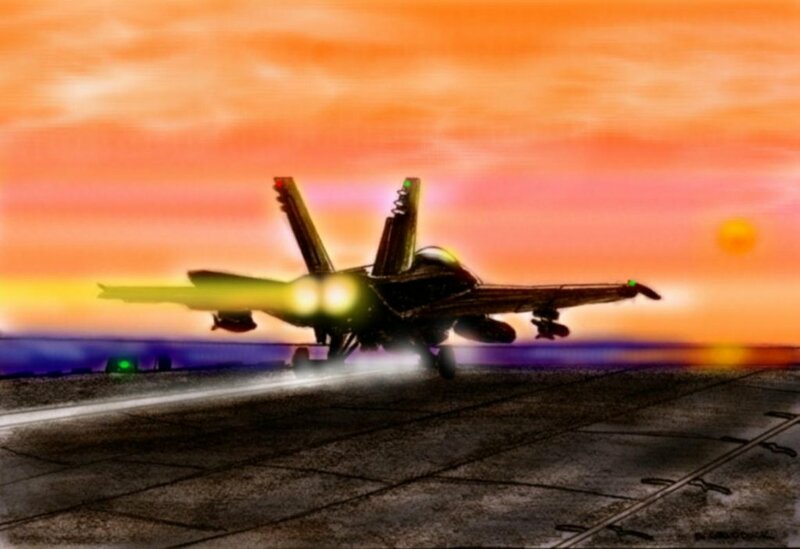 An F/A-18 leaving the deck of USS Enterprise (CVN-65) just on sunset, for a night sortie. 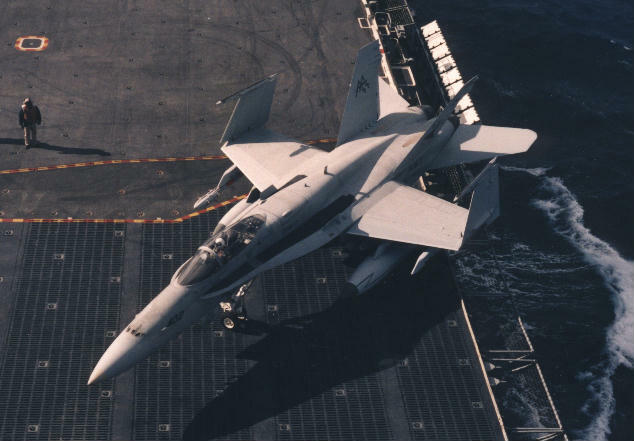 The first Hornets to deploy with Enterprise were those of VFA-81 "Sunliners" and VFA-83 "Rampagers," part of Carrier Air Wing 17 (CVW-17) during Big E's June–December 1996 cruise. Artwork © by Alan Craddock, used with permission. An F/A-18C Hornet from Strike Fighter Squadron Eight One (VFA-81) "Sunliners" aboard USS Enterprise (CVN-65), circa 1996. An A-6 Intruder aircraft assigned to the "Sunday Punchers" of Attack Squadron Seven Five (VA-75) makes ready for launch from the number one catapult, during carrier qualifications aboard the US Navy's nuclear powered aircraft carrier USS Enterprise (CVN 65), 27 April 1996. The Big E was participating in Combined Joint Task Force Exercise '96 (CJTFX '96), as part of a multinational force of over 50,000 Soldiers, Sailors, Airmen and Marines from Canada, Britain and the United States. Photo by Mike Corrado, USN Civ. (# 960427-N-0000C-008 and DN-SD-01-09770). 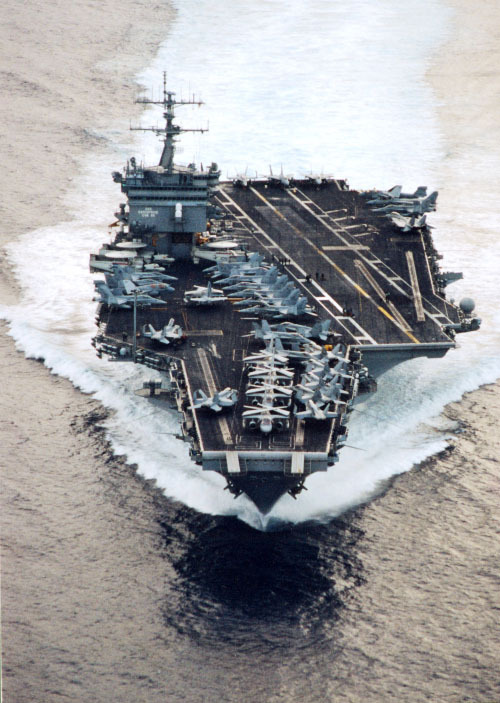 USS Enterprise (CVN-65) underway in the Persian Gulf, September 22, 1996, while in support of Operation Southern Watch and the extended no-fly zone over Iraq. 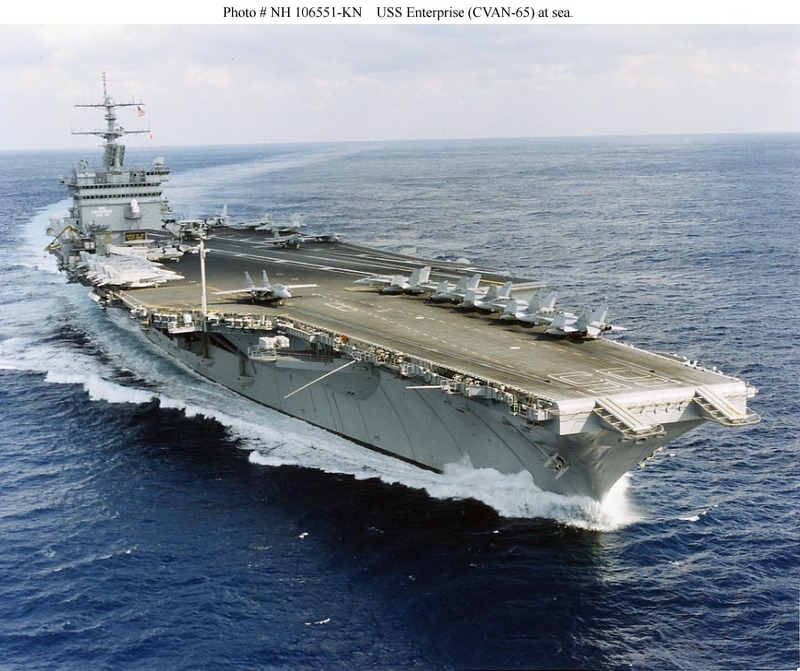 Enterprise, under the command of Captain Michael D. Malone, arrived in the Gulf September 19, 1996, to join forces with the carrier USS Carl Vinson (CVN-70) already on patrol. This action was approved by the President following Saddam Hussein's military action above Iraq's 36th parallel, and subsequent strikes by Navy and Air Force air- and surface-launched cruise missiles, under operation Desert Strike. U.S. Navy Photo by Photographer's Mate Second Class Matthew Hostetler (# 960922-N-7968H-010). 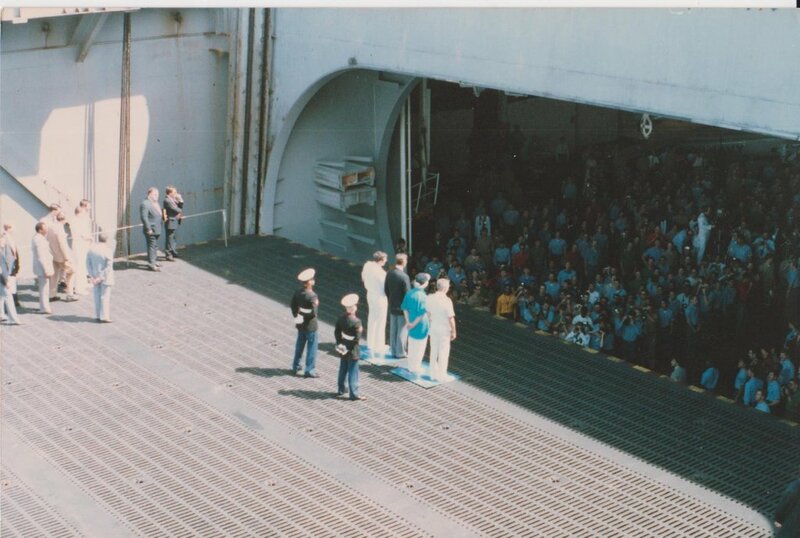 Celebrating the 50th birthday of the Navy's nuclear reactor community, sailors spell out "NR-50" on the flight deck of USS Enterprise (CVN-65), 24 April 1998, in the Virginia Capes Operating Area. U.S. Navy photo. NS026529 73k An SH-60 Seahawk helicopter assigned to Helicopter Anti-Submarine Squadron Seven (HS-7) hovers off the bow of the aircraft carrier USS Enterprise (CVN 65). 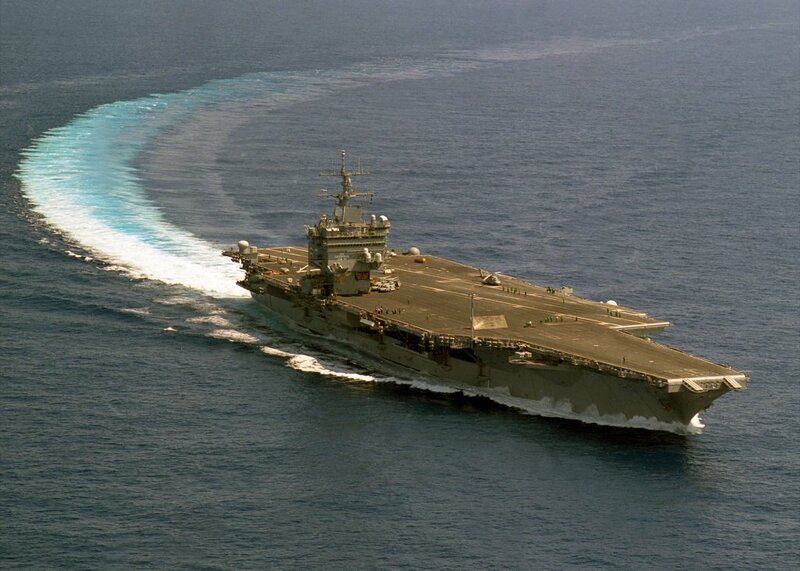 The Persian Gulf, December 17, 1998  USS Enterprise (CVN-65) steams to the southern end of her operating area the morning after the first wave of air strikes on Iraqi targets. The operation, Operation Desert Fox, was launched after Iraq failed to comply with UN resolutions regarding UNSCOM weapons inspections. U.S. Navy photo by Photographer's Mate 1st Class Todd Cichonowicz (# 981217-N-8492C-012). 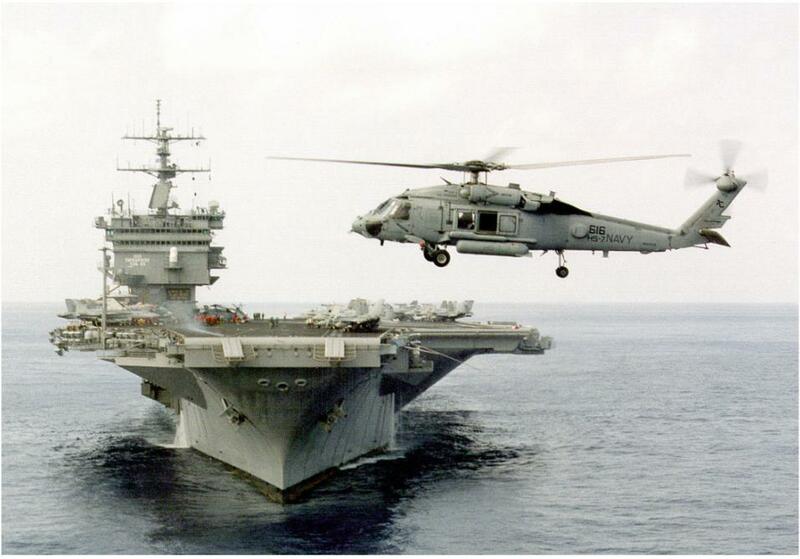 Underway with Carrier Air Wing Three (CVW-3) aboard, circa 1998-1999. 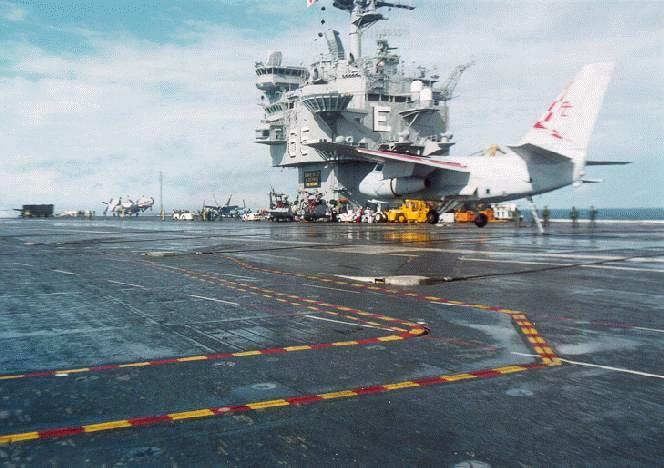 S-3B Viking, Sea Control Squadron (VS) 22 "Checkmates," Carrier Air Wing (CVW) 3, recovering aboard USS Enterprise (CVN-65), circa 1998–1999. 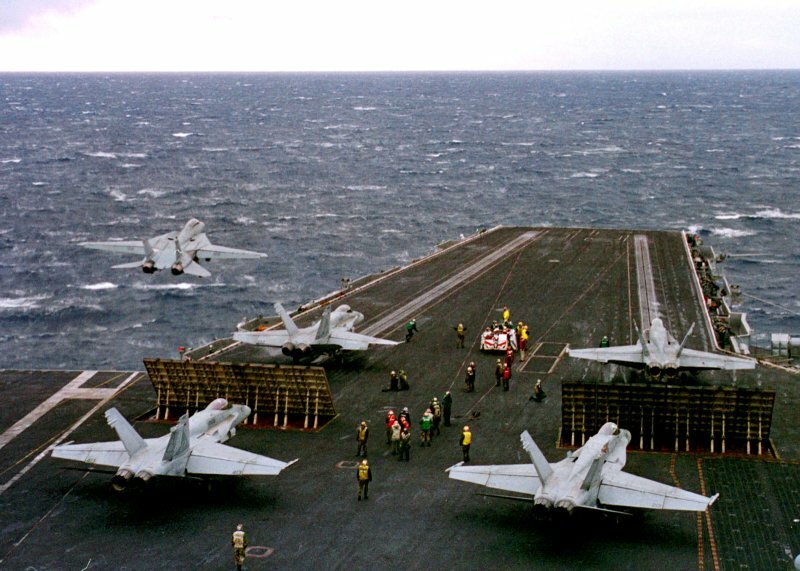 Four F/A-18C Hornets wait to launch from the bow catapults of USS Enterprise (CVN-65), February 23, 1999, as an F-14B Tomcat launches from the waist catapult. 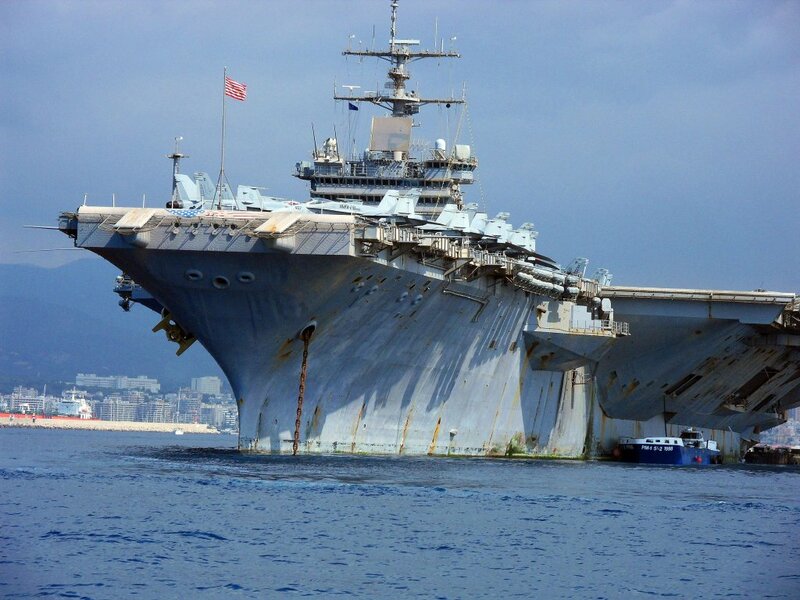 Enterprise was deployed to the Adriatic Sea to support NATO decisions concerning Kosovo. DoD photo by Petty Officer 1st Class Benjamin D. Olvey, U.S. Navy (# 990223-N-4004O-002). Steam rises from the number one catapult aboard USS Enterprise (CVN-65), as an F/A-18C Hornet climbs into the sky and another F/A-18C, from VFA-105 "Gunslingers," awaits its turn. 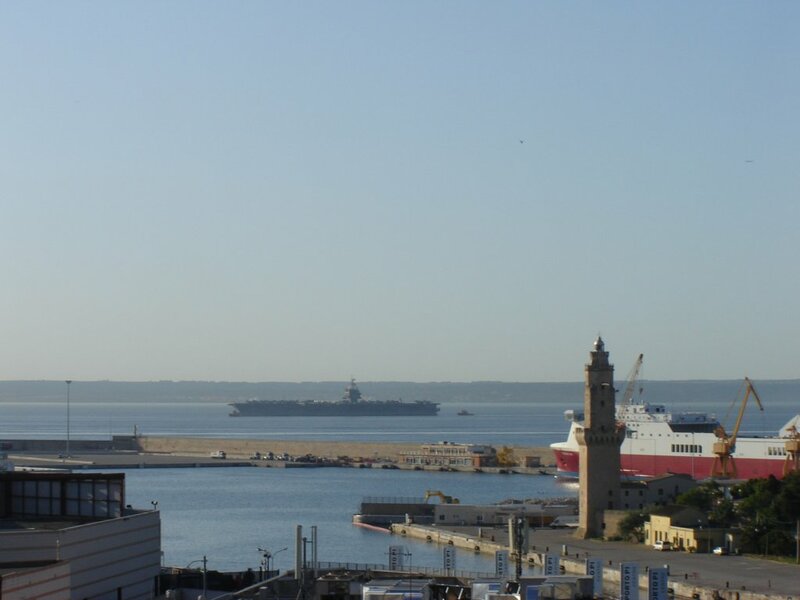 The carrier was operating in the Mediterranean with her embarked Carrier Air Wing Three (CVW-3) on a regularly scheduled deployment. U.S. Navy photo by Photographer's Mate Airman Apprentice Darryl L. Wood, March 9, 1999 (photo # 990309-N-9301W-002). 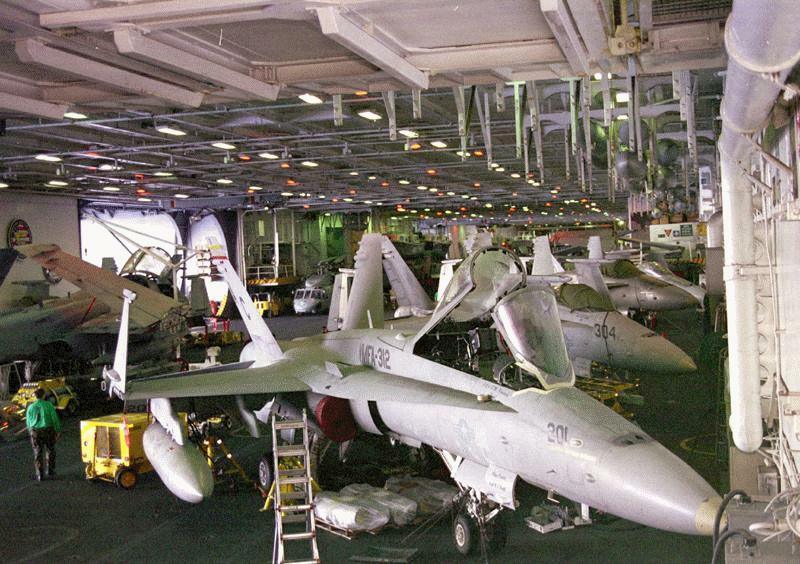 A row of F/A-18C Hornets undergo maintenance in the hangar deck of USS Enterprise as the carrier operates in the Mediterranean, 11 March 1999. Closest to camera is #201 (BuNo 164265), assigned to VMFA-312 "Checkerboards"; next is #304 (BuNo 164946) assigned to VFA-37 "Bulls." The opening for a deck-edge elevator is visible in the left background. The overhead is used to store drop tanks and spare parts. US Navy photo by Photographer's Mate Airman Karl L. Peters (# 990311-N-8854P-002). 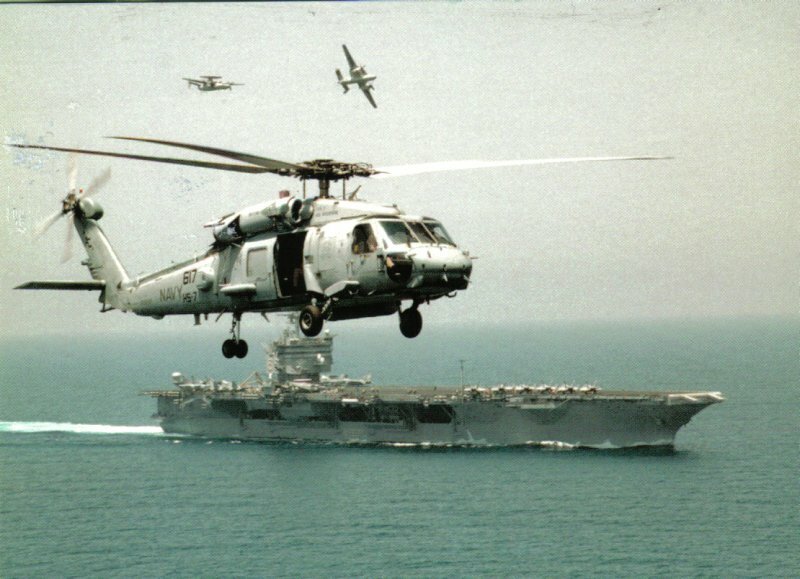 An HH-60 Seahawk helicopter, attached to Helicopter Anti-Submarine Squadron Seven (HS-7, the "Dusty Dogs") and embarked on USS Enterprise (CVN-65), hovers in the foreground as two E-2C Hawkeyes attached to Airborne Early Warning Squadron One Two Six (VAW-126, the "Seahawks") fly over the carrier, April 14, 1999. 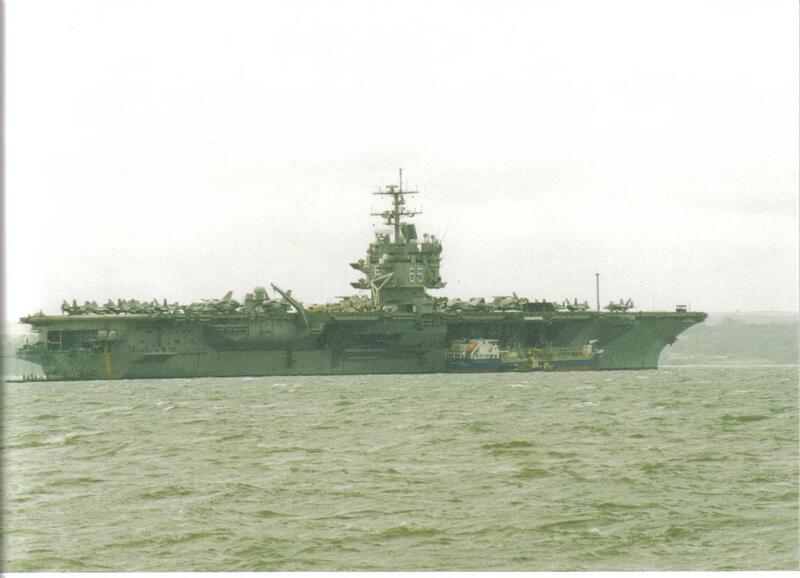 Enterprise was deployed to the Persian Gulf. U.S. Navy photograph by Photographer's Mate 3rd Class Timothy S. Smith (# 990414-N-5458S-002). A Landing Signal Officer (LSO) from the Strike Aircraft Test Directorate, Patuxent River, Md., watches as an F-14A Tomcat makes an arrested landing aboard USS Enterprise (CVN-65), 15 February 2000. 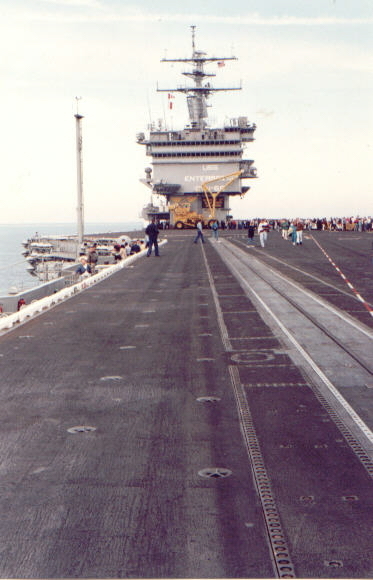 The Big E was conducting carrier qualifications in the Atlantic Ocean. U.S. Navy photo by Photographer's Mate 2nd Class Michael W. Pendergrass (#000215-N-3235P-004). 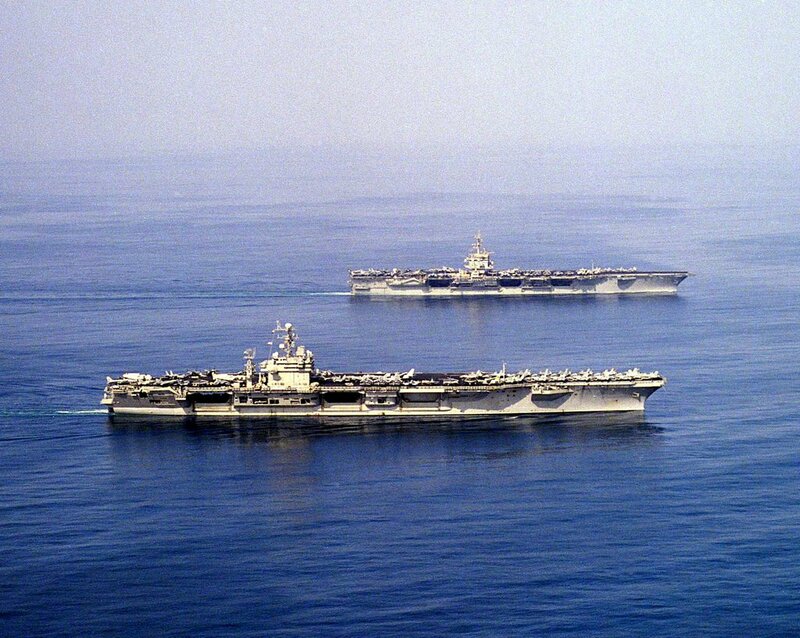 USS Enterprise (CVN-65), upper, and USS Carl Vinson (CVN-70), lower, meet briefly in the waters of the Persian Gulf region, 16 September 2001. 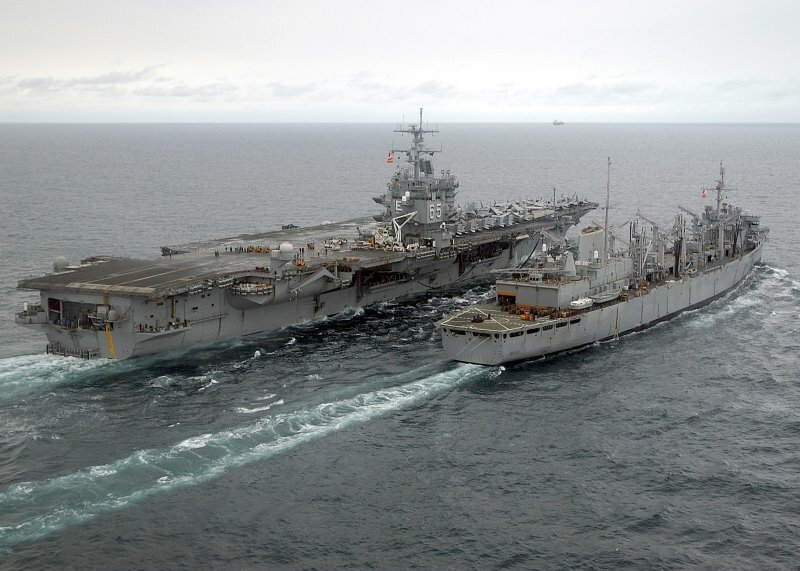 Both ships were on regularly scheduled deployments in support of Operation Southern Watch. Enterprise was extended in the region following terrorist attacks on New York City and Washington, D.C. U.S. Navy photo by Photographers Mate 3rd Class Douglas Pearlman (# 010916-N-6259P-001). 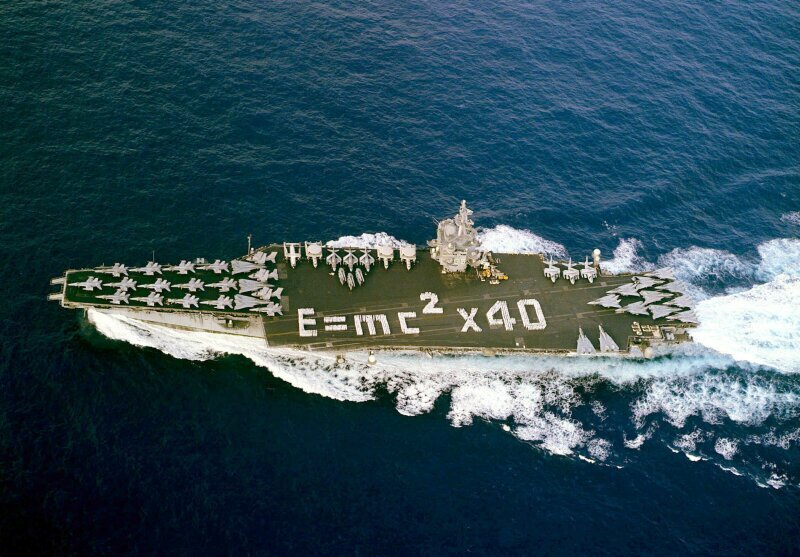 Nov. 5, 2001  Sailors aboard USS Enterprise spell out "E = mc2 x 40" on the carrier's flight deck to mark forty years of U.S. Naval nuclear power as ship and crew return home from a deployment in support of Operation Enduring Freedom. 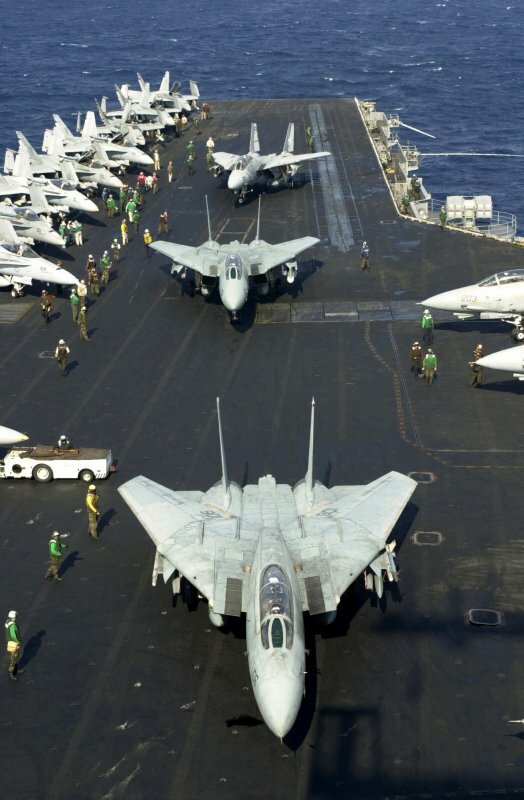 Nov. 9, 2001  F-14 Tomcats prepare to take off from the flight deck of USS Enterprise. U.S. Navy Photo by Photographer's Mate 1st Class, Martin Maddock. [011109-N-0872M-507]. 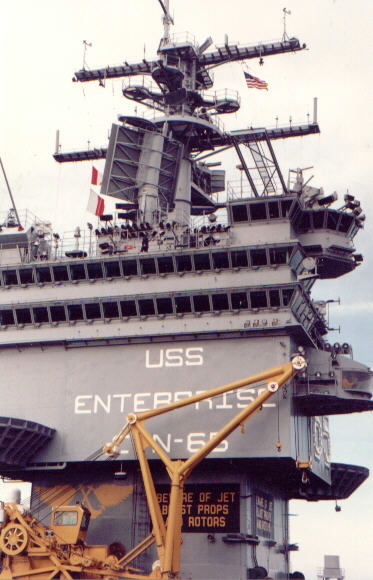 USS Enterprise (CVN-65) profile, circa 2002–2004. 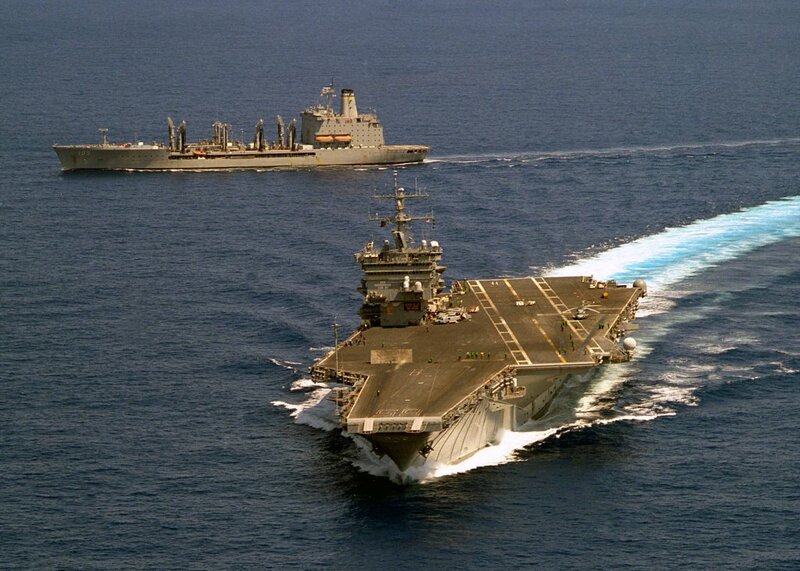 May 16, 2003  USS Enterprise (CVN-65) steams alongside the Military Sealift Command Fast Combat Support Ship USNS Leroy Grumman (T-AO 195) during an underway replenishment (UNREP). 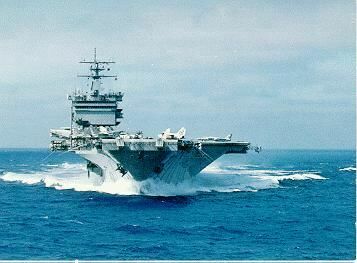 Enterprise was underway off the Atlantic coast conducting carrier qualifications. (NS026537): U.S. Navy photo by Photographer's Mate 2nd Class Douglas M. Pearlman (#030516-N-6259P-004). (NS026537a): U.S. Navy photo by Photographer's Mate 2nd Class Douglas M. Pearlman (#030516-N-6259P-003). (NS026537b): U.S. Navy photo by Photographer's Mate 2nd Class Douglas M. Pearlman (#030516-N-6259P-001). (NS026537c): U.S. Navy photo by Photographer's Mate 2nd Class Douglas M. Pearlman (#030516-N-6259P-002). Atlantic Ocean, Jun. 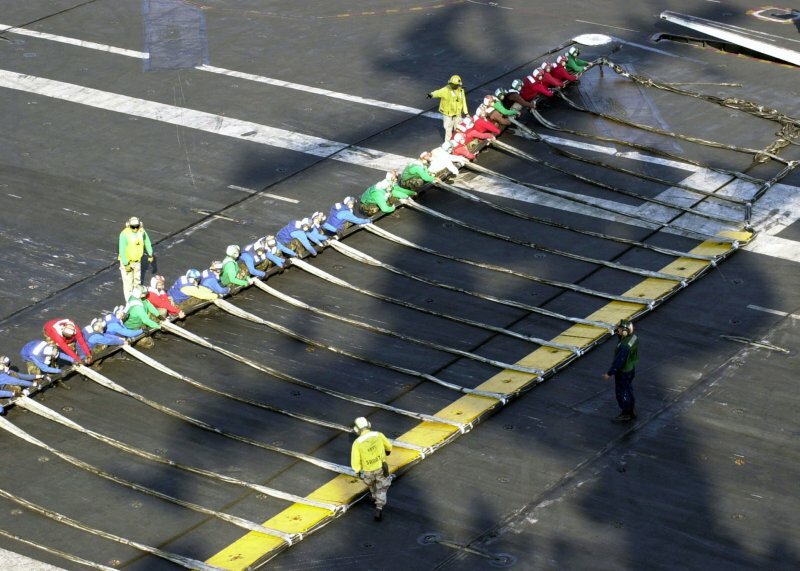 25, 2003  Sailors assigned to the air department lay out the barricade on the flight deck of USS Enterprise (CVN-65) during a general quarters drill. 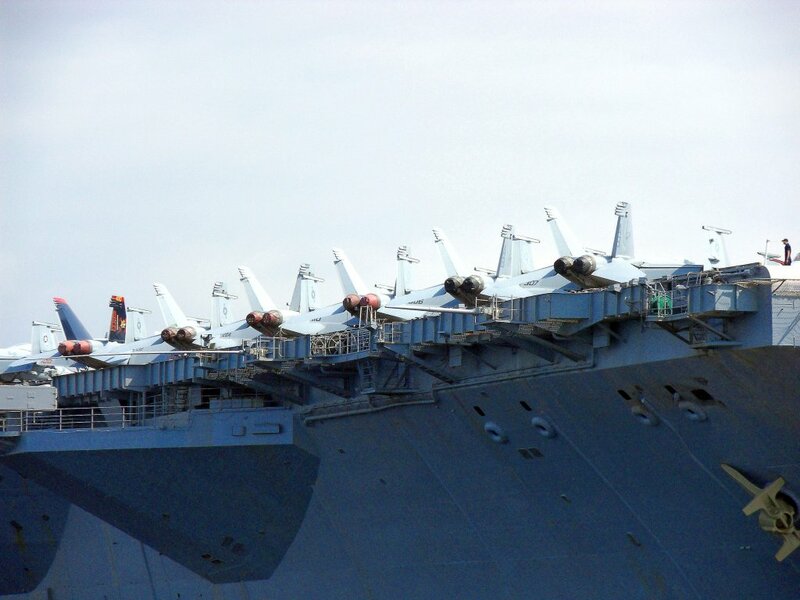 When raised to a vertical position, the barricade is used to stop aircraft that have to make an emergency landing and are unable to make an arrested tailhook landing. Enterprise was underway in the Atlantic Ocean for Tailored Ships Training Availability (TSTA) preparing for an upcoming scheduled deployment. U.S. Navy photo by Photographer's Mate Airman Apprentice Robert Gaston (photo # 030625-N-0119G-002). 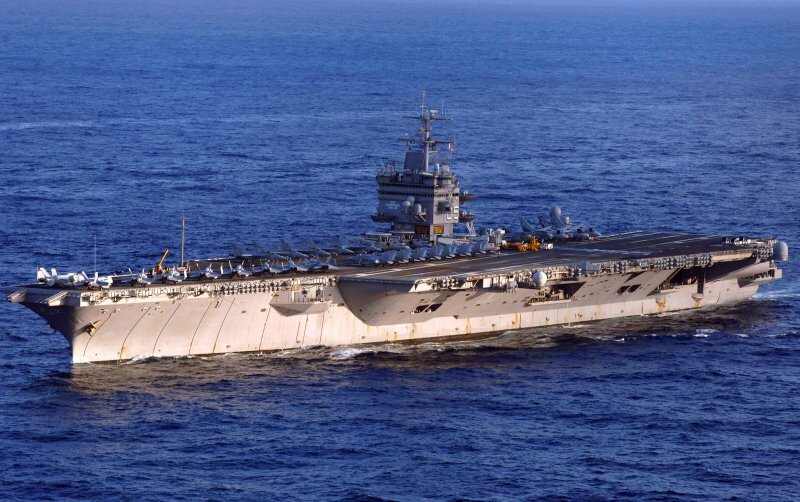 Sep. 21, 2003  The aircraft carrier USS Enterprise (CVN-65) makes her way in the Atlantic Ocean during her final preparation for the Enterprise Strike Group deployment to the Mediterranean. U.S. Navy photo by Photographer’s Mate 2nd Class Douglas M. Pearlman. [030921-N-6259P-003]. 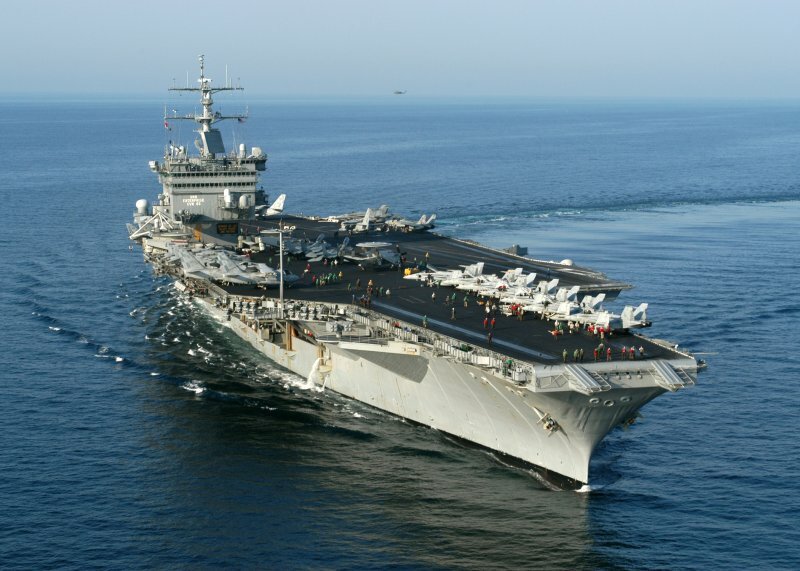 Northern Arabian Sea, Oct. 21, 2003  USS Enterprise (CVN-65) steams toward the Persian Gulf while on her six-month scheduled deployment. U.S. Navy photo by Photographer’s Mate 2nd Class Douglas M. Pearlman. [031021-N-6259P-001]. U.S. Navy photo by Photographer’s Mate 2nd Class Douglas M. Pearlman. [031021-N-6259P-002]. 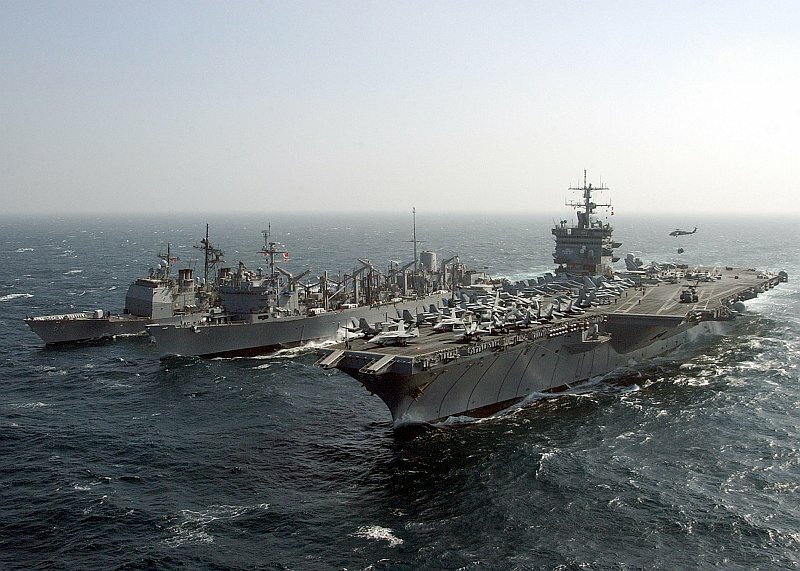 Arabian Sea, Nov. 11, 2003  The guided missile cruiser USS Gettysburg (CG-64), top, and the aircraft carrier USS Enterprise (CVN-65), bottom, underway alongside the fast combat support ship USS Detroit (AOE-4) during a replenishment at sea. 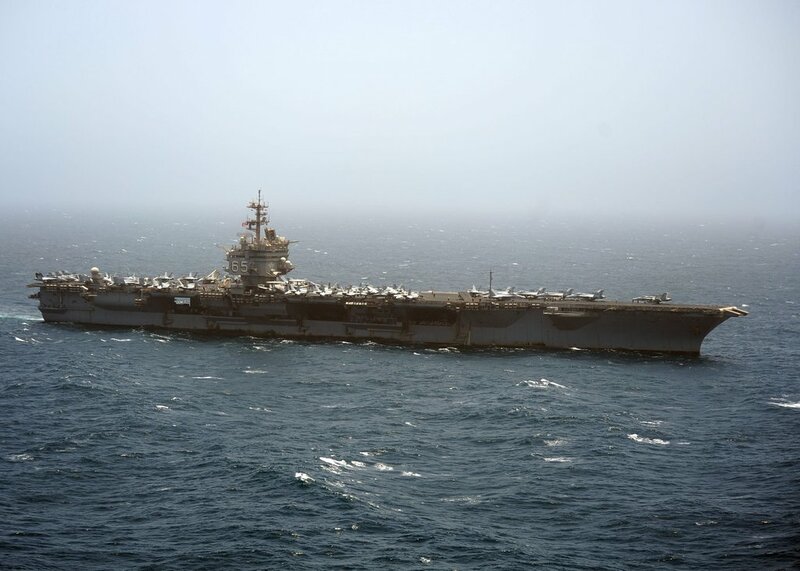 The Enterprise Carrier Strike Group (CSG) was on a scheduled deployment conducting missions in support of Operations Iraqi Freedom and Enduring Freedom. U.S. Navy photo by Photographer's Mate 2nd Class Douglas M. Pearlman (# 031111-N-6259P-004). 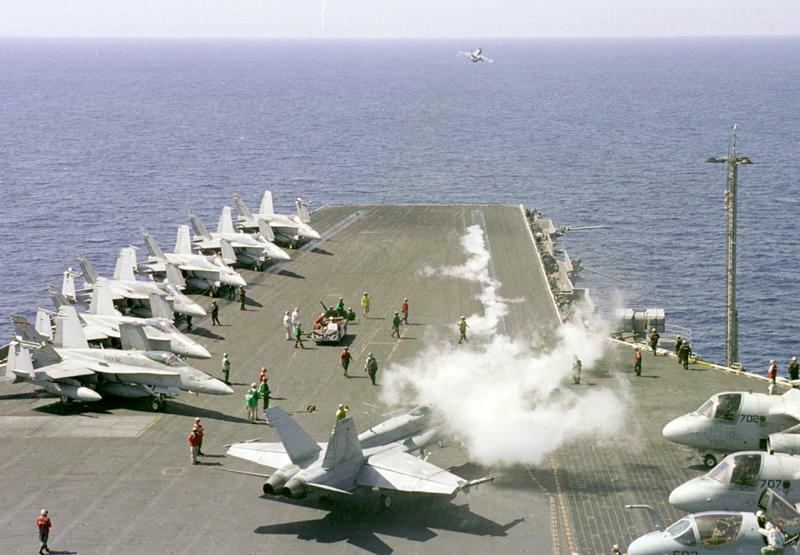 Persian Gulf, Dec. 3, 2003  As steam from a previous launch billows out of the catapult track, flight deck personnel hustle to prepare an F/A-18 Hornet, attached to Strike Fighter Squadron Eight Six (VFA-86), to launch from the flight deck of the nuclear-powered aircraft carrier USS Enterprise. U.S. Navy photo by Photographer's Mate Airman Milosz Reterski. [031203-N-9742R-002]. Persian Gulf, Jan. 10, 2004  The fast combat support ship USS Detroit (AOE-4) steams alongside USS Enterprise (CVN-65) while conducting an early morning Replenishment at Sea (RAS). 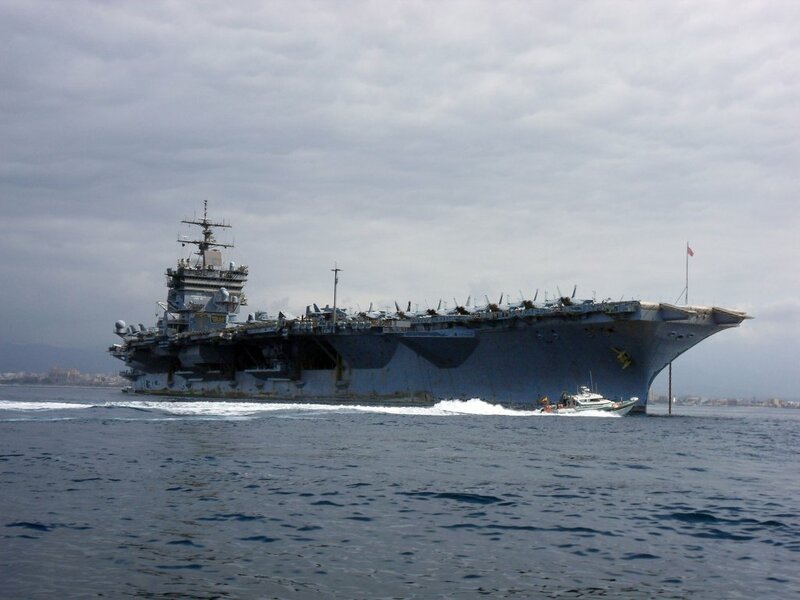 Both ships were conducting missions in support of Operation Iraqi Freedom and the continued war on terrorism. U.S. Navy photo by Photographer's Mate Airman Joshua E. Helgeson. [040110-N-5405H-001]. Persian Gulf, Jan. 23, 2004  The guided missile cruisers USS Philippine Sea (CG-58) and USS Gettysburg (CG-64) steam alongside USS Enterprise (CVN-65). 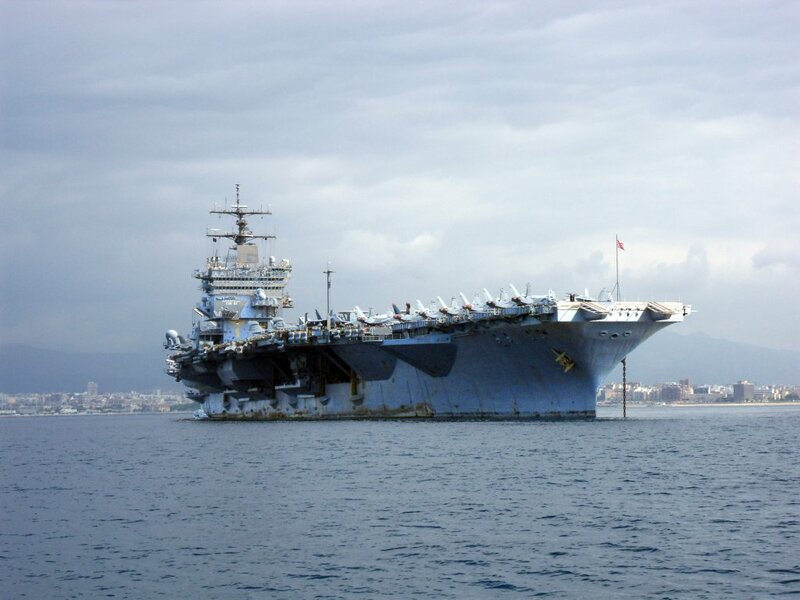 The three ships were in the Persian Gulf on a regularly scheduled deployment, conducting missions in support of Operation Iraqi Freedom and the continued war on terrorism. U.S. Navy photo by Photographer's Mate Airman Joshua E. Helgeson. [040123-N-5405H-009]. 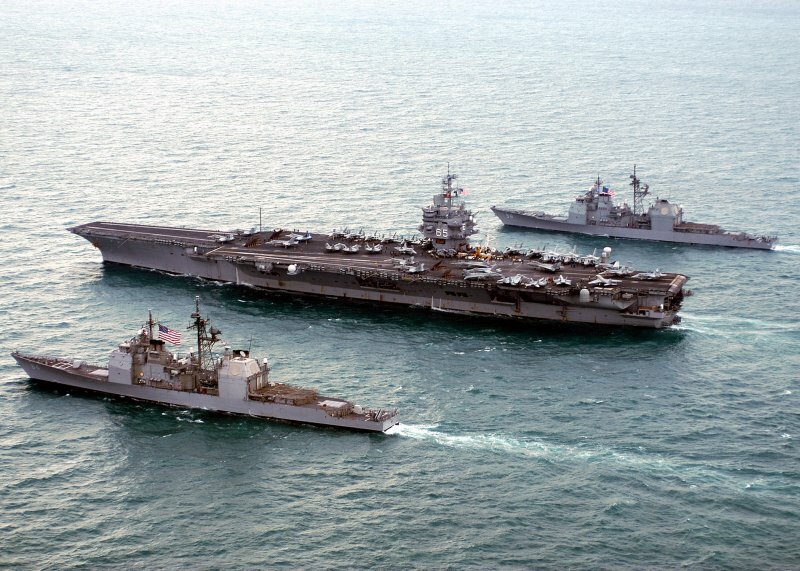 Persian Gulf, Jan. 27, 2004  The nuclear powered aircraft carrier USS Enterprise (CVN-65), fast combat support ship USS Detroit (AOE-4), and the guided missile cruiser USS Gettysburg (CG-64) perform a replenishment at sea. 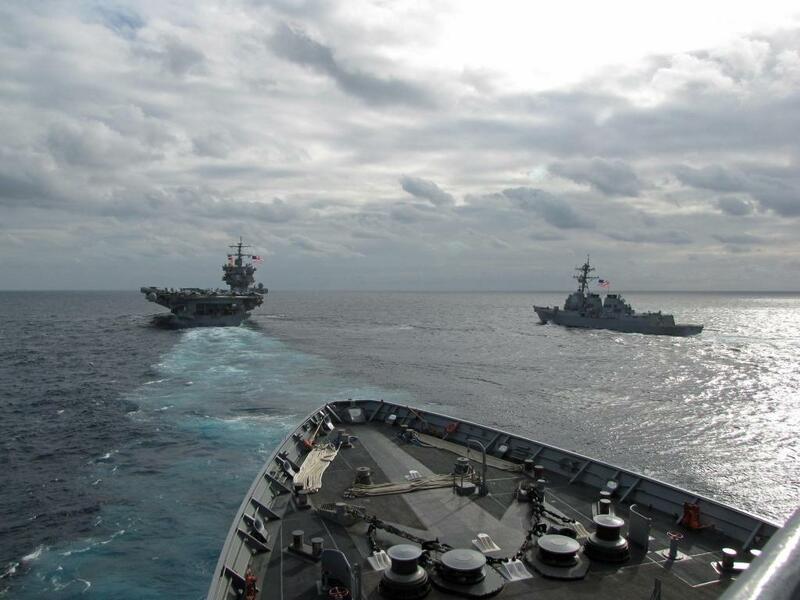 The Enterprise Carrier Strike Group (CSG) was nearing the end of a scheduled deployment in the region. U.S. Navy photo by Photographer's Mate Airman Joshua E. Helgeson (# 040127-N-5405H-002). Naval Station Norfolk, Va., February 29, 2004  Sailors aboard USS Enterprise (CVN-65) "man the rails" as the the nuclear powered aircraft carrier approaches her pier at her homeport of Naval Station Norfolk, Va. 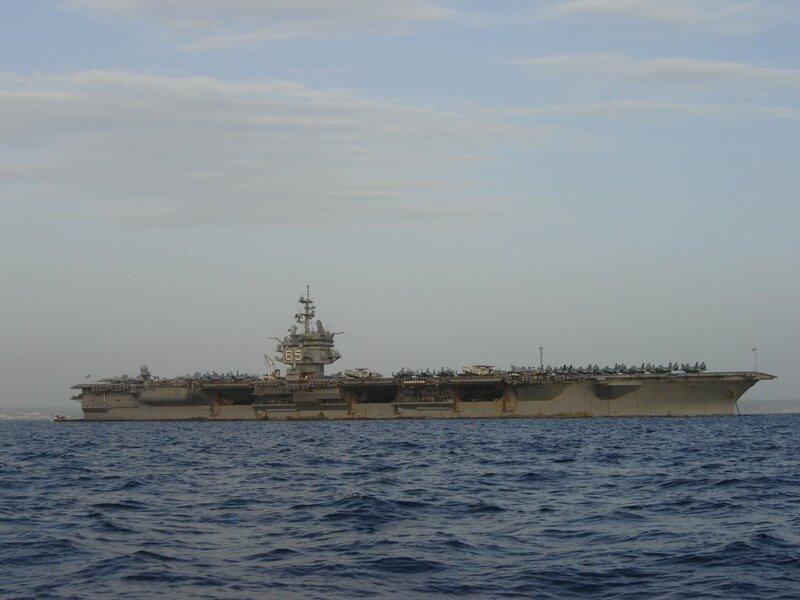 The "Big E" and her strike group were returning after completing a six-month deployment in support of the global war on terrorism, including Operations Iraqi Freedom and Enduring Freedom. U.S. Navy photo by Photographer's Mate 3rd Class Sondra Howett (# 040229-N-7097H-006). 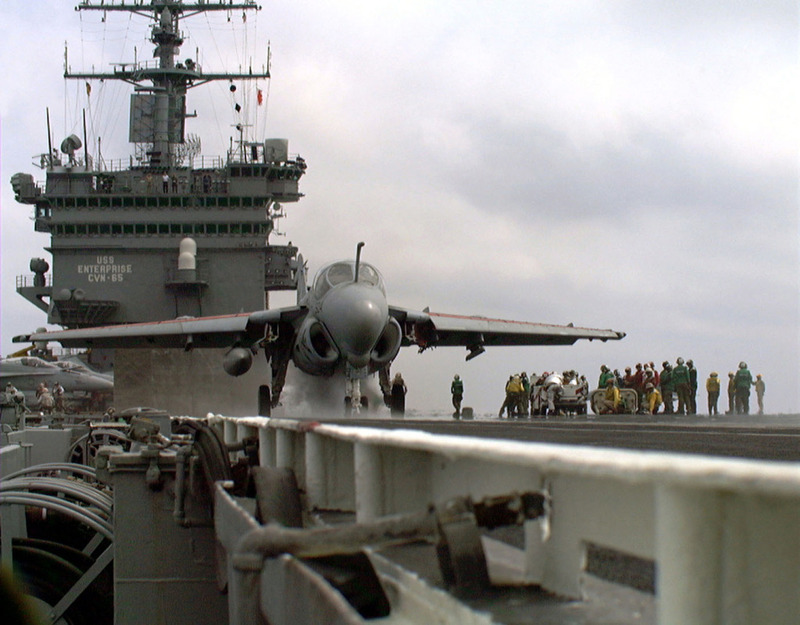 The crew assigned to the aircraft carrier USS Enterprise (CVN-65) "man the rails" as they prepare to moor at Port Everglades, Fla., 26 April 2004, for Fleet Week 2004. Shown also are the Oliver Hazard Perry-class guided missile frigate USS Simpson (FFG-56), center left, the Arleigh Burke-class guided missile destroyer USS Mitscher (DDG-57), center right, and the Los Angeles-class attack submarine USS Miami (SSN-755), lower right. U.S. Navy photo by Journalist 2nd Class William Lovelady (# 040426-N-2038L-001). 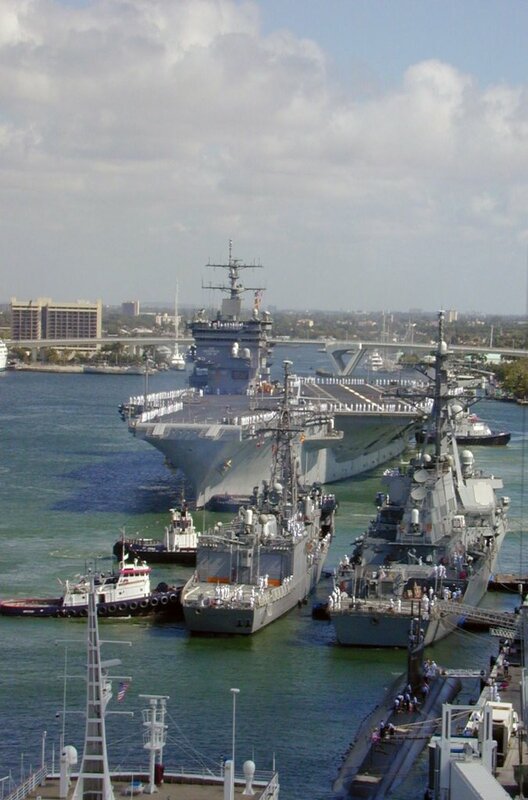 Fort Lauderdale, during Fleet Week, 27 April 2004. Atlantic Ocean, Jun. 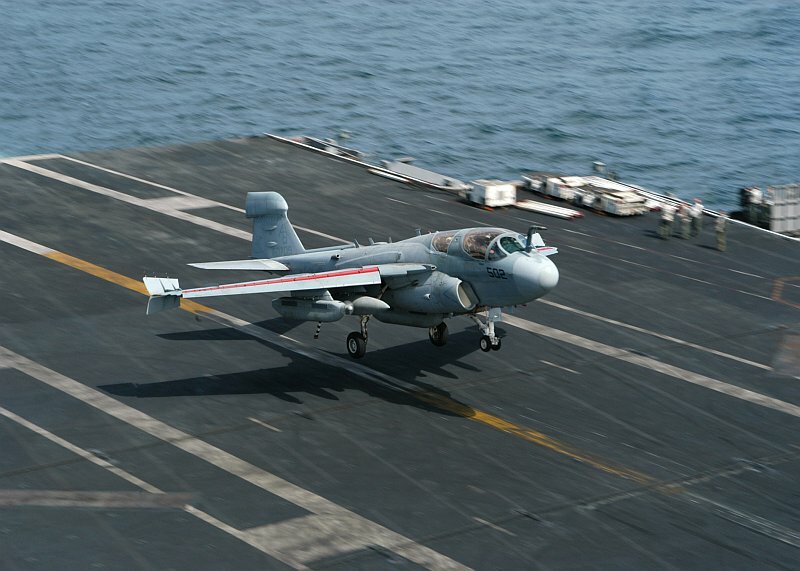 29, 2004  An EA-6B Prowler assigned to the "Rooks" of Electronic Attack Squadron One Three Seven (VAQ-137), makes an arrested landing aboard USS Enterprise (CVN-65), involved in Summer Pulse 2004, the simultaneous deployment of seven aircraft carrier strike groups (CSGs), demonstrating the ability of the Navy to provide credible combat capability across the globe, in five theaters with other U.S., allied, and coalition military forces. Summer Pulse was the Navy's first deployment under its new Fleet Response Plan (FRP). U.S. Navy photo by Photographer's Mate 3rd Class Robert A. Wood (# 040629-N-5469W-023). USS Enterprise visit to Portsmouth, England, 4th July 2004. 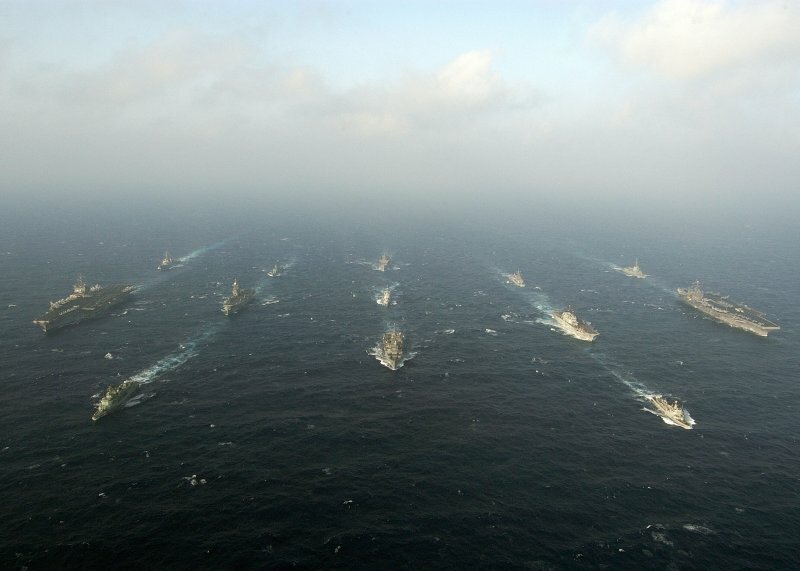 Atlantic Ocean, July 12, 2004  USS Enterprise (CVN-65), left, and USS Harry S. Truman (CVN-75), right, steam through the waters of the Atlantic Ocean in formation with other US Navy ships and multi-national warships (including two aircraft carriers: the Spanish Príncipe de Asturias (R-11), alongside Enterprise and the Italian Giuseppe Garibaldi (C-551), alongside Harry S. Truman) as part of Majestic Eagle 2004. 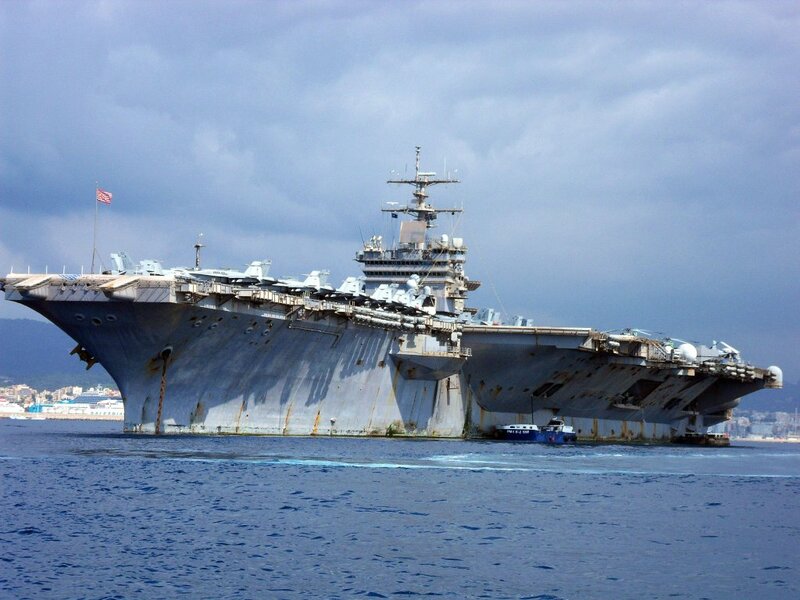 Enterprise and Harry S. Truman were also part of the seven carriers involved in Summer Pulse 2004 (see NS026578). U.S. Navy photo by Photographer's Mate Airman Joshua E. Helgeson (# 040712-N-5405H-101). Naval Station Norfolk, Va., August 27, 2004  A UH-3H Sea King helicopter assigned to the Search and Rescue (SAR) unit at Naval Air Station Oceana, Va., flies over the aircraft carriers moored at Naval Station Norfolk, Va.; left to right, USS Harry S. Truman (CVN-75), USS George Washington (CVN-73), and USS Enterprise (CVN-65). U.S. Navy photo by Photographer's Mate 1st Class Anthony M. Koch (# 040827-N-4459K-002). 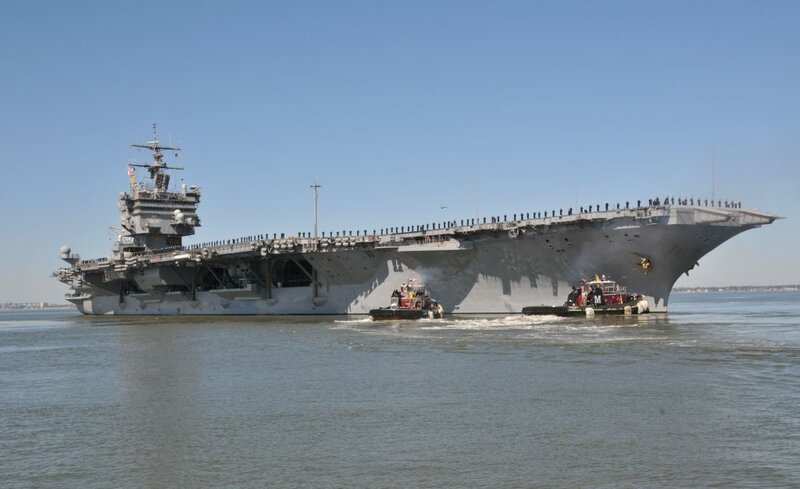 Norfolk, Va., Oct. 13, 2005  USS Enterprise (CVN-65) departs Norfolk Naval Base for the first time since Sept. 2004 when she started a scheduled Extended Selected Restricted Availability in Northrop Grumman Newport News Shipyard. 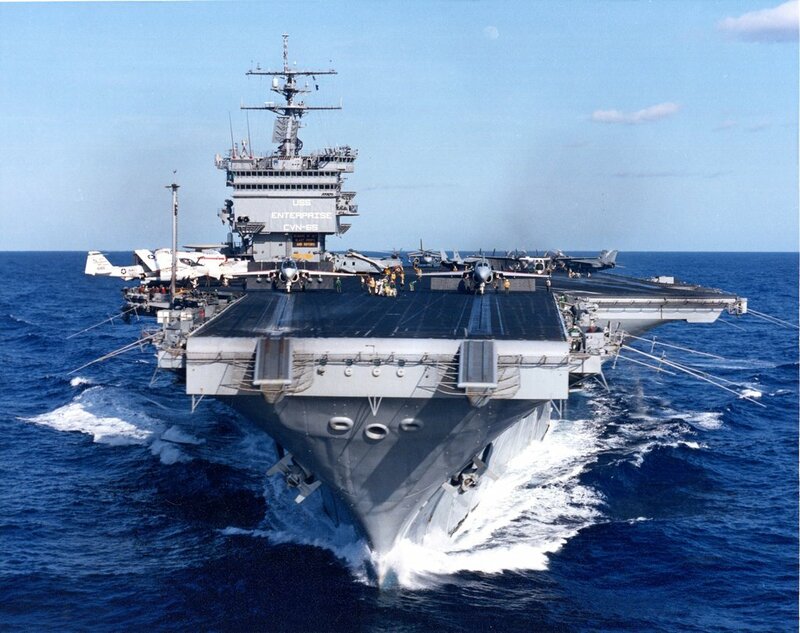 The nuclear-powered aircraft carrier then conducted Sea Trials and Flight Deck Certification in the Atlantic Ocean. U.S. Navy photo by Photographer's Mate 3rd Class Rob Gaston (# 051013-N-0119G-141). 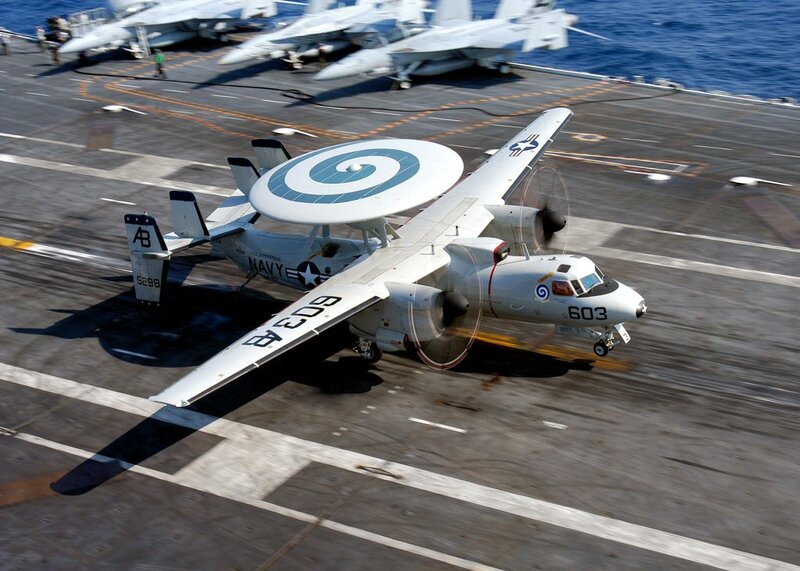 E-2C Hawkeye, BuNo 165298, modex AB603, assigned to the "Screwtops" of Airborne Early Warning Squadron (VAW) 123 lands on the flight deck of USS Enterprise (CVN-65), 19 October 2005. 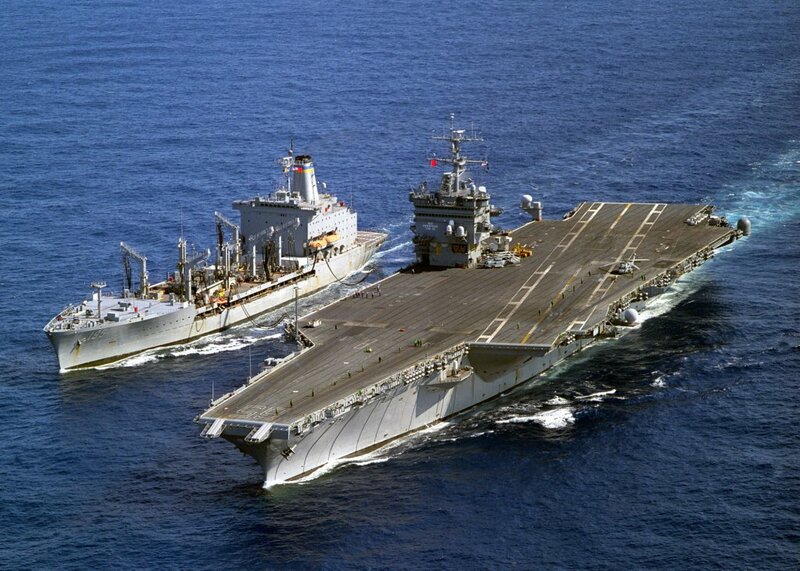 The nuclear-powered aircraft carrier was underway in the Atlantic Ocean conducting Carrier Qualifications. U.S. Navy photo by Photographer's Mate 3rd Class Bill Howell (# 051019-N-7263H-005). 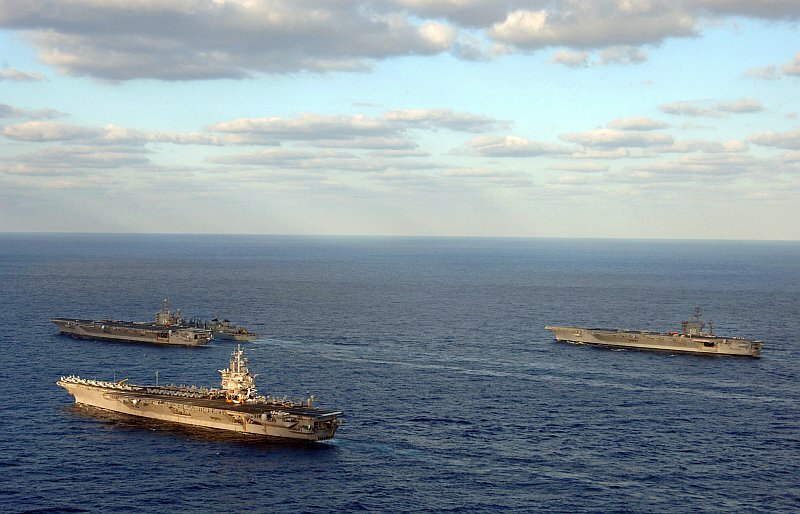 Atlantic Ocean, Nov. 3, 2005  The Nimitz-class aircraft carrier USS Harry S. Truman (CVN-75), center, sails alongside the Military Sealift Command (MSC) fast combat support ship USNS Arctic (T-AOE 8), followed by the nuclear-powered aircraft carrier USS Enterprise (CVN-65), left, and the Nimitz-class aircraft carrier USS Dwight D. Eisenhower (CVN-69), right, during an early morning vertical replenishment and underway replenishment. U.S. Navy photo by Photographer's Mate 3rd Class Kristopher Wilson (# 051103-N-5345W-055). 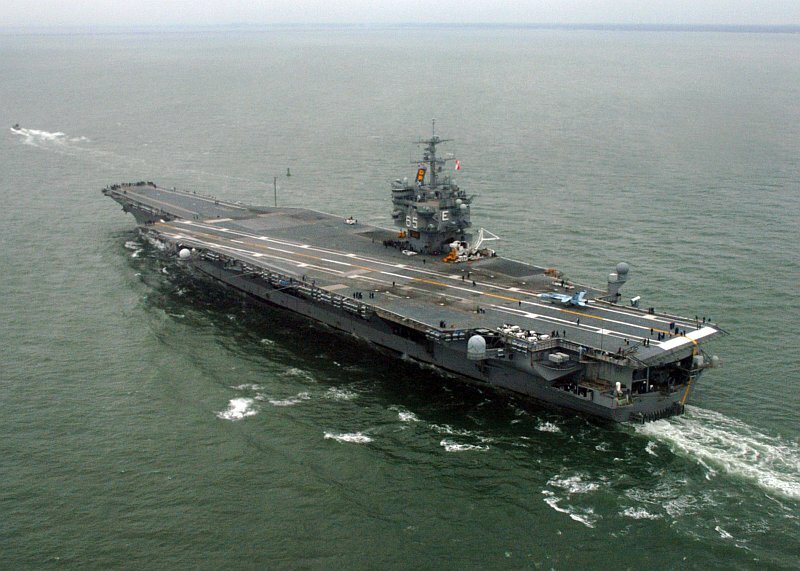 USS Enterprise (CVN-65) underway in the Atlantic Ocean, November 3, 2005. U.S. Navy photo by Photographer's Mate 3rd Class Kristopher Wilson (# 051103-N-5345W-097). Atlantic Ocean, November 3, 2005  USS Enterprise (CVN-65) sails alongside the Nimitz-class aircraft carrier USS Dwight D. Eisenhower (CVN-69) during an early morning vertical replenishment (VERTREP). 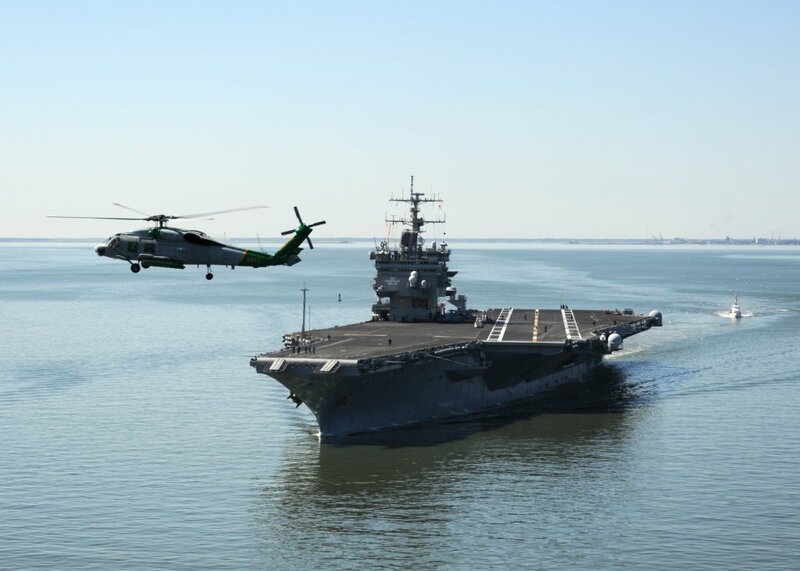 Enterprise and embarked Carrier Air Wing One (CVW-1) were conducting Tailored Ship's Training Availability (TSTA). U.S. Navy photo by Photographer's Mate 3rd Class Josh Kinter (# 051103-N-7748K-001). Atlantic Ocean, Feb. 6, 2006  USS Enterprise (CVN-65) prepares to conduct a refueling at sea with the guided missile destroyer USS McFaul (DDG-74). 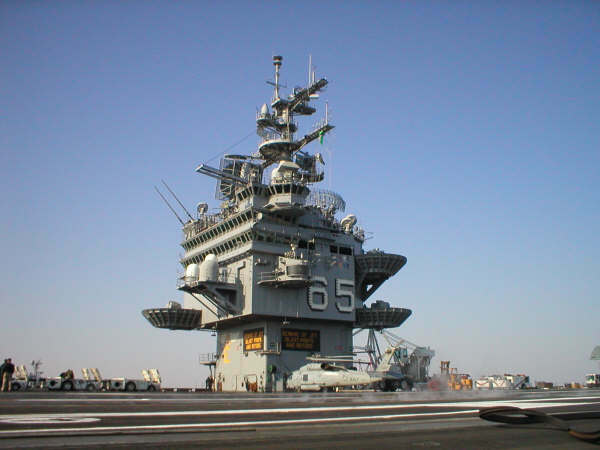 The nuclear-powered aircraft carrier was underway conducting routine carrier qualifications. U.S. Navy photo by Photographer's Mate 3rd Class Josh Kinter (# 060206-N-7748K-002). 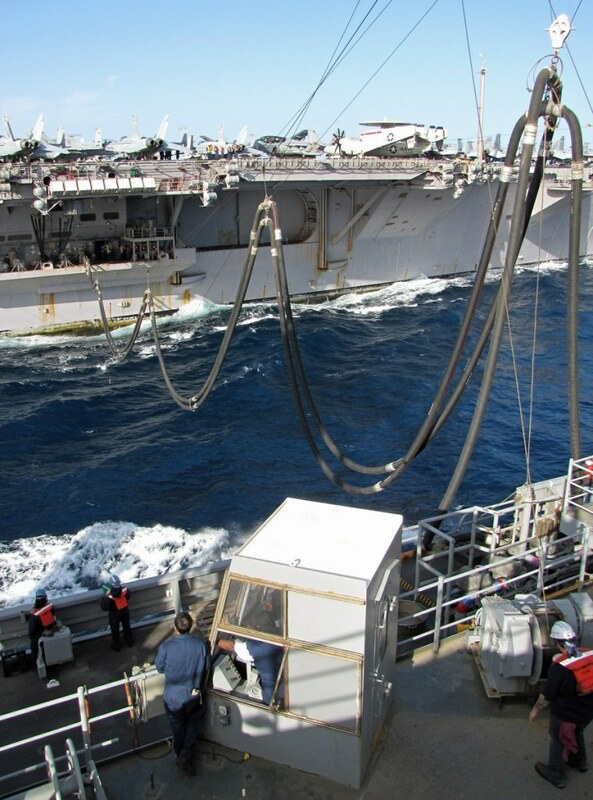 USNS Supply (T-AOE 6) conducting a connected replenishment (CONREP) and vertical replenishment (VERTREP) while sailing through the Atlantic Ocean with USS Enterprise (CVN-65) and USS Taylor (FFG-50), March 3, 2006. 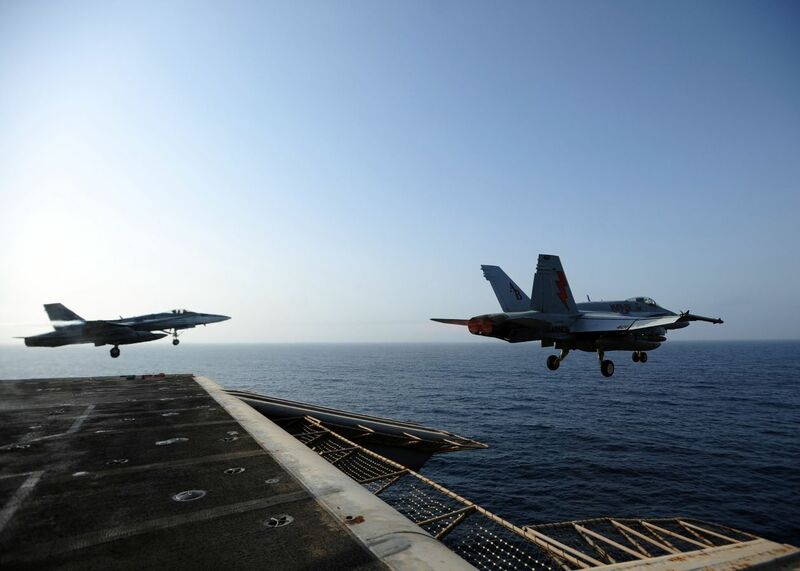 Enterprise and embarked Carrier Air Wing One (CVW-1) were conducting a Composite Training Unit Exercise (COMPTUEX). US Navy photo by PH3 Rob Gaston (# 060303-N-0119G-009), from the MSC web site. 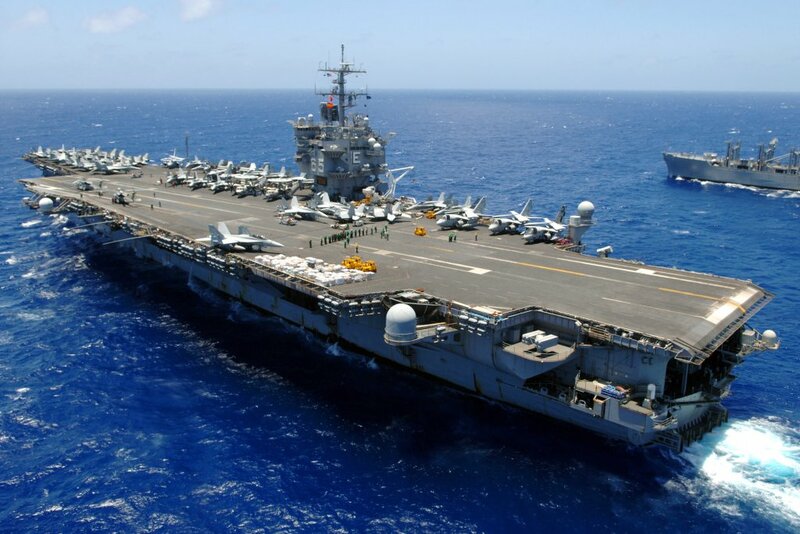 USS Enterprise (CVN-65) transits the Philippine Sea while conducting a Vertical Replenishment (VERTREP) with the Military Sealift Command (MSC) combat stores ship USNS San Jose (T-AFS 7), 24 July 2006. 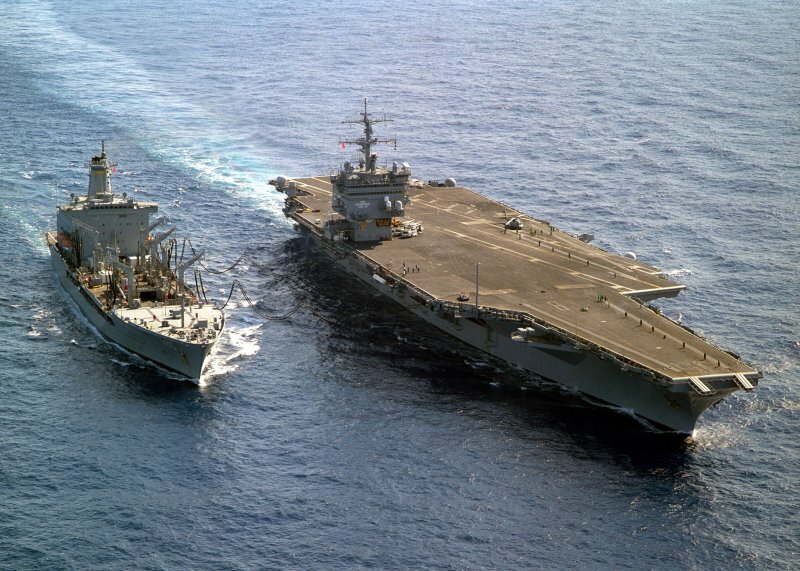 The Big E and her embarked Carrier Air Wing One (CVW-1) were underway on a scheduled six-month deployment in support of the global war on terrorism. U.S. Navy photo by Mass Communications Specialist Seaman Rob Gaston (#060724-N-0119G-018). As above. U.S. Navy photo by Mass Communications Specialist Seaman Rob Gaston (#060724-N-0119G-111). 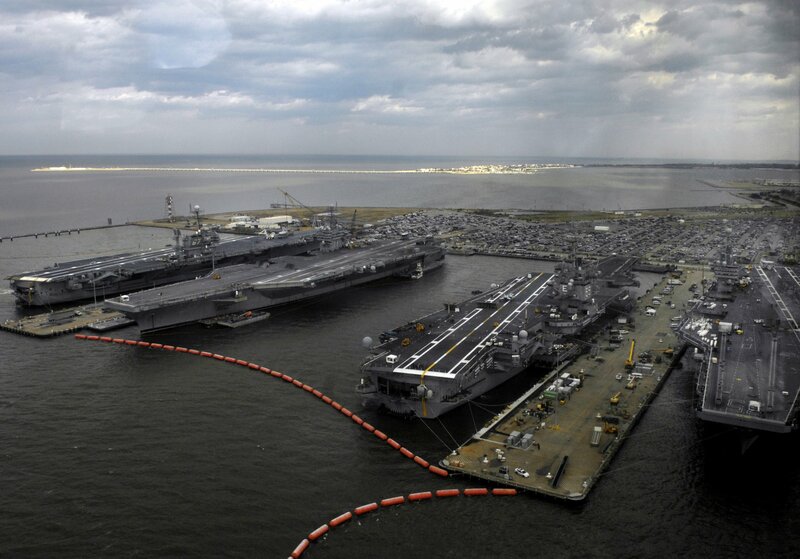 From left, U.S. Navy aircraft carriers USS John F. Kennedy (CV-67), USS Theodore Roosevelt (CVN-71), USS Enterprise (CVN-65) and USS Harry S. Truman (CVN‑75) sit moored in Norfolk, Va., 22 February 2007. DoD photo by Cherie A. Thurlby (# 070222-D-7203T-021). 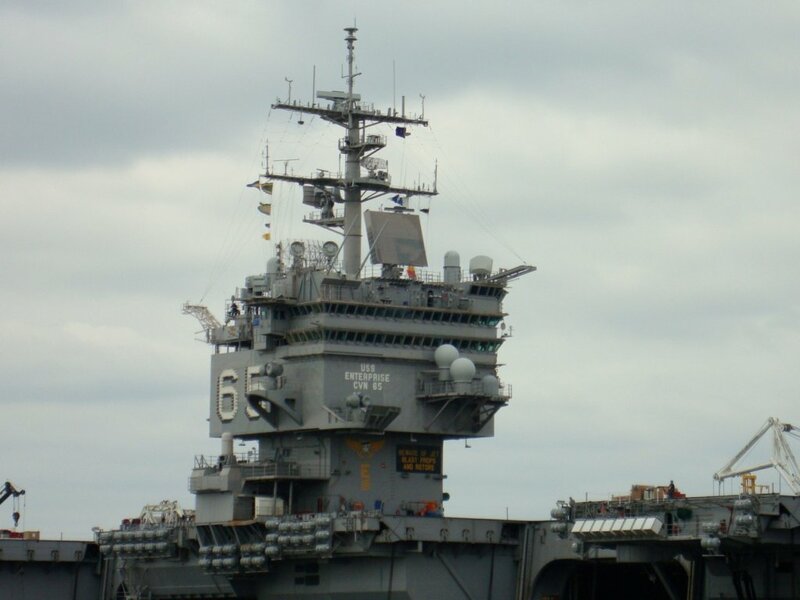 USS Enterprise (CVN-65), Naval Station Norfolk, Va., 20 April 2007. 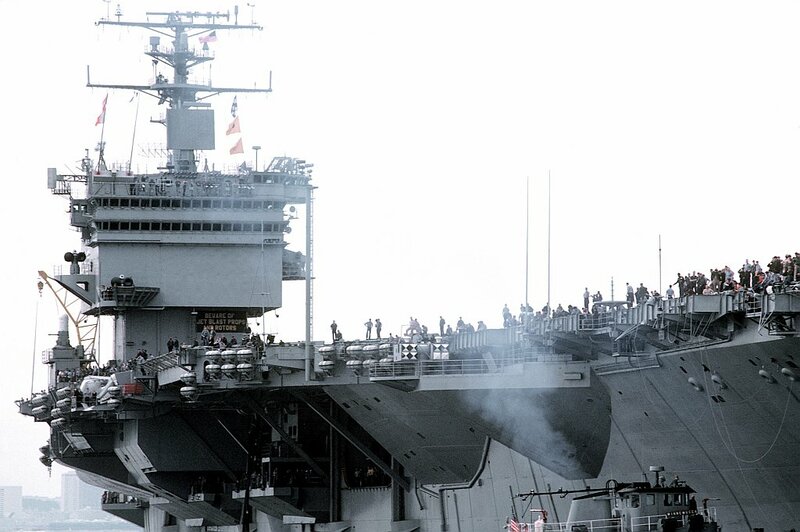 USS Harry S. Truman (CVN-75) in the background. USS Enterprise (CVN-65) conducts an underway replenishment with the Military Sealift Command fast combat support ship USNS Supply (T-AOE 6) while the guided-missile destroyer USS Arleigh Burke (DDG-51) and the guided-missile cruiser USS Vicksburg (CG-69) follow behind while underway in the Persian Gulf, 4 October 2007. U.S. Navy photo by Mass Communication Specialist 3rd Class N.C. Kaylor (#071004-N-5928K-005). 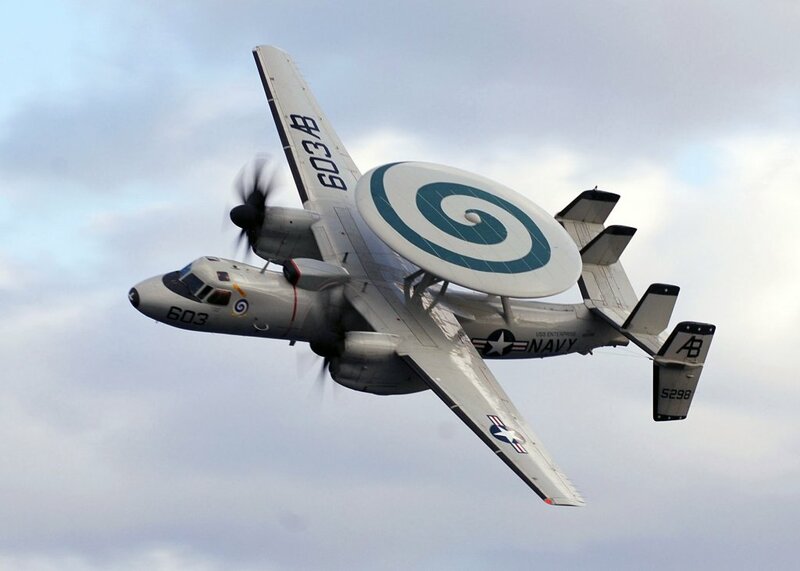 An E-2C Hawkeye, attached to the "Screwtops" of Carrier Airborne Early Warning Squadron (VAW) 123, performs a fly-by for family and friends of crew members during an air power demonstration held by USS Enterprise (CVN-65) in the Atlantic Ocean, 17 December 2007, during a three-day Tiger Cruise. 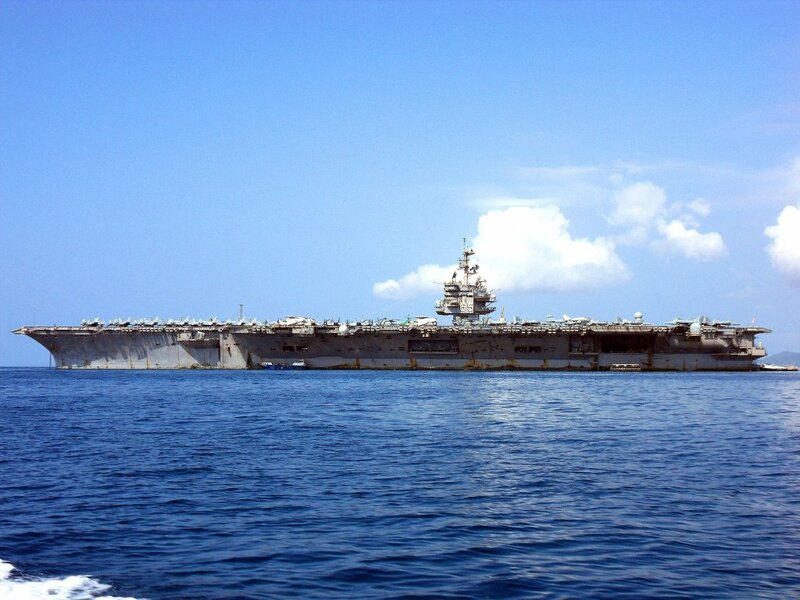 The Big E and embarked Carrier Air Wing (CVW) 1 were on a scheduled six-month deployment. U.S. Navy photo by Mass Communications Specialist 1st Class George R. Kusner (# 071217-N-4294K-008). 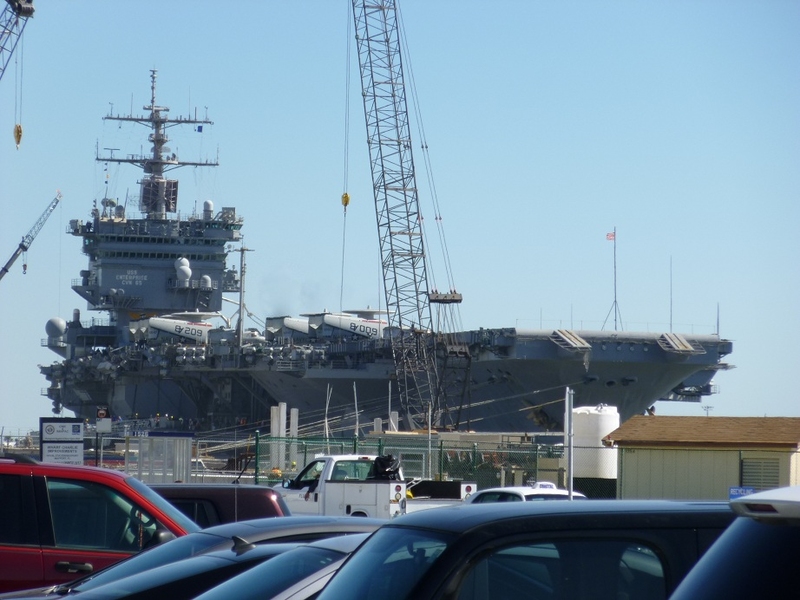 USS Enterprise (CVN-65), arrives at Northrop Grumman Shipbuilding, Newport News, Va., for an extended drydock restricted service availability (EDRSA), 11 April 2008. Photo by Ricky Thompson, Northrop Grumman Shipbuilding (#426-162). Photo courtesy of Northrop Grumman Shipbuilding. 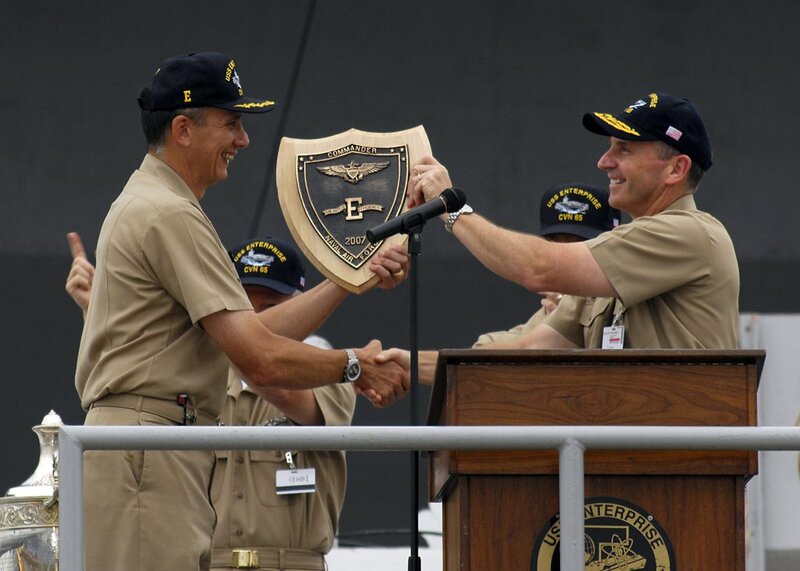 CAPT Ron Horton, commanding officer of USS Enterprise (CVN-65), accepts the Battle "E" award on behalf of the crew from ADM Jonathan Greenert, commander, U.S. Fleet Forces Command, during the Battenberg Cup presentation ceremony, 13 August 2008. 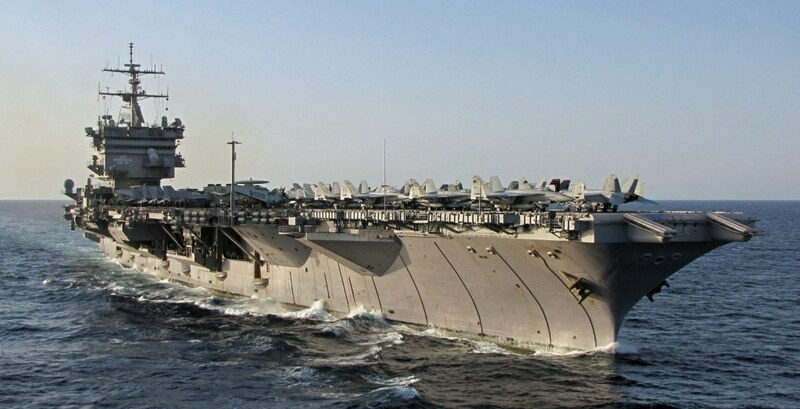 The nuclear-powered aircraft carrier was the 2007 recipient of the Battle "E" and Battenberg Cup, which is awarded annually to the ship's crew that exemplifies operational excellence. 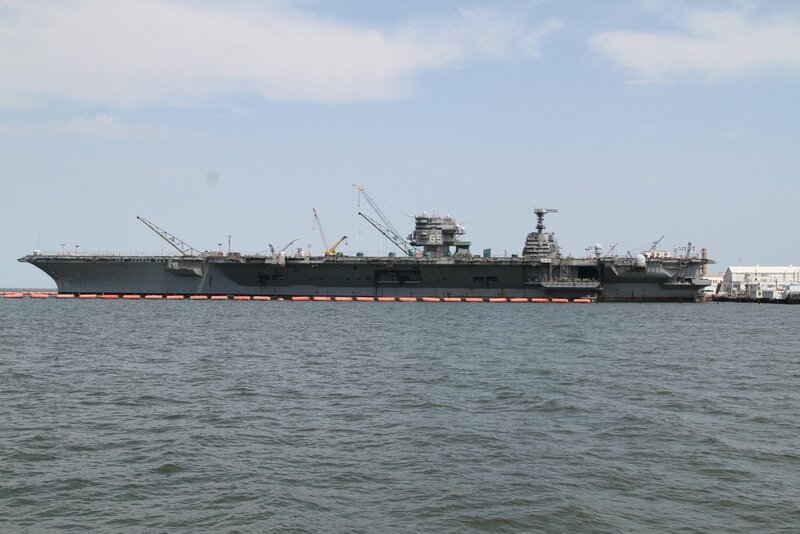 The Big E was in an extended dry dock shipyard restricted availability period in Newport News, Va. U.S. Navy photo by Mass Communication Specialist Seaman Stacy D. Laseter (# 080813-N-1287L-035). 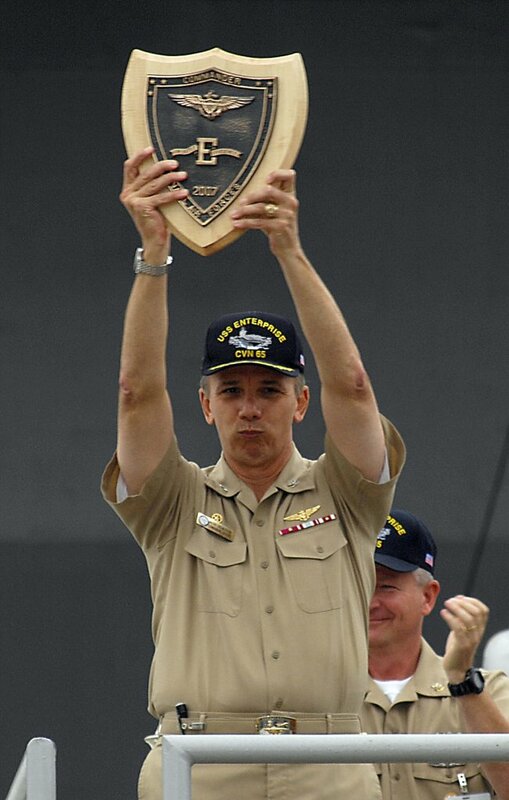 CAPT Ron Horton, commanding officer of USS Enterprise (CVN-65), holds the Battle "E" awarded to the carrier's crew after accepting the award from ADM Jonathan Greenert, commander, U.S. Fleet Forces Command, during the Battenberg Cup presentation ceremony, 13 August 2008, in Newport News, Va. U.S. Navy photo by Mass Communication Specialist Seaman Stacy D. Laseter (# 080813-N-1287L-037). 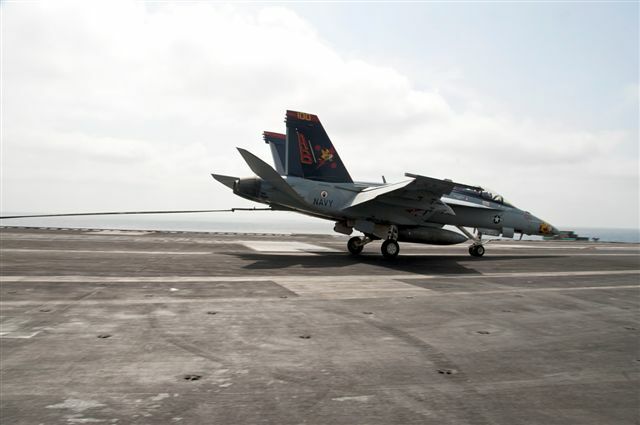 An F/A-18F Super Hornet assigned to the "Checkmates" of Strike Fighter Squadron (VFA) 211 lands aboard the aircraft carrier USS Enterprise (CVN-65), 10 May 2010, as part of the first squadron to land aboard the ship in more than two years. The Big E was conducting flight deck certification in the Atlantic Ocean, leading to her 24th deployment. NS0265cw: U.S. Navy photo by Mass Communication Specialist 2nd Class Travis S. Alston (# 100512-N-8446A-003). NS0265cwa: U.S. Navy photo by Mass Communication Specialist 2nd Class Travis S. Alston (# 100512-N-8446A-004). 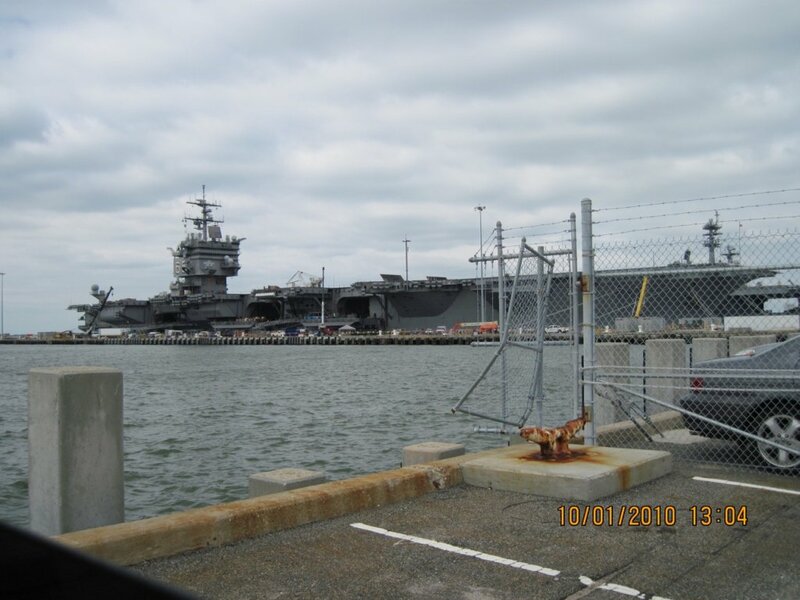 USS Enterprise (CVN-65), Naval Station Norfolk, 1 October 2010. 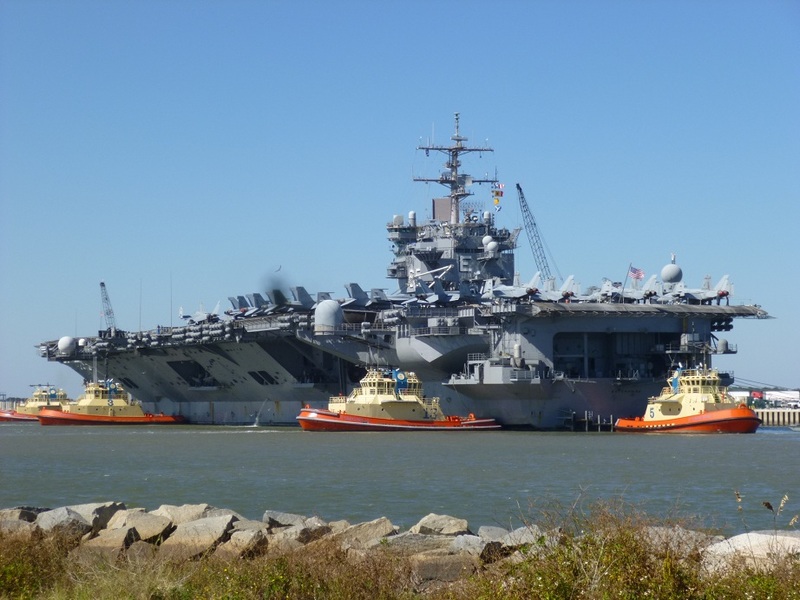 USS Enterprise (CVN-65), Naval Station Norfolk, 2 October 2010. 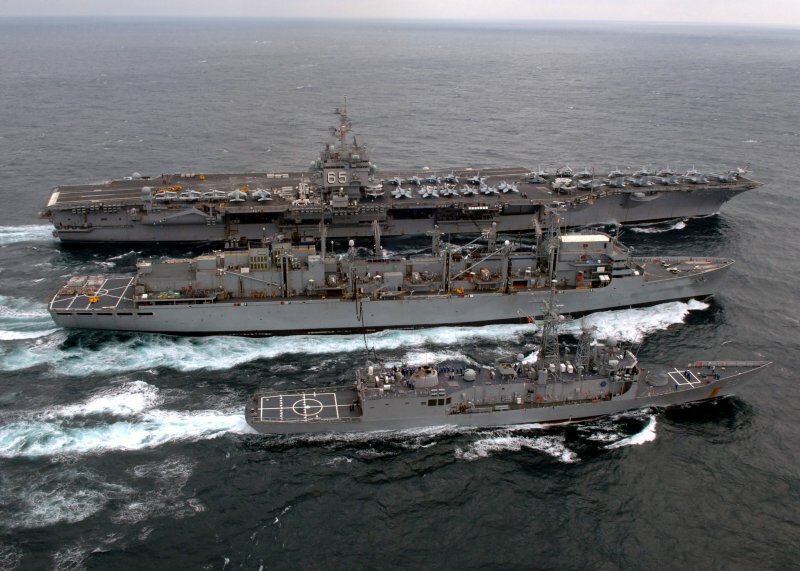 USS Enterprise (CVN-65) and the Military Sealift Command fast combat supply ship USNS Arctic (T-AOE 8) conduct an underway replenishment in the Atlantic Ocean, 14 October 2010. 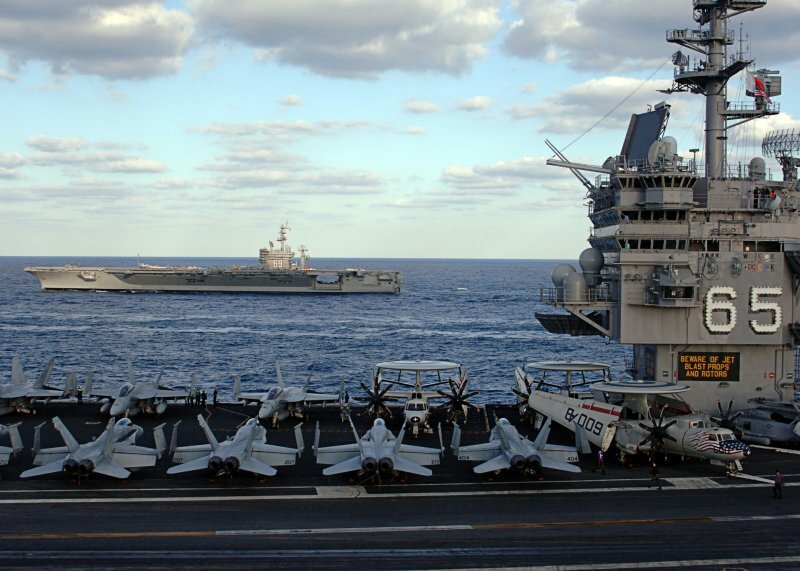 The Enterprise Carrier Strike Group was conducting a Composite Training Unit Exercise in preparation for an upcoming deployment. U.S. Navy photo by Mass Communication Specialist 3rd Class Brooks B. Patton Jr. (# 101014-N-5082P-215). 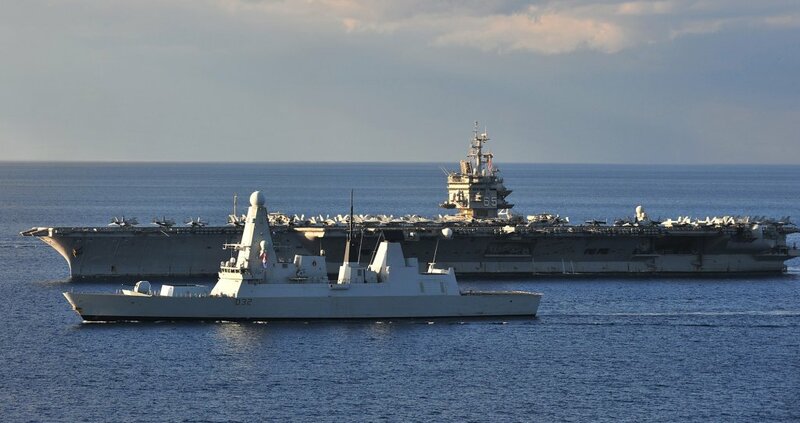 USS Enterprise (CVN-65) underway in the Atlantic Ocean, with the Royal Navy Type 45 destroyer HMS Daring (D32), during a Composite Training Unit Exercise for the Enterprise Carrier Strike Group, 19 October 2010. U.S. Navy photo by Mass Communication Specialist Seaman Alex R. Forster (# 101019-N-1324F-223). 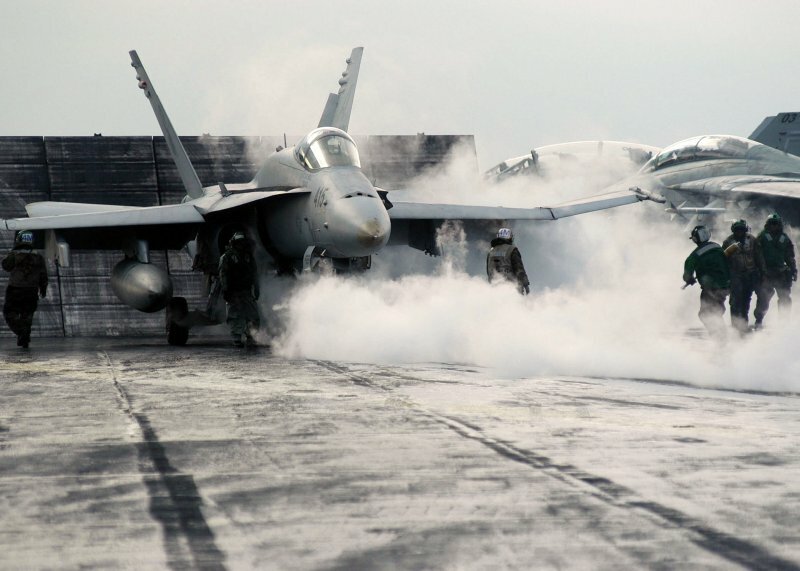 An F/A-18F Super Hornet assigned to Strike Fighter Squadron (VFA) 211 "Fighting Checkmates" about to launch from USS Enterprise (CVN-65), circa 2010–2011. USS Enterprise (CVN-65), left, and guided-missile destroyer USS Mason (DDG-87), seen from USNS Arctic (T-AOE 8), in the Atlantic Ocean, 17 January 2011, en route to the U.S. 5th and 6th Fleets Areas Of Responsibility (AOR). 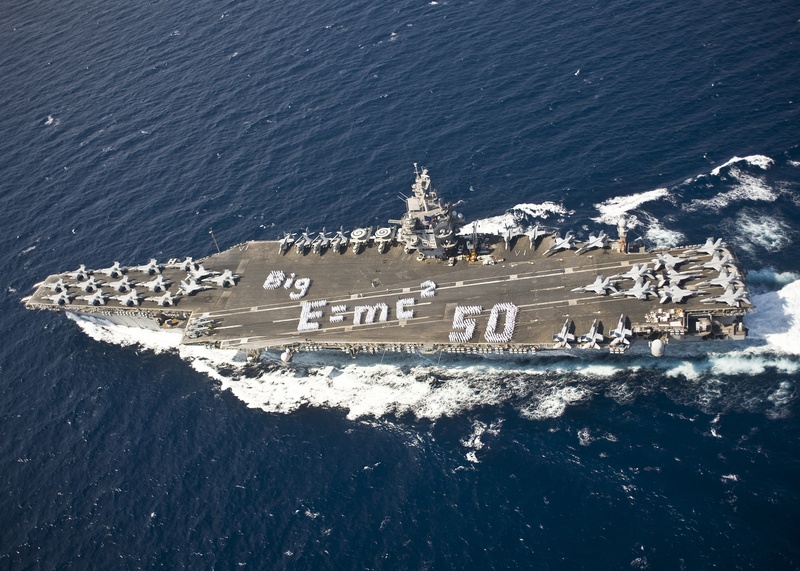 Sailors spell out "E=mc²" on the flight deck of the aircraft carrier USS Enterprise (CVN-65) to commemorate the 50th anniversary of the ship's commissioning, while underway in the Atlantic Ocean, 11 February 2011. 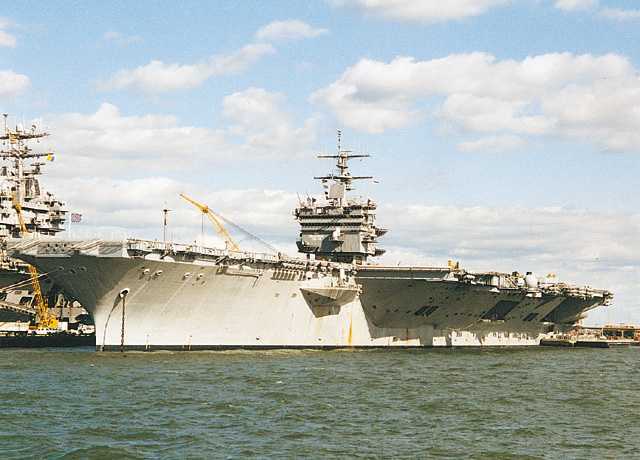 Big E was the first nuclear-powered aircraft carrier, the oldest still in service, and was celebrating her 50th birthday on 25 November 2011. U.S. Navy photo by Mass Communication Specialist 3rd class Alex R. Forster (# 110217-N-WO496-001). 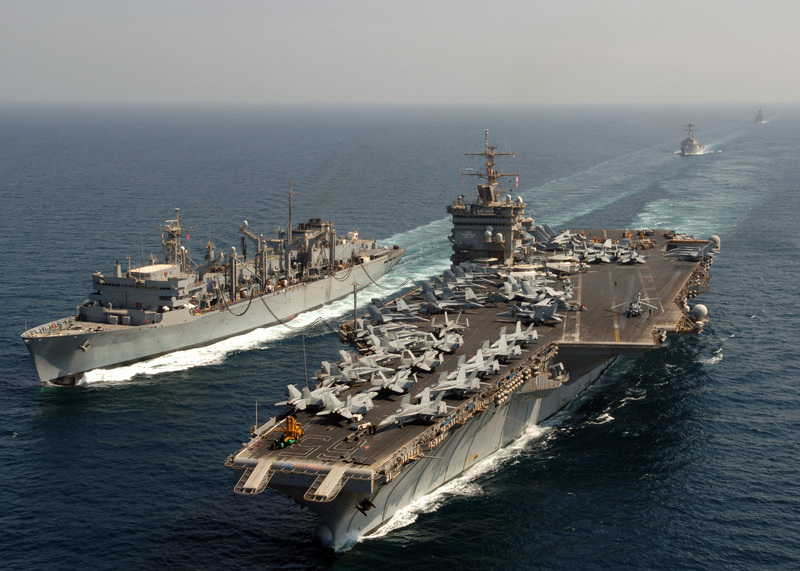 USS Enterprise (CVN-65) and USNS Arctic (T-AOE 8) conduct an UNREP (Underway Replenishment) in the Northern Red Sea, 3 March 2011. 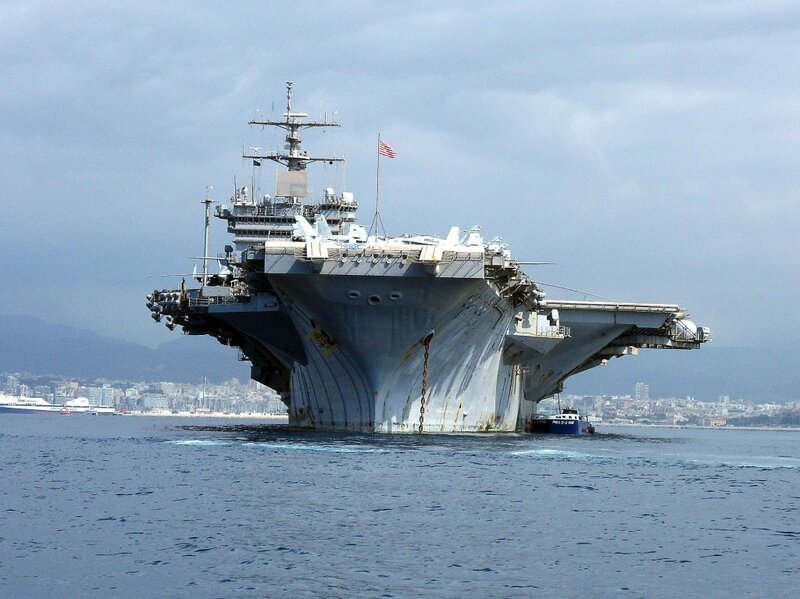 USS Enterprise (CVN-65), with Carrier Air Wing (CVW) 1, Palma de Mallorca, Spain, 29 June 2011. 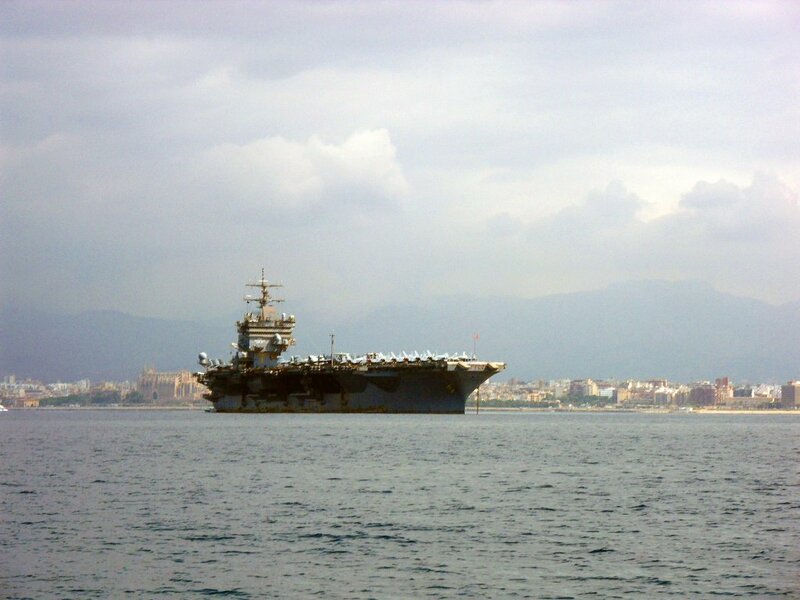 Additional views of USS Enterprise (CVN-65) off Palma de Mallorca, Spain, 1 July 2011. Note the Cathedral of Palma in the background, in photo NS0265ax. Strike Fighter Squadron VFA-11 "Red Rippers," with F/A-18F Hornets, side number 1xx. Strike Fighter Squadron VFA-211 "Fighting Checkmates," with F/A-18F Hornets, side number 2xx. Strike Fighter Squadron VFA-136 "Knighthawks," with F/A-18E Hornets, side number 3xx. Marine Fighter Attack Squadron VMFA-251 "Thunderbolts," with F/A-18C(N) Hornets, side number 4xx. Carrier Tactical Electronic Warfare Squadron VAQ-137 "Rooks," with EA-6B Prowlers, side number 5xx. Carrier Airborne Early Warning Squadron VAW-123 "Screwtops," with E-2C 2000 Hawkeyes, side number 6xx. Helicopter Anti-Submarine Squadron HS-11 "Dragon Slayers," with SH-60F and HH-60H Seahawks, side number 61x. COD aircraft, not part of CVW-1, were C-2A(R) Greyhounds from Fleet Logistics Support Squadron VRC-40 "Rawhides." 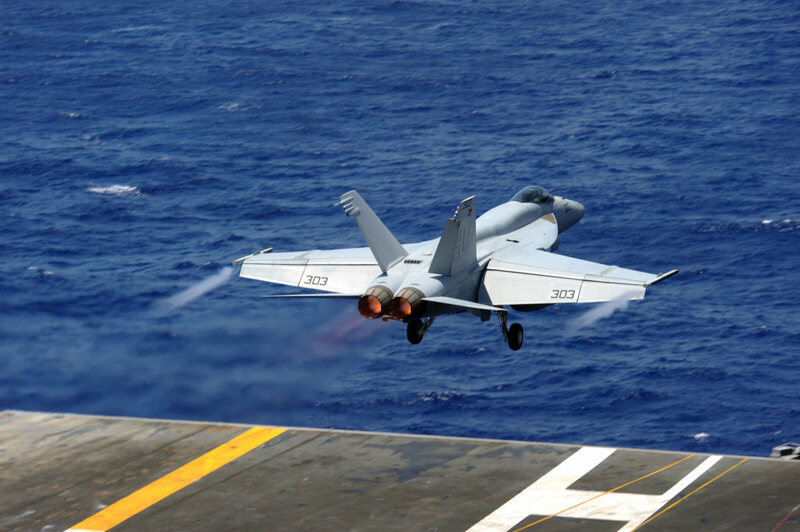 An F/A-18E Super Hornet assigned to the "Knighthawks" of Strike Fighter Squadron (VFA) 136 launches from the aircraft carrier USS Enterprise (CVN-65), 11 July 2011, as part of training for a Tiger Cruise Air Power Demonstration. 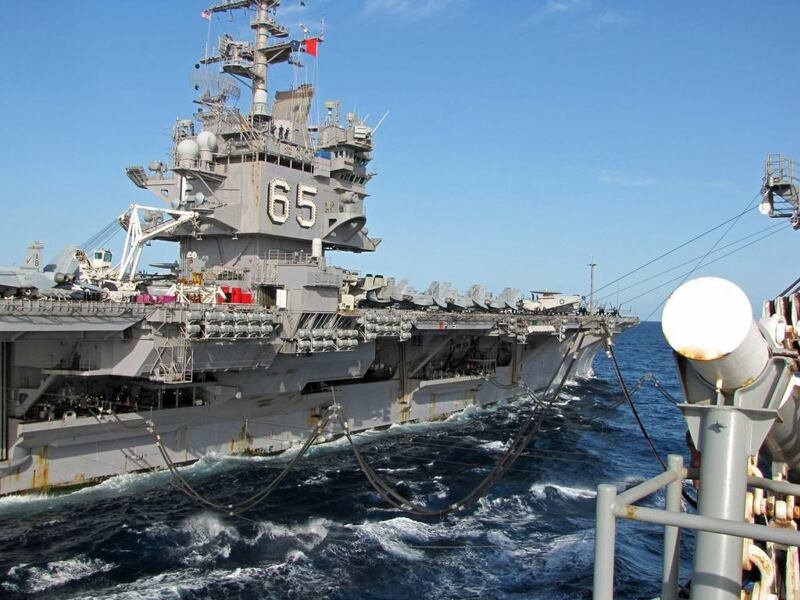 Enterprise and Carrier Air Wing (CVW) 1 were in the Atlantic Ocean, completing a six-month deployment to the U.S. 5th and 6th Fleet Areas of Responsibility (AOR). U.S. Navy photo by Mass Communication Specialist 3rd Class Jared M. King (# 110711-N-CH661-088). 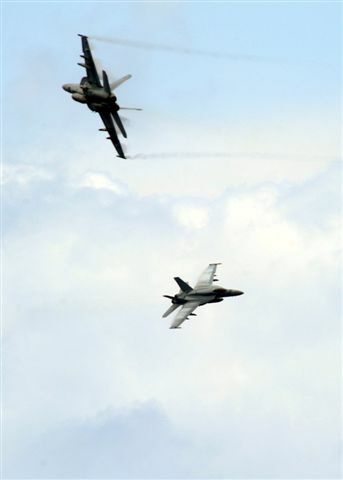 Two F/A-18 Hornets perform aerial combat maneuvers as part of training for a Tiger Cruise Air Power Demonstration aboard USS Enterprise (CVN-65). Atlantic Ocean, 11 July 2011. U.S. Navy photo by Mass Communication Specialist 3rd Class Jared M. King (# 110711-N-CH661-132). 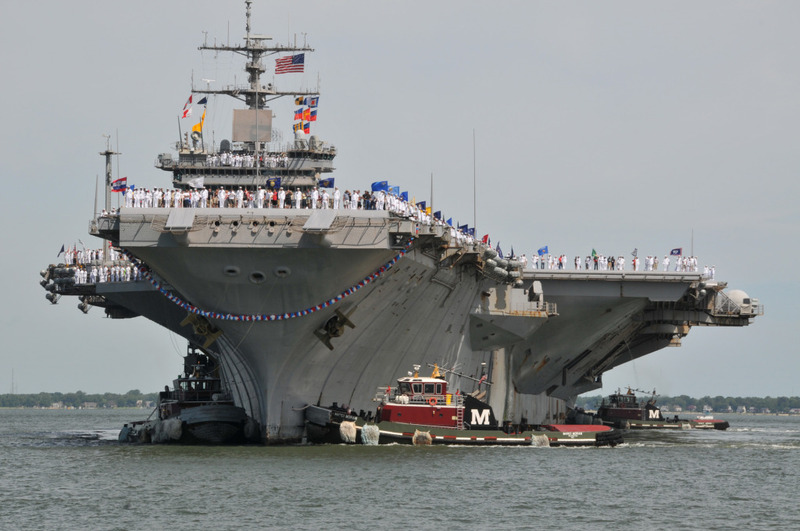 USS Enterprise (CVN-65) returns to Naval Station Norfolk, 15 July 2011, after a six-month deployment to the U.S. 5th and 6th Fleet Areas Of Responsibility (AOR). U.S. Navy photo by Mass Communication Specialist 2nd Class Rafael Martie (# 110715-N-QY430-099). The aircraft carrier USS Enterprise (CVN-65), left, and the Arleigh Burke-class guided-missile destroyers USS Porter (DDG-78) and USS Cole (DDG-67) underway, 4 February 2012, while participating in exercise Bold Alligator 2012, the largest naval amphibious exercise in 10 years. Bold Alligator 2012 represented the Navy and Marine Corps' revitalization of the full range of amphibious operations. The exercise focused on current fight with current forces, while showcasing the advantages of seabasing. B.A. 2012 took place January 30 through February 12, afloat and ashore in and around Virginia and North Carolina. U.S. Navy photo by Boatswain's Mate 2nd Class Alfredo R. Martinez II (# 120204-N-ZZ999-006). 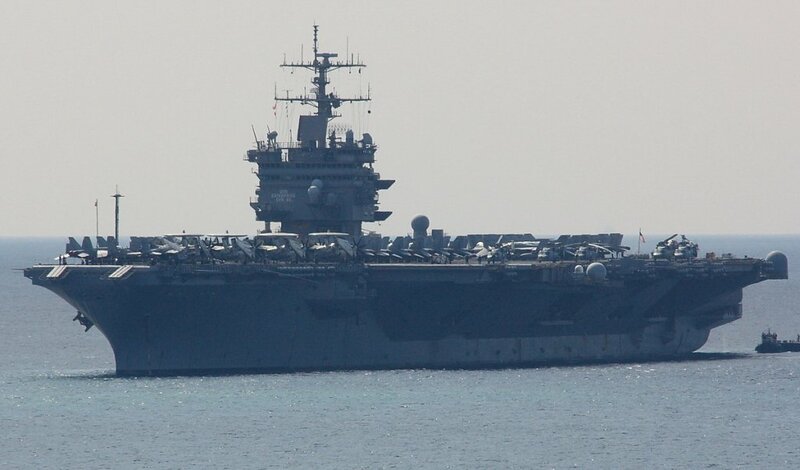 USS Enterprise (CVN-65) departs on her final deployment from Naval Station Norfolk, 11 March 2012. 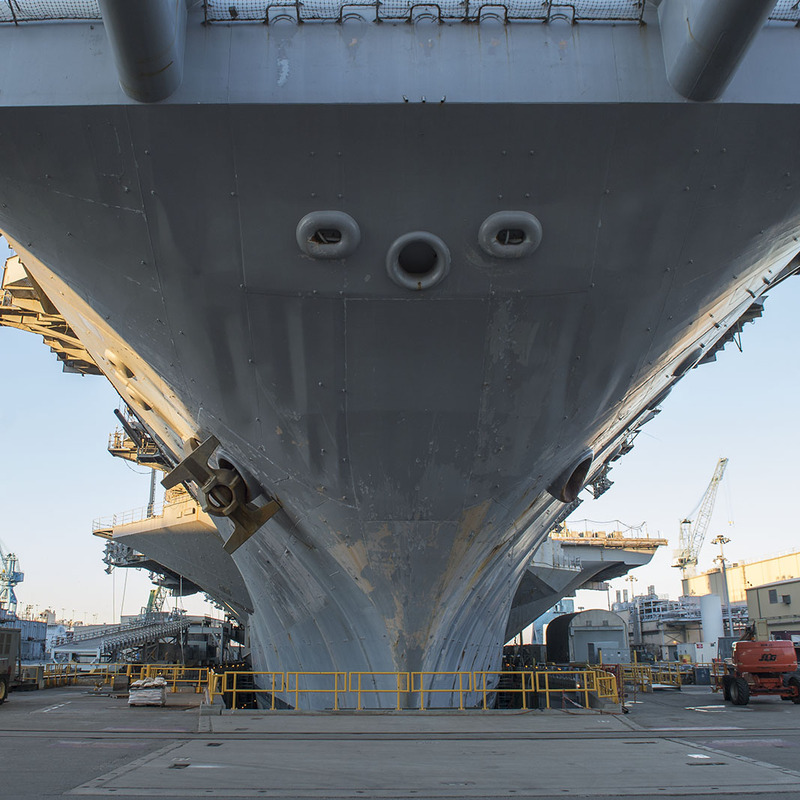 The Big E was deploying as part of Enterprise Carrier Strike Group to support maritime security operations and theater security cooperation efforts in the U.S. 5th and 6th Fleet Areas Of Responsibility (AOR). U.S. Navy photo by Mass Communication Specialist 2nd Class Rafael Martie (# 120311-N-QY430-103). 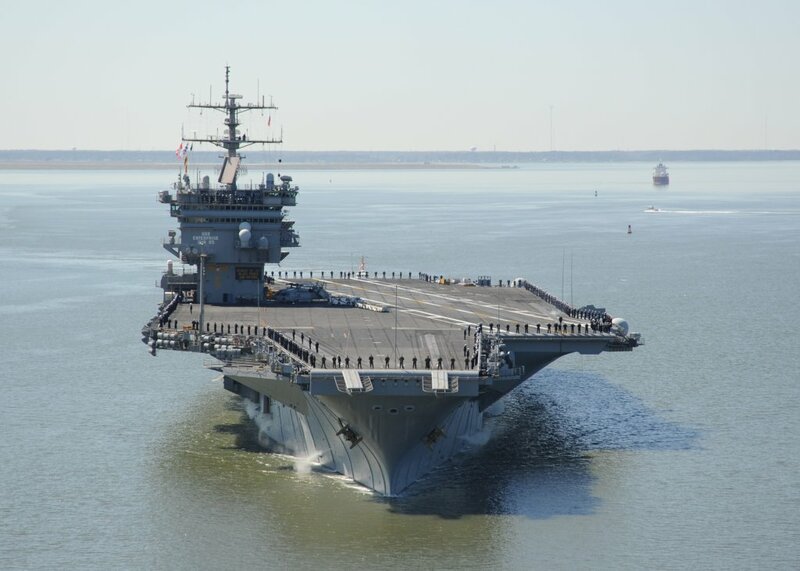 USS Enterprise (CVN-65) departs Naval Station Norfolk, Va., 11 March 2012, for the ship's 25th and final deployment. 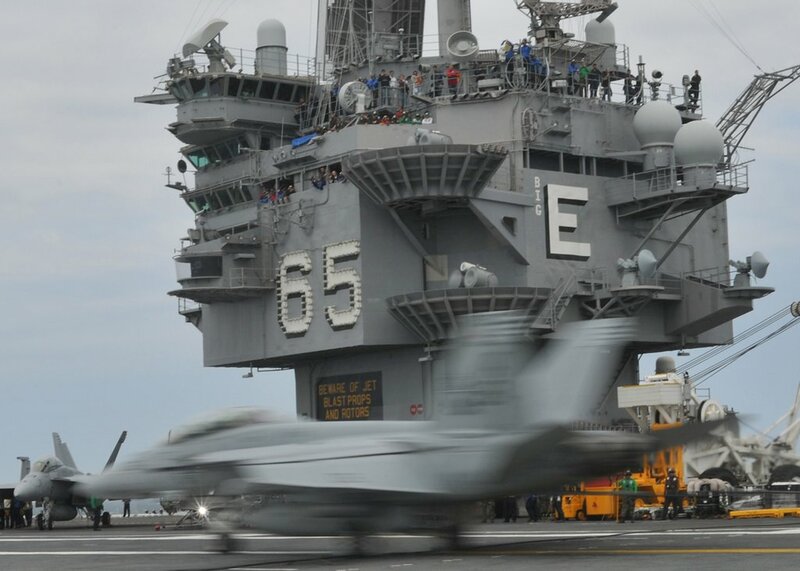 The aircraft carrier was deploying as part of the Enterprise Carrier Strike Group to support maritime security operations and theater security cooperation efforts in the U.S. 5th Fleet and U.S. 6th Fleet Areas Of Responsibility. U.S. Navy photo by Mass Communication Specialist Seaman Harry Andrew D. Gordon (# 120311-N-VH054-242). 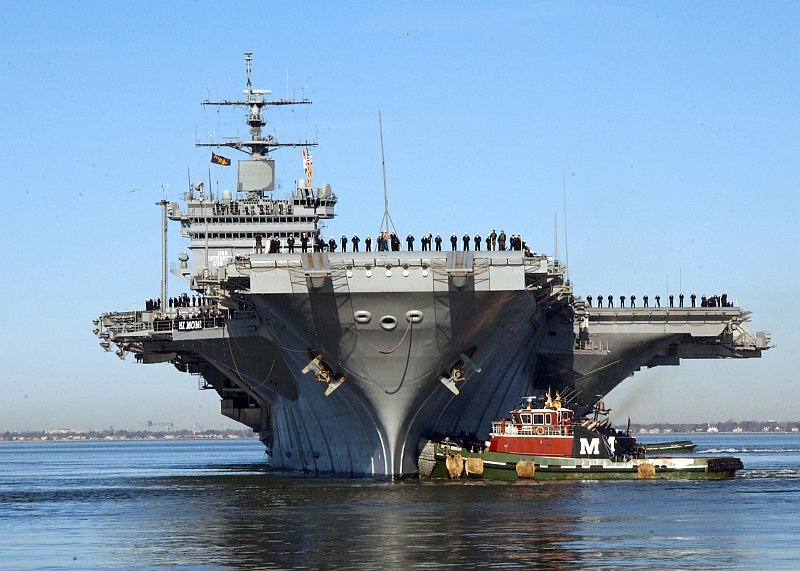 USS Enterprise (CVN-65) departs Naval Station Norfolk, Va., 11 March 2012, for the ship's 25th and final deployment. 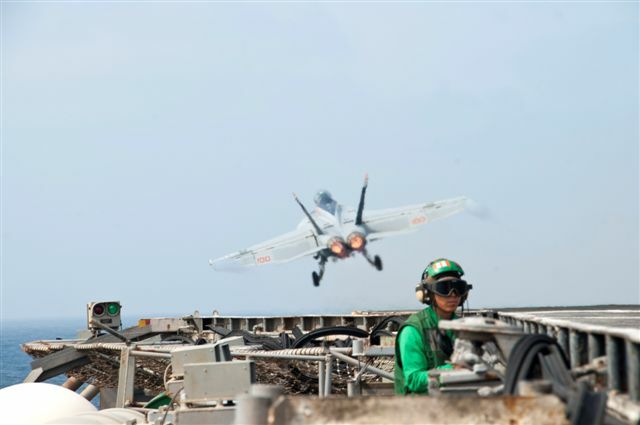 The aircraft carrier was deploying as part of the Enterprise Carrier Strike Group to support maritime security operations and theater security cooperation efforts in the U.S. 5th Fleet and U.S. 6th Fleet Areas Of Responsibility. U.S. Navy photo by Mass Communication Specialist Seaman Harry Andrew D. Gordon (# 120311-N-VH054-366). 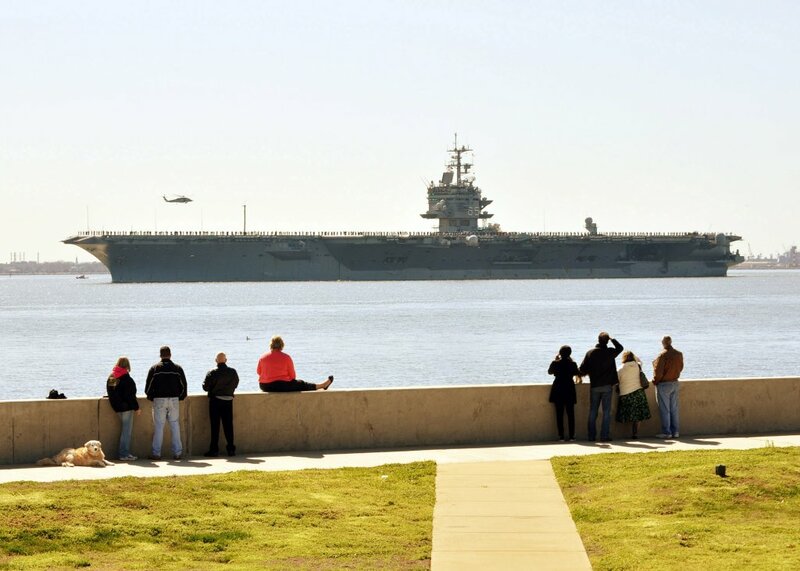 Spectators gather at Fort Monroe National Monument in Hampton, Va., as USS Enterprise (CVN-65) departs Naval Station Norfolk, Va., 11 March 2012, on her final deployment before decommissioning. 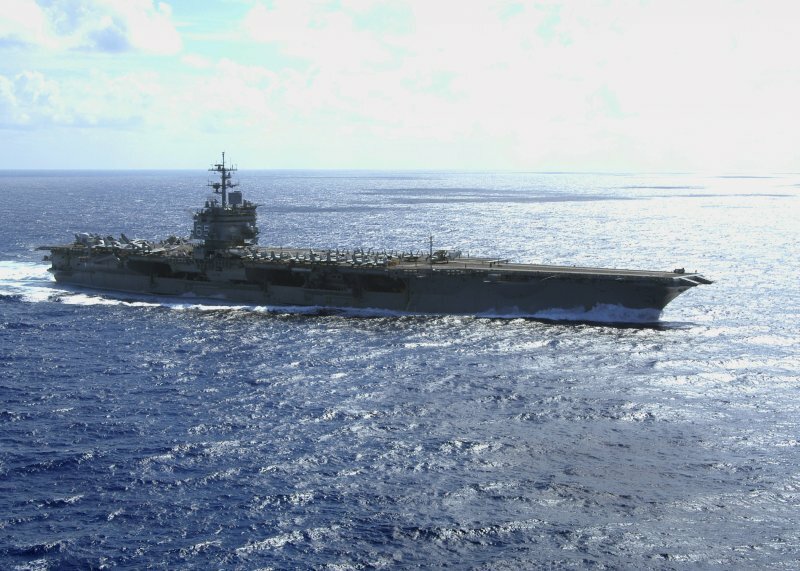 The Big E and her Carrier Strike Group were deploying to the U.S. 5th Fleet and 6th Fleet Areas Of Responsibility to support maritime security operations and theater security cooperation efforts. U.S. Navy photo by Mass Communication Specialist 1st Class Julie Matyascik (# 120311-N-YC845-009). 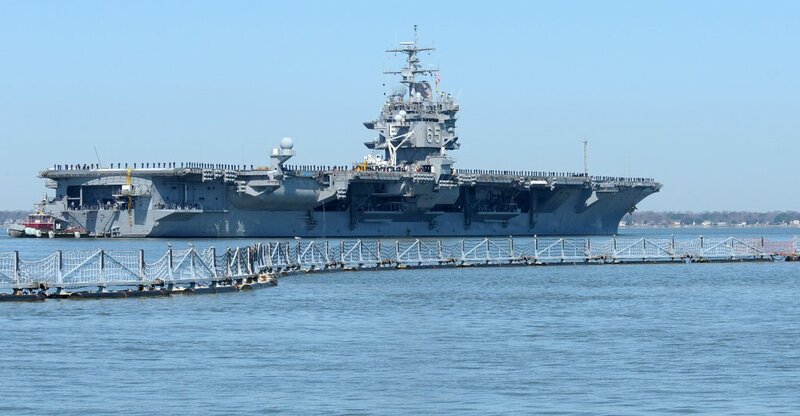 USS Enterprise (CVN-65) departs Naval Station Norfolk, Va., 11 March 2012, for the ship's 25th and final deployment. 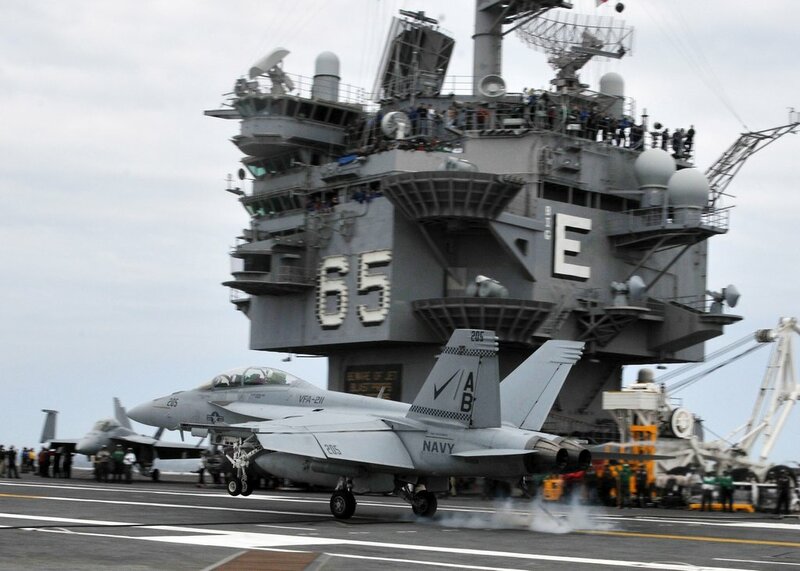 The aircraft carrier was deploying as part of the Enterprise Carrier Strike Group to support maritime security operations and theater security cooperation efforts in the U.S. 5th Fleet and U.S. 6th Fleet Areas Of Responsibility. U.S. Navy photo by Mass Communication Specialist Seaman Frank J. Pikul (# 120311-N-ZE938-078). 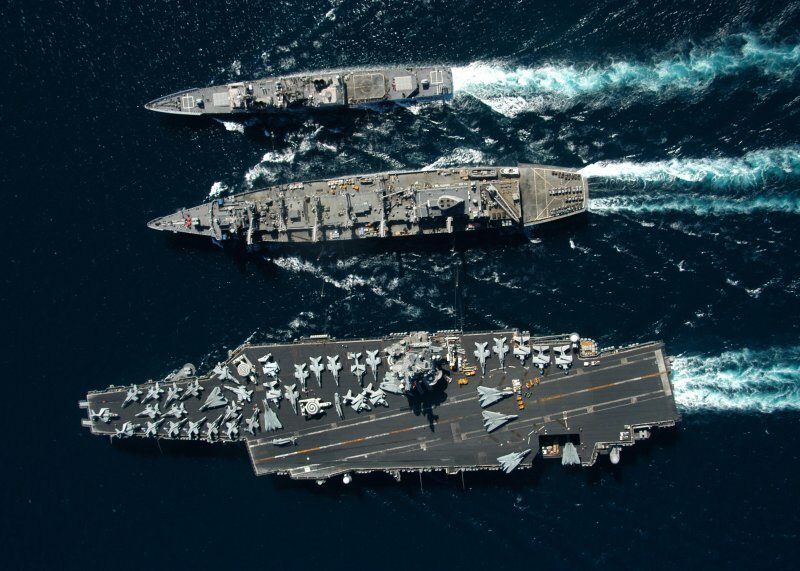 Left to right: USS Enterprise (CVN-65), the Arleigh Burke-class guided-missile destroyer USS Porter (DDG-78), the Military Sealift Command fast combat support ship USNS Supply (T-AOE 6), and the guided missile cruiser USS Vicksburg (CG-69), conduct a Replenishment At Sea in the Atlantic Ocean, 21 March 2012. 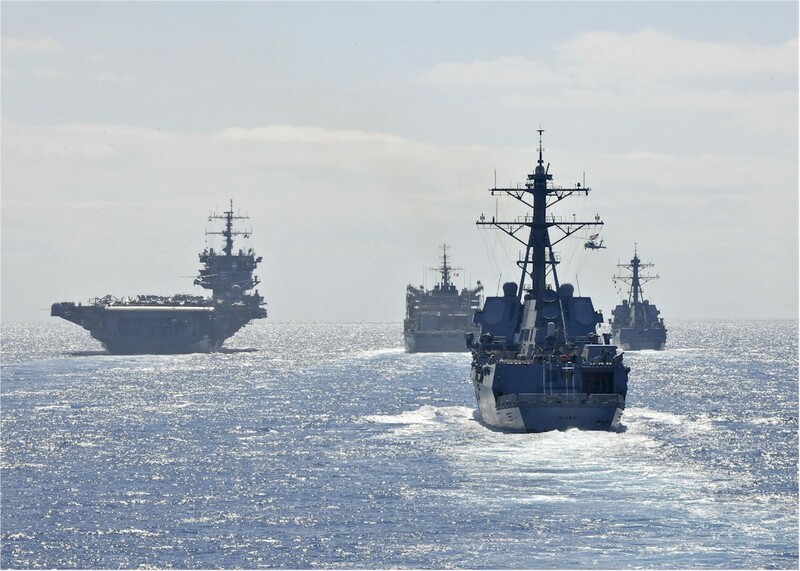 All four ships were deployed as part of the Enterprise Carrier Strike Group supporting maritime security operations and theater security cooperation efforts in the U.S. 6th Fleet Area Of Responsibility. U.S. Navy photo by Mass Communication Specialist 3rd Class Daniel J. Meshel (# 120321-N-NL401-017). 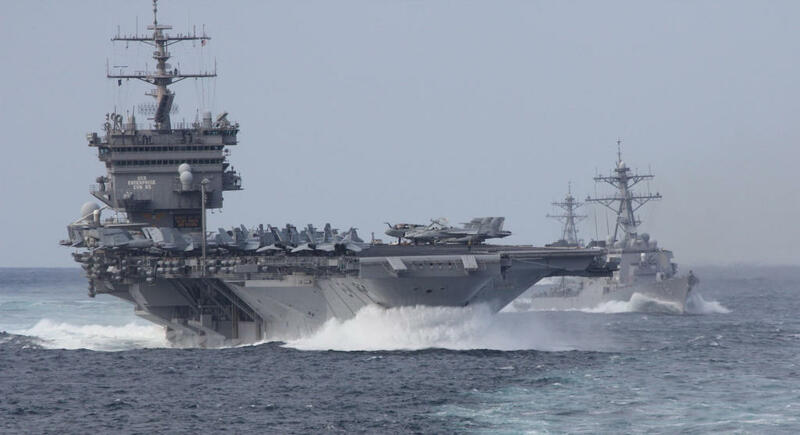 USS Enterprise (CVN-65) underway in the Atlantic Ocean, 21 March 2012. U.S. Navy photo by Mass Communication Specialist 3rd Class Alex R. Forster (# 120321-N-WO496-136). 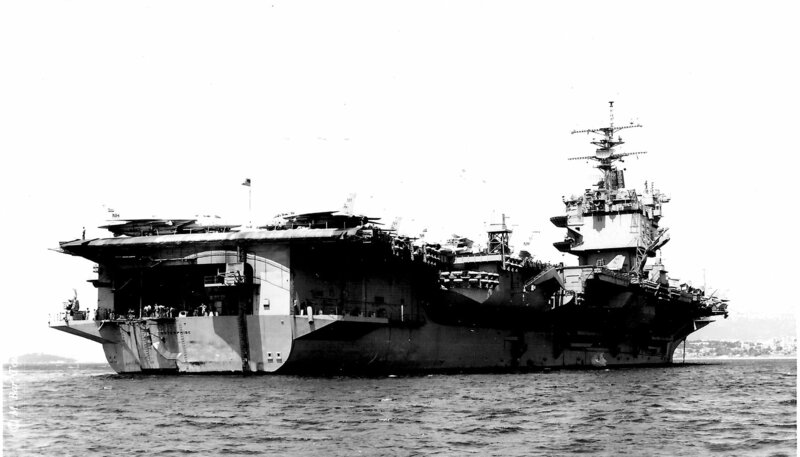 USS Enterprise (CVN-65), with Carrier Air Wing (CVW) 1. Piraeus, Greece, 28 March 2012. 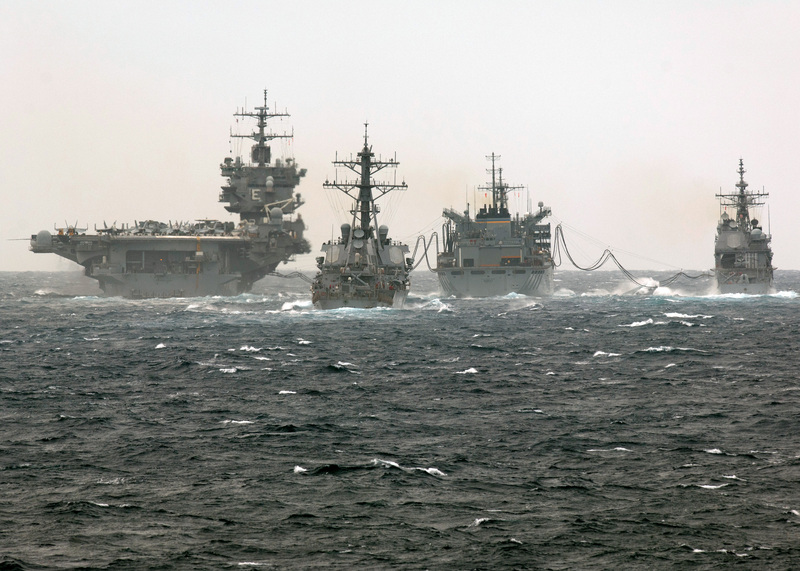 Left to right: USS Enterprise (CVN-65), Military Sealift Command fast combat support ship USNS Supply (T-AOE 6) and Arleigh Burke-class guided missile destroyers USS Nitze (DDG-94) and USS James E. Williams (DDG-95) conduct a replenishment at sea in the Mediterranean Sea, 2 April 2012. 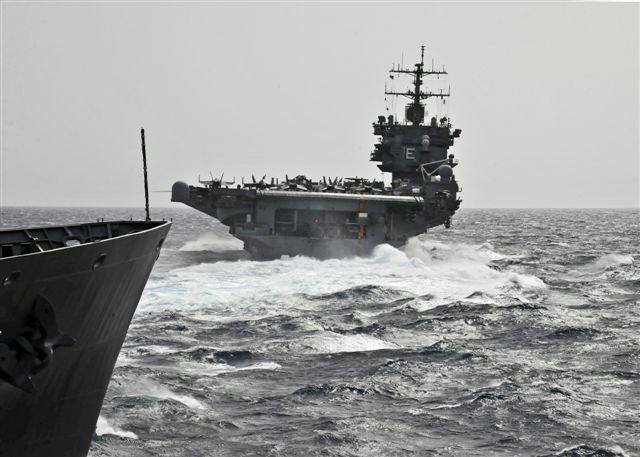 The ships were deployed as part of the Enterprise Carrier Strike Group to support maritime security operations and theater security cooperation efforts in the U.S. 6th Fleet Area Of Responsibility. U.S. Navy photo by Mass Communication Specialist 3rd Class Alex R. Forster, USN (# 120402-N-WO496-038). F/A-18 Super Hornets assigned to Carrier Air Wing (CVW) 1, embarked aboard the aircraft carrier USS Enterprise (CVN-65), perform a missing-man flyover formation to commemorate the 70th anniversary of the Battle of Midway, 3 June 2012, in the Persian Gulf. 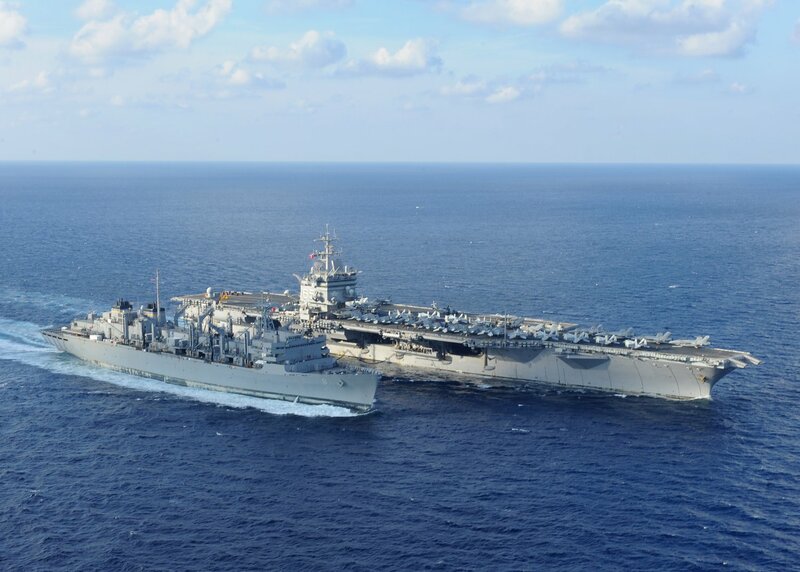 The Big E was deployed to the U.S. 5th Fleet Area Of Responsibility conducting maritime security operations, theater security cooperation efforts and support missions as part of Operation Enduring Freedom. U.S. Navy photo by Mass Communication Specialist Seaman Brian G. Reynolds (# 120603-N-ED185-068). 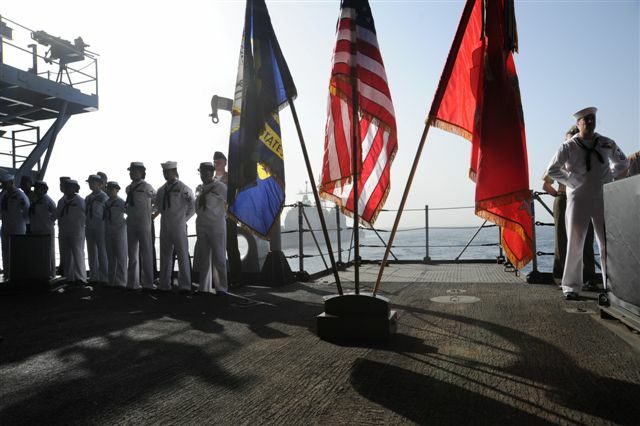 Sailors and Marines aboard the aircraft carrier USS Enterprise (CVN-65) participate in a memorial ceremony commemorating the 70th anniversary of the Battle of Midway. 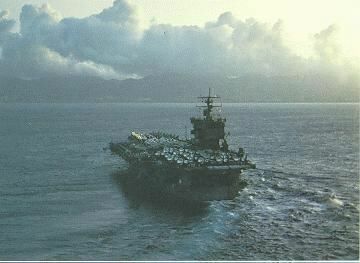 The previous USS Enterprise (CV-6), played a key role in the battle. 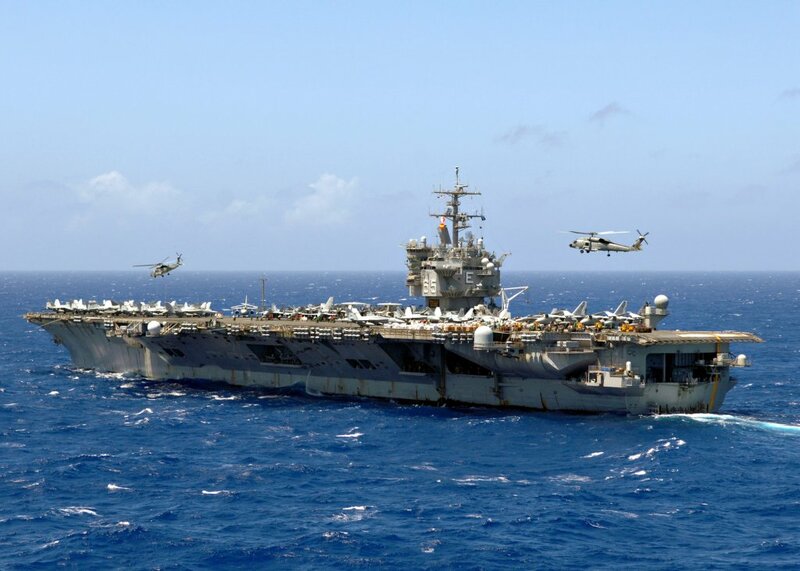 Enterprise was deployed to the U.S. 5th Fleet Area Of Responsibility conducting maritime security operations, theater security cooperation efforts and support missions as part of Operation Enduring Freedom. NS0265co: U.S. Navy photo by MCSN Randy J. Savarese (# 120604-N-JV638-017). NS0265coa: U.S. Navy photo by Mass Communication Specialist 3rd Class Nick C. Scott (# 120604-N-PK218-034). NS0265cob: U.S. Navy photo by MCSN Gregory White (# 120604-N-RB391-092). 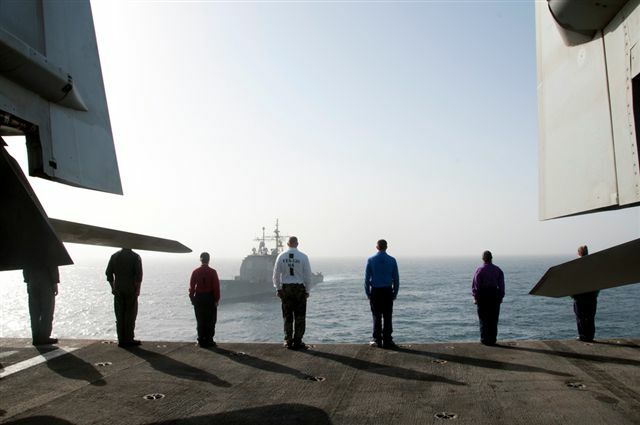 Persian Gulf, 4 June 2012. 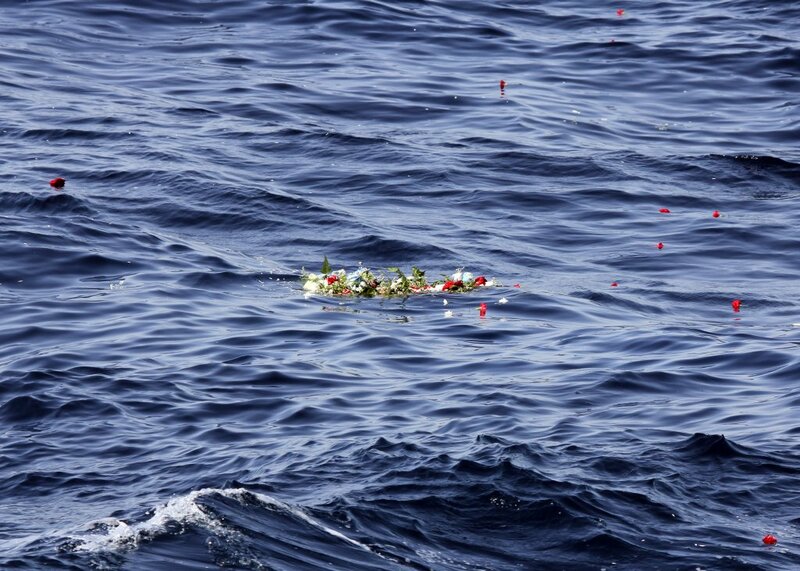 A wreath that was part of a memorial ceremony commemorating the 70th anniversary of the Battle of Midway floats away after being dropped into the sea from the aircraft carrier USS Enterprise (CVN-65). 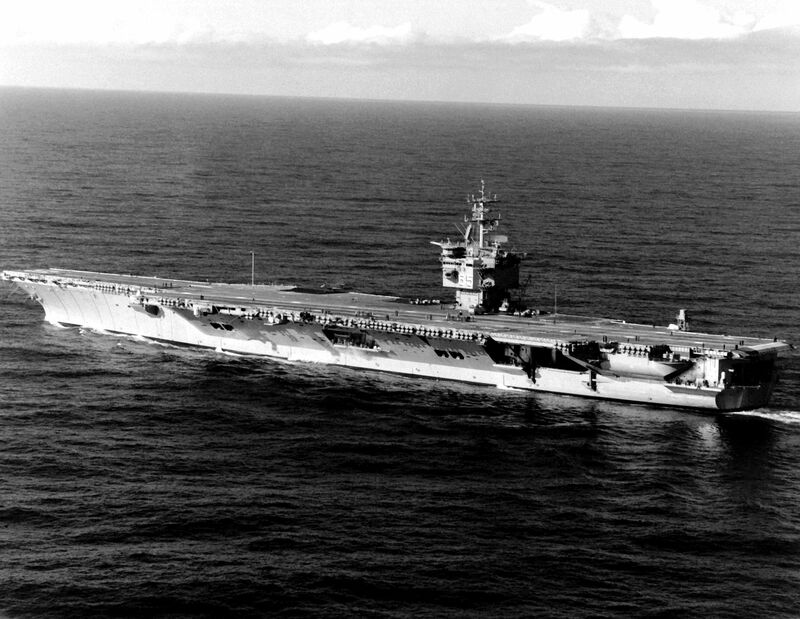 The previous USS Enterprise (CV-6), played a key role in the battle. 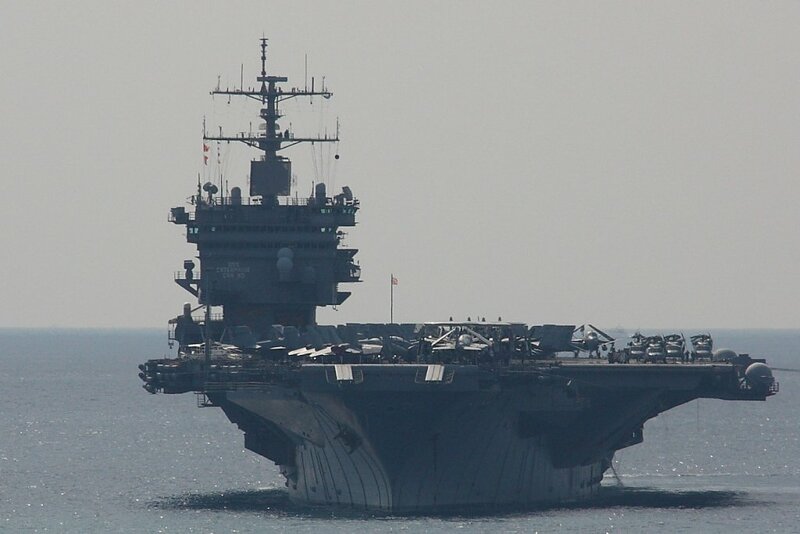 Persian Gulf, 4 June 2012. U.S. Navy photo by Chief Intelligence Specialist Daniel B. Mayfield (# 120604-N-ZZ999-082). 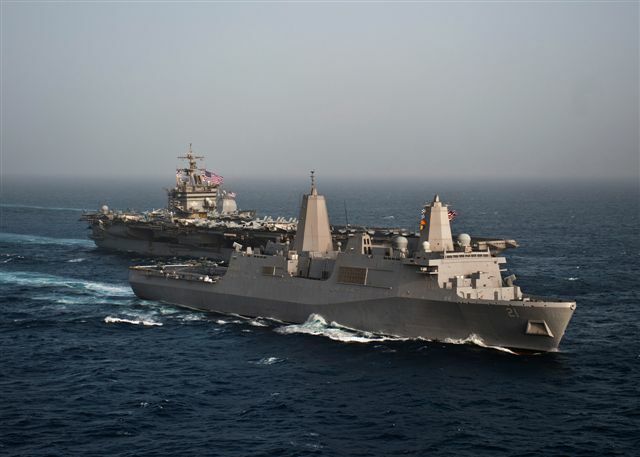 USS New York (LPD-21) transits alongside USS Enterprise (CVN-65)—background—in the Persian Gulf, 9 June 2012. US Navy photo by MC3 Scott Pittman (# 120609-N-FI736-780). 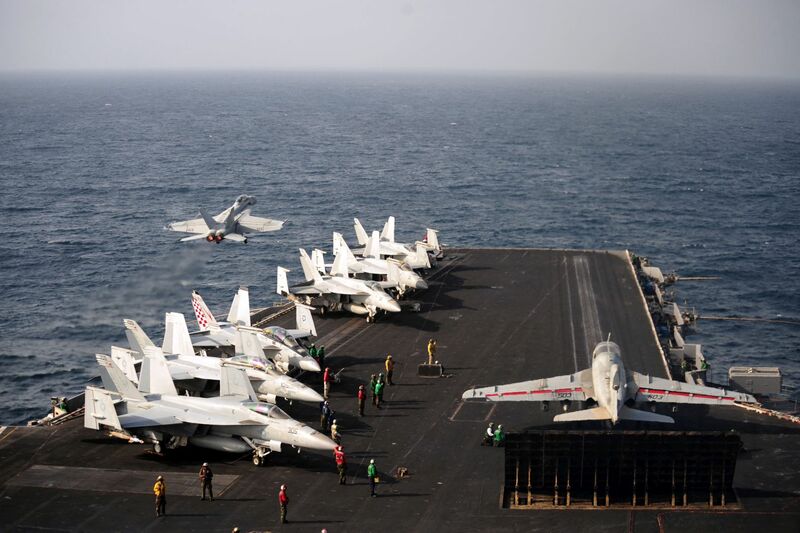 An aircraft launches from the flight deck of USS Enterprise (CVN-65) in the Arabian Sea, 14 July 2012. 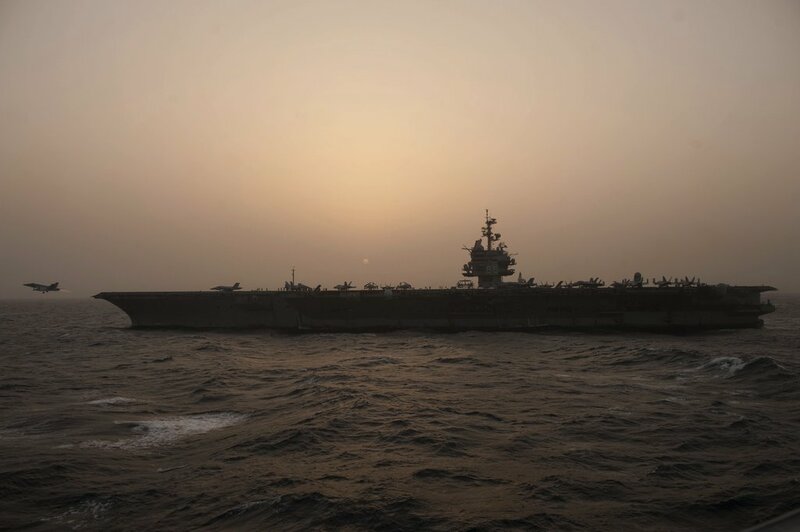 The Big E was deployed to the U.S. 5th Fleet Area Of Responsibility conducting maritime security operations, theater security cooperation efforts and support missions as part of Operation Enduring Freedom. U.S. Navy photo by Mass Communication Specialist 3rd Class Jeff Atherton (# 120714-N-AP176-079). 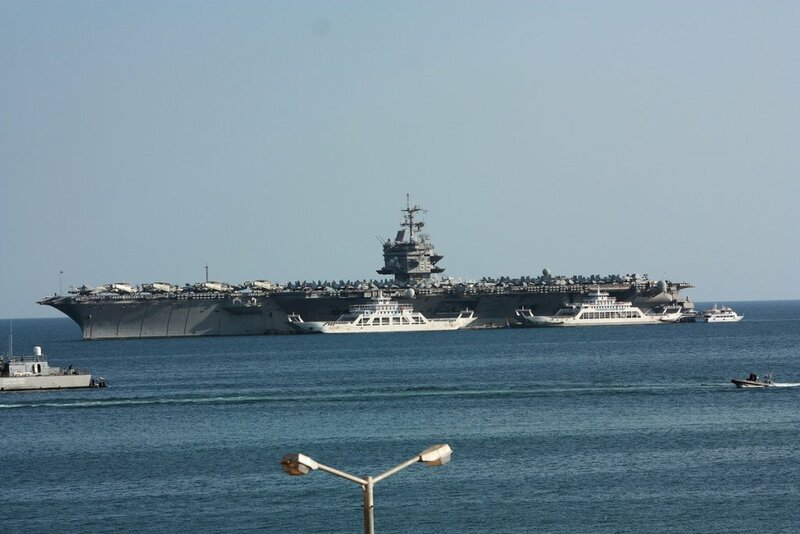 USS Enterprise (CVN-65) transits the Arabian Sea, 2 August 2012. U.S. Navy photo by Mass Communication Specialist 3rd Class Jared King (# 120802-N-CH661-072). 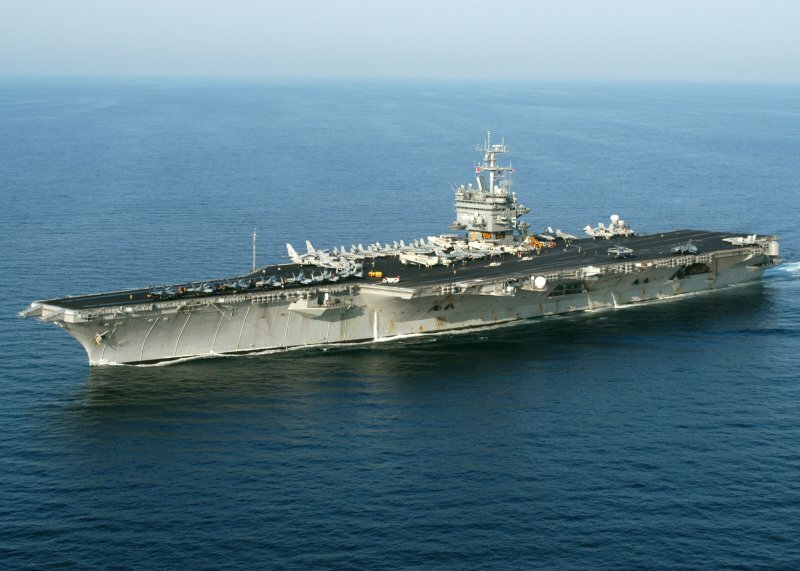 USS Enterprise (CVN-65) conducts flight operations in the Arabian Sea, 4 September 2012. 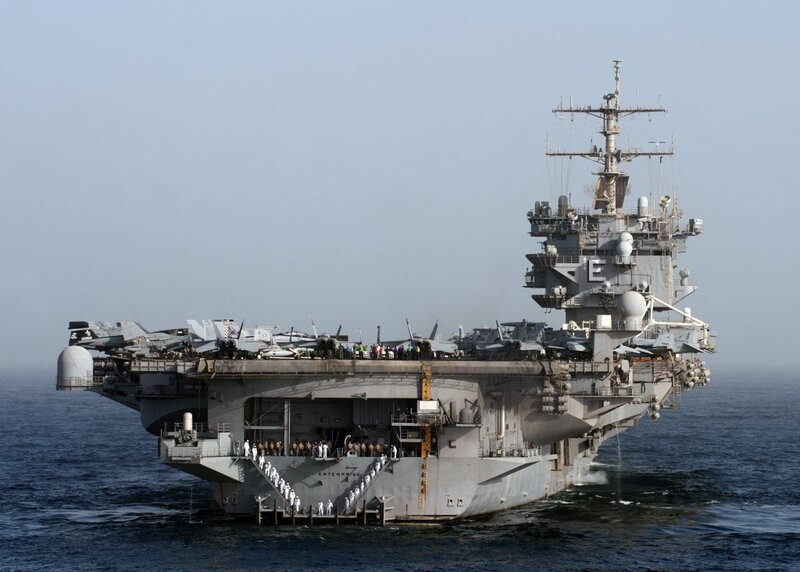 The Big E was deployed to the U.S. 5th Fleet area of responsibility conducting maritime security operations, theater security cooperation efforts and support missions as part of Operation Enduring Freedom. U.S. Navy photo by Mass Communication Specialist 3rd Class Jared King (# 120904-N-CH661-119). F/A-18F Super Hornet, BuNo 166628, modex AB100, attached to Strike Fighter Squadron (VFA) 11 "Red Rippers," Carrier Air Wing (CVW) 1, launches from USS Enterprise (CVN-65) in the Arabian Sea, 4 September 2012. U.S. Navy photo by Mass Communication Specialist 3rd Class Randy J. Savarese (# 120904-N-JV638-108). F/A-18F Super Hornet, BuNo 166628, modex AB100, attached to Strike Fighter Squadron (VFA) 11 "Red Rippers," Carrier Air Wing (CVW) 1, recovers aboard USS Enterprise (CVN-65) in the Arabian Sea, 4 September 2012. U.S. Navy photo by Mass Communication Specialist 3rd Class Randy J. Savarese (# 120904-N-JV638-261). 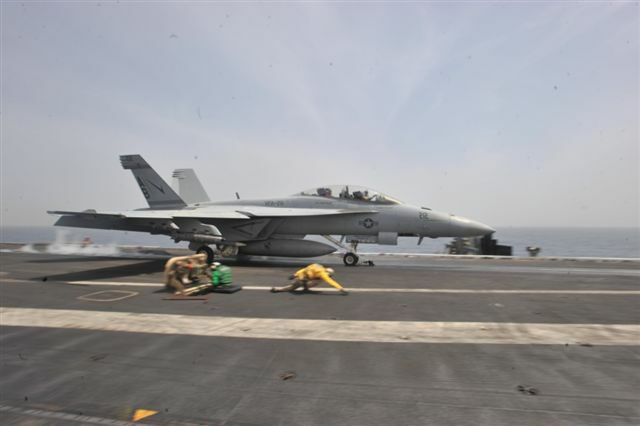 Lt. Col. Simon Doran, commanding officer of the "Thunderbolts" of Marine Fighter Attack Squadron (VMFA) 251, launches in an F/A-18C Hornet from the flight deck of USS Enterprise (CVN-65) in the Arabian Sea, 8 September 2012. 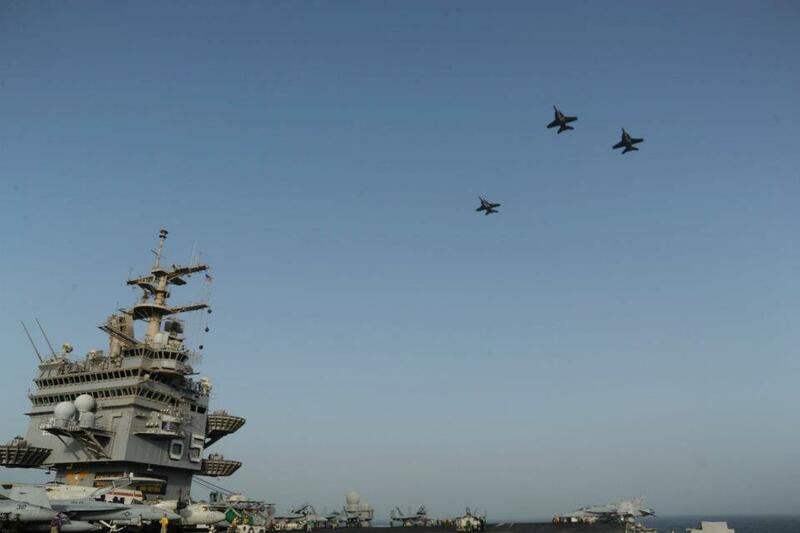 The aircraft carrier was deployed to the U.S. 5th Fleet area of responsibility conducting maritime security operations, theater security cooperation efforts and support missions as part of Operation Enduring Freedom. U.S. Navy photo by Mass Communication Specialist 3rd Class Jared King (# 120908-N-CH661-088). 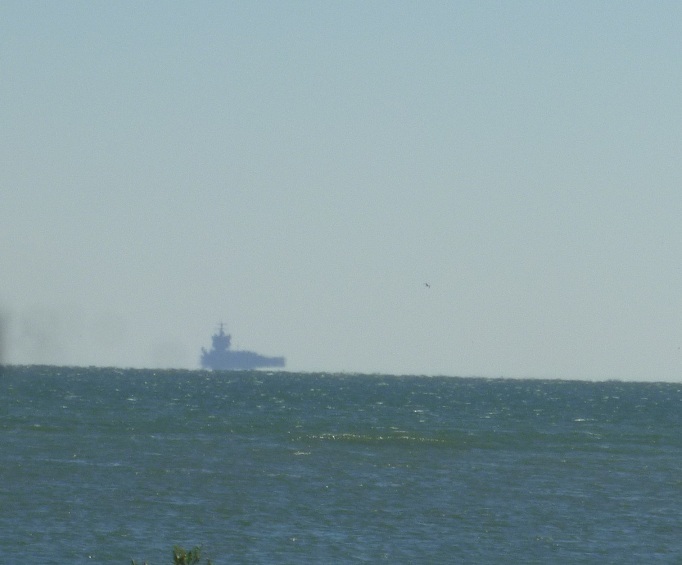 "The horizon view was taken on 31 October 2012 from the South end of Little Talbot Island, FL (across from NS Mayport) as USS Enterprise (CVN-65) was coming in off her last deployment." "The second is a stern view taken on 31 October 2012 from Huguenot Park, FL directly across from NS Mayport and the third is a bow view taken at NS Mayport after she pulled in on 31 October 2012." 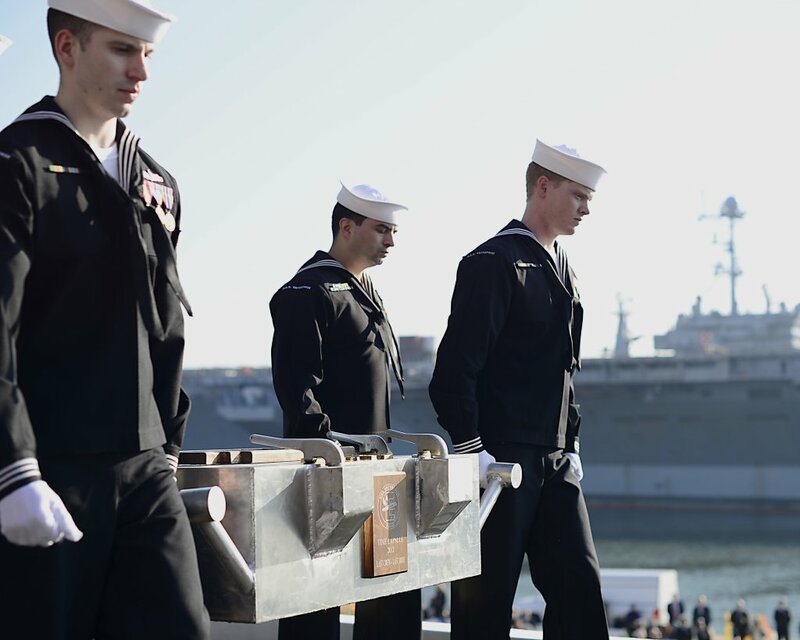 Sailors assigned to the aircraft carrier USS Enterprise (CVN-65) carry a time capsule filled with messages and mementos for the crew of the next ship to carry the Enterprise name during the ship's inactivation ceremony. 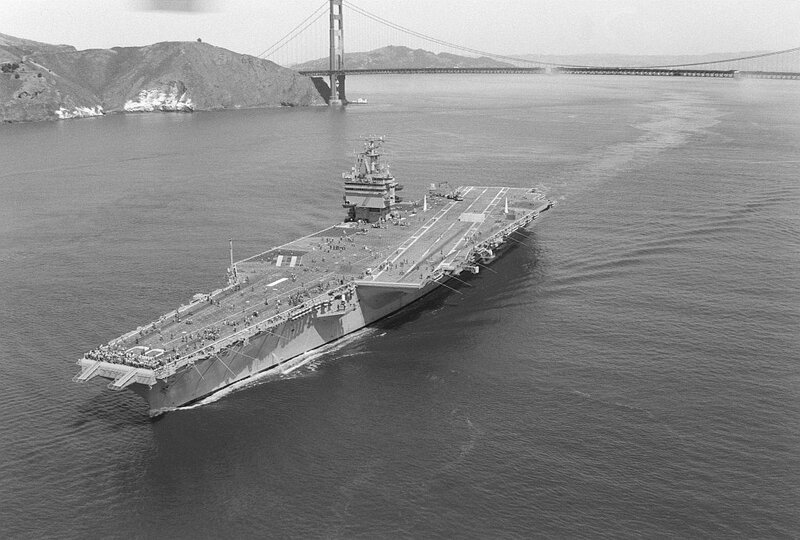 The Big E was commissioned in 1961 and inactivated in 2012, after 51 years of service. U.S. Navy photo by Mass Communication Specialist 2nd Class Brooks B. Patton (# 121201-N-JL826-239). 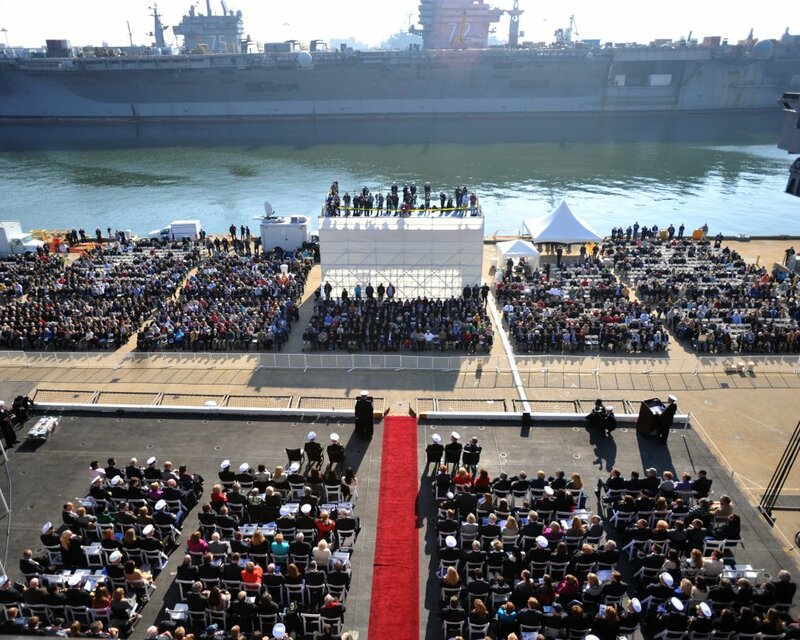 Ceremony attendees observe the inactivation ceremony of the aircraft carrier USS Enterprise (CVN-65). U.S. Navy photo by Mass Communication Specialist 2nd Class (SW/AW) Nick C. Scott (# 121201-N-OP638-001). 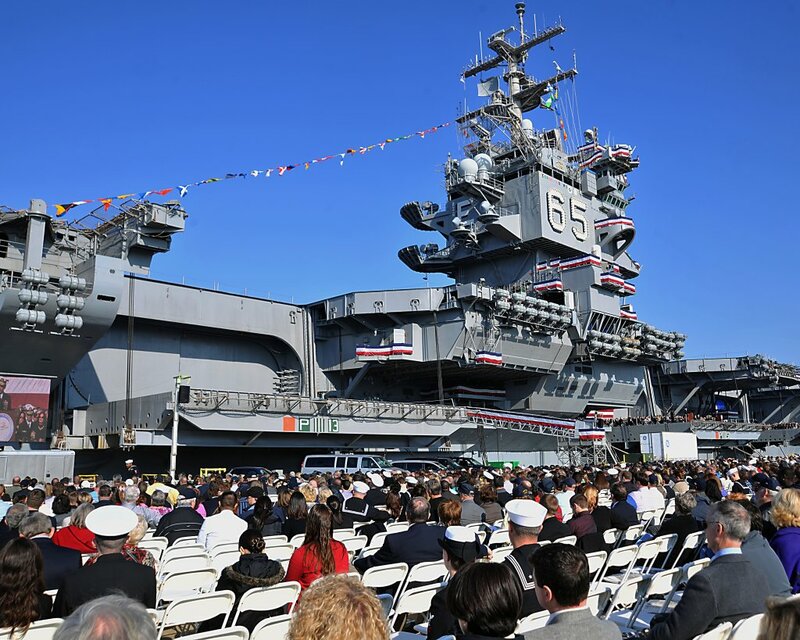 Attendees observe the inactivation ceremony of the aircraft carrier USS Enterprise (CVN-65). U.S. Navy photo by Mass Communication Specialist 2nd Class Alex Forster (# 121201-N-WO496-203). 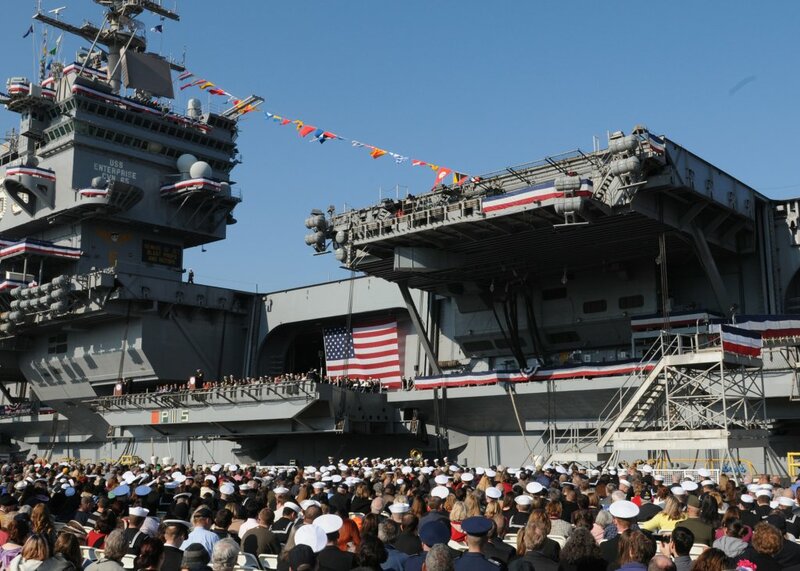 Guests observe the inactivation ceremony of the aircraft carrier USS Enterprise (CVN 65), 1 December 2012. U.S. Navy photo by Mass Communication Specialist Seaman Joshua E. Walters (# 121201-N-NB694-020). 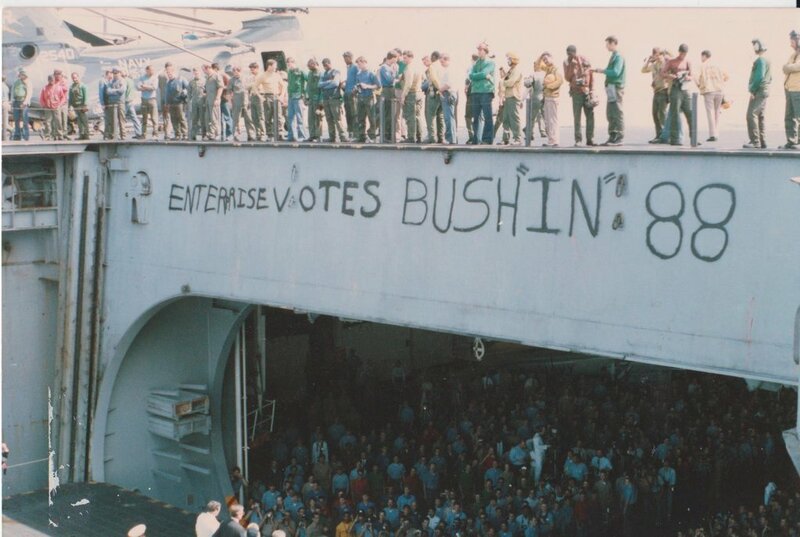 Secretary of the Navy Ray Mabus pays tribute to the past and current crews of USS Enterprise and announces that CVN-80 will be named Enterprise. "Long Live the Legend." 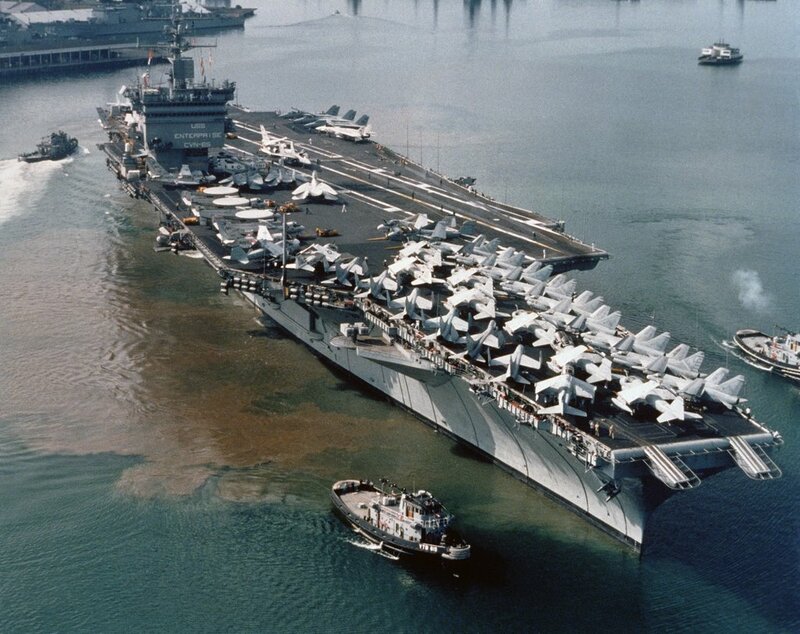 A visual history of USS Enterprise (CVN-65) and the sailors who manned her through the years, set to President John F. Kennedy's remarks to the Naval Academy graduating class of 1961. Produced by MC2 Joseph Guerra, USS Enterprise Media Department. 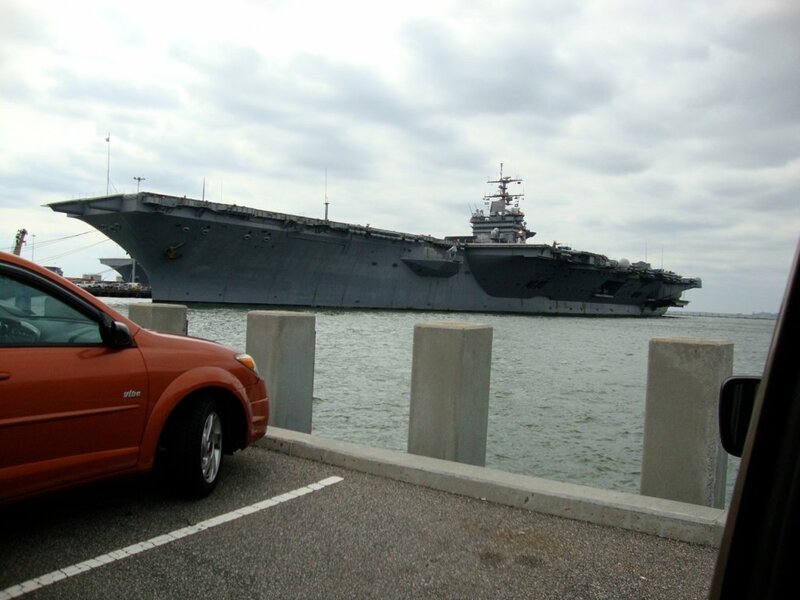 The oldest nuclear-powered American carrier, ex-USS Enterprise (CVN-65), the "Big E", at the end of her life, and the newest, the future USS Gerald R. Ford (CVN-78) at the beginning of hers, as viewed from Victoria Landing Park, Newport News, VA, 21 November 2013. 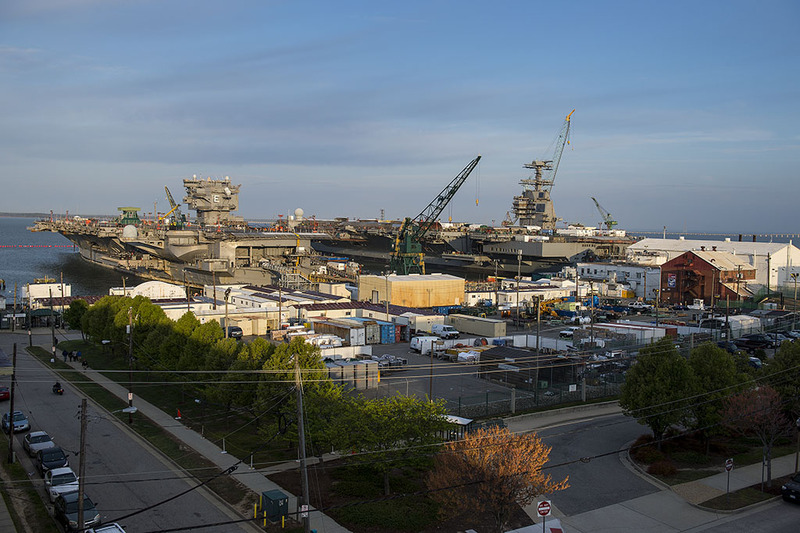 Aircraft carriers Enterprise (CVN-65) and Gerald R. Ford (CVN-78) are docked alongside each other in the South Yard, as seen from the Navy Garage, Newport News, VA, 22 April 2014. 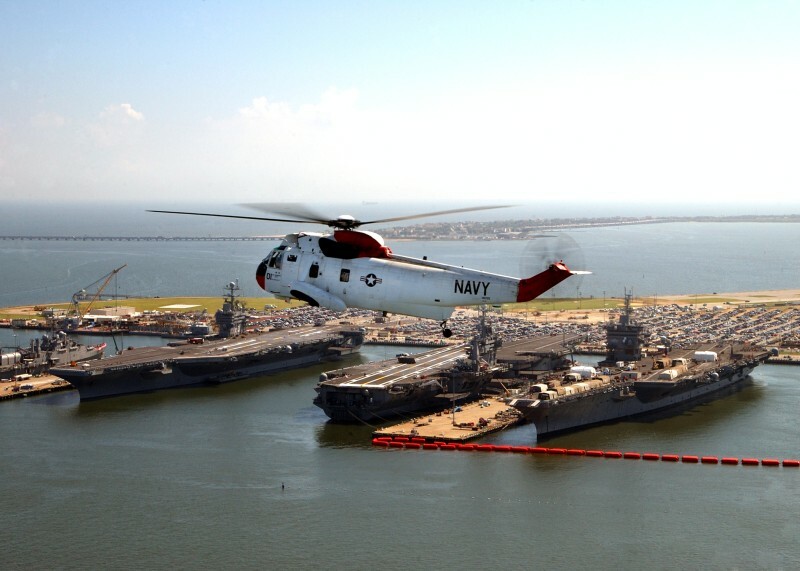 Photo by Ricky Thompson, ©Huntington Ingalls Industries (# DCS14-252). 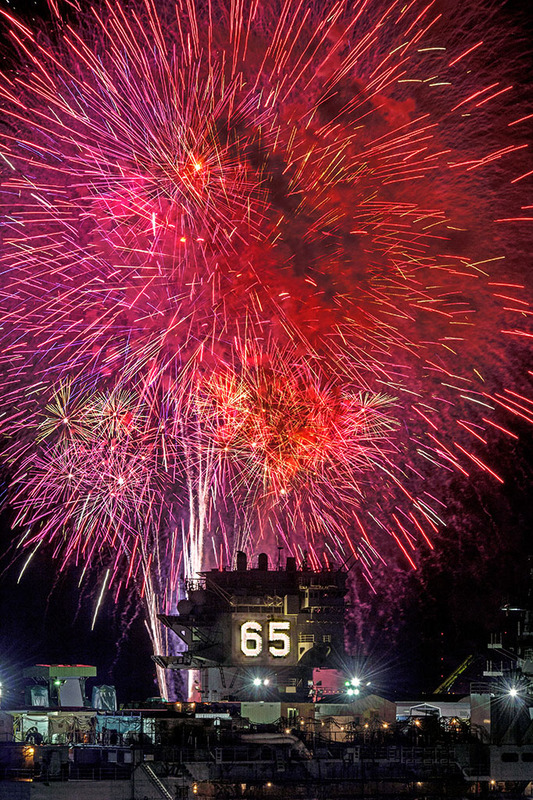 The Independence Day fireworks finale creates a brilliant canopy of color around the island house of ex-USS Enterprise (CVN-65), 4 July 2014. 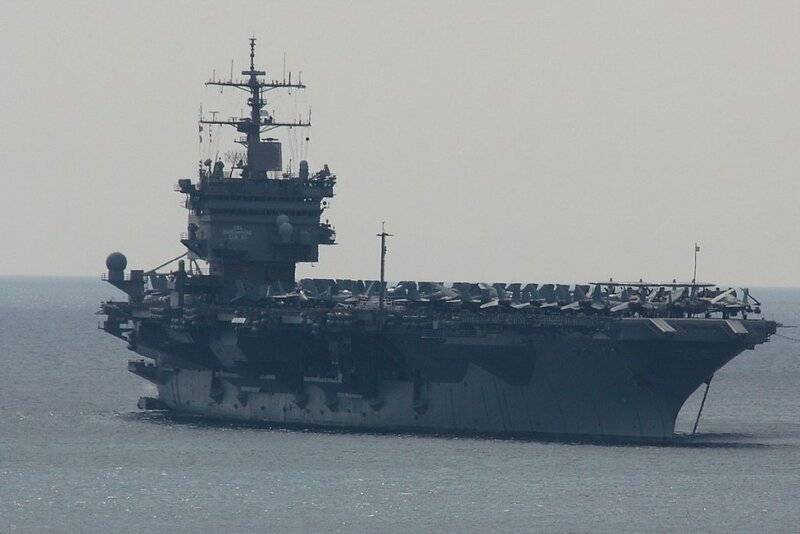 Two pictures of ex-USS Enteprise (CVN-65) taken on 14 July 2014. 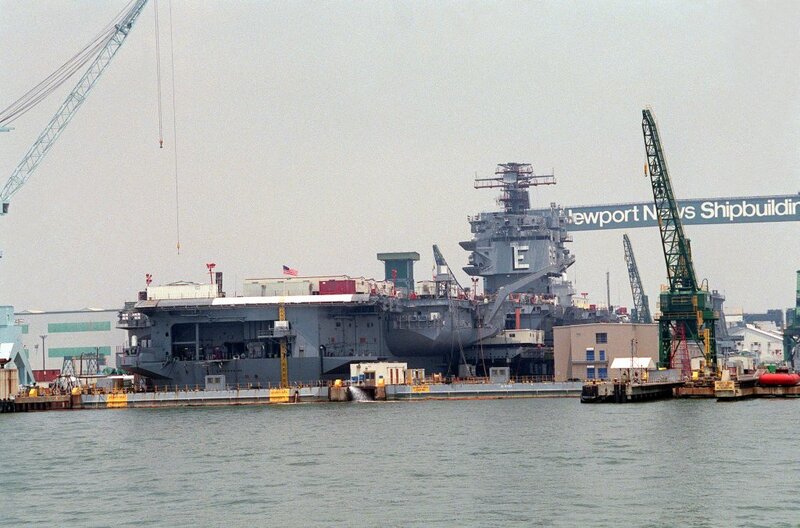 The Big E was being dismantled at Newport News Shipbuilding. 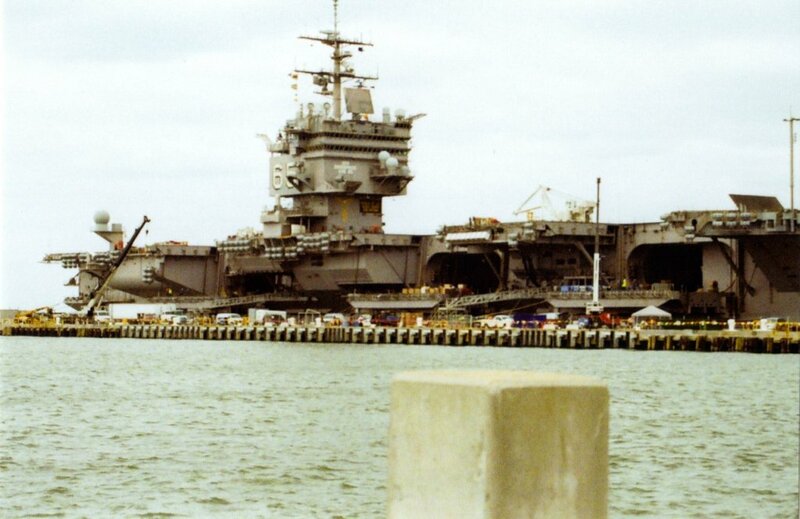 Visible in the background of both pictures is the island house of PCU Gerald R. Ford (CVN-78) which was being outfitted at the adjacent pier. Compare photo NS0265cla to NS0265cv. The bow of the former USS Enterprise, February 2016, in Dry Dock 11, Newport News, VA, where she was built over 50 years earlier. 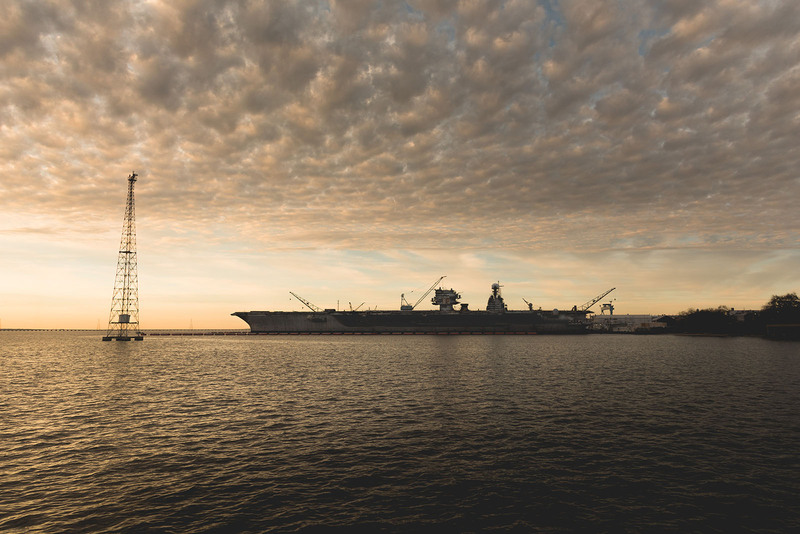 Photo ©Huntington Ingalls Industries (# DCS16-100), by Ricky Thompson. 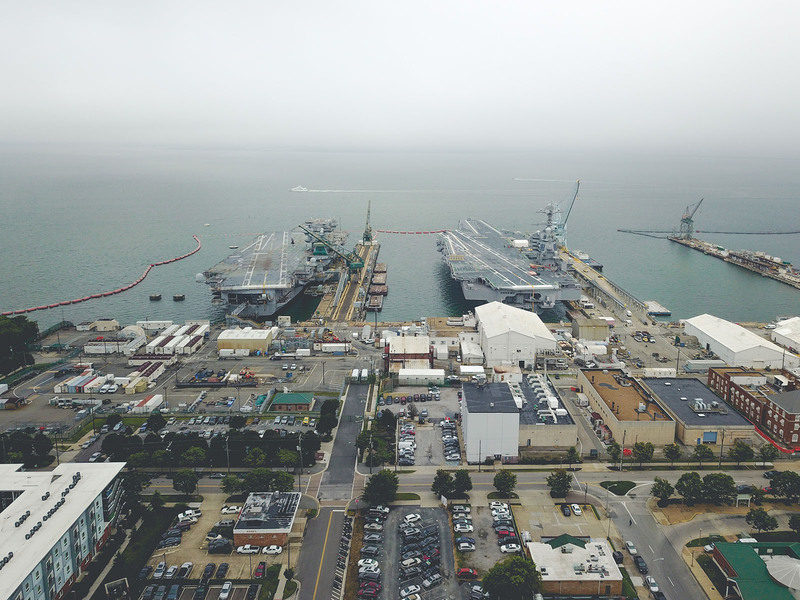 Ex-Enterprise (CVN-65) in the foreground, and the future USS Gerald R. Ford (CVN-78) in the middle distance. Newport News, Virginia, 1 December 2016. 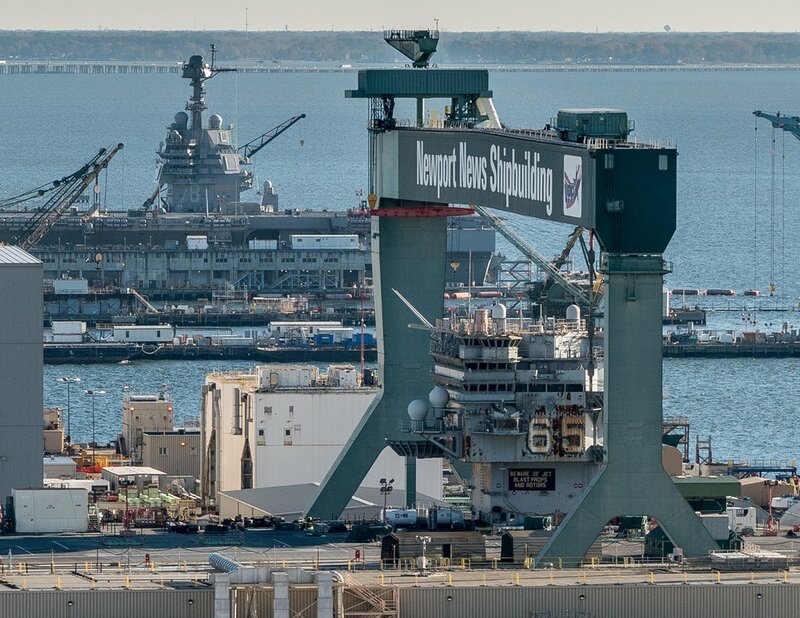 Photo ©Newport News Shipbuilding (# DCS16-700-40), by Chris Oxley. 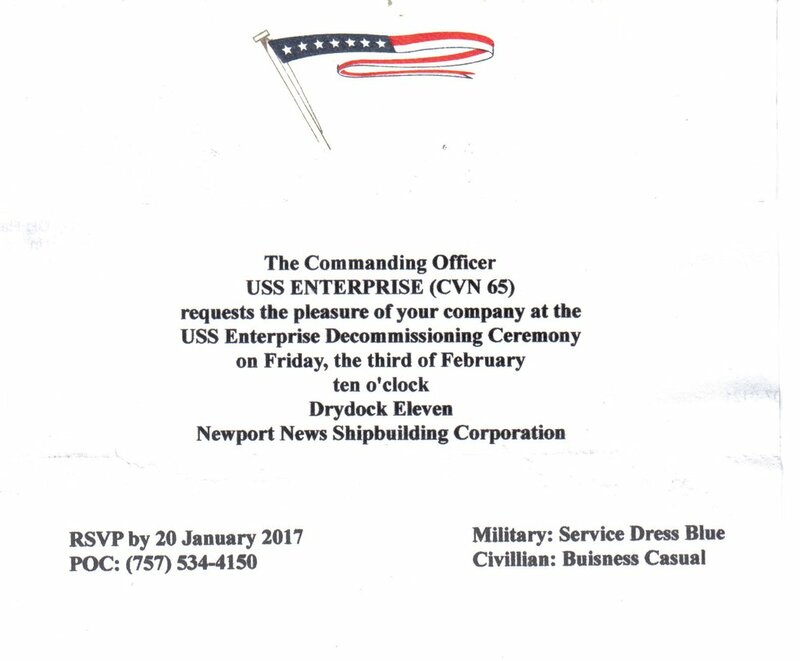 USS Enterprise (CVN-65) Decommissioning Ceremony, invitation. 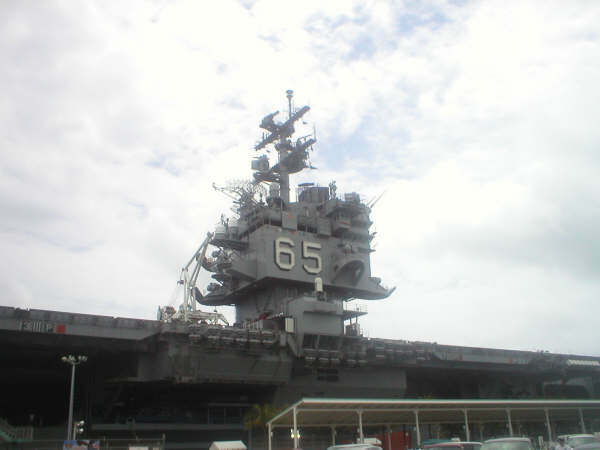 USS Enterprise (CVN-65) Decommissioning Ceremony. 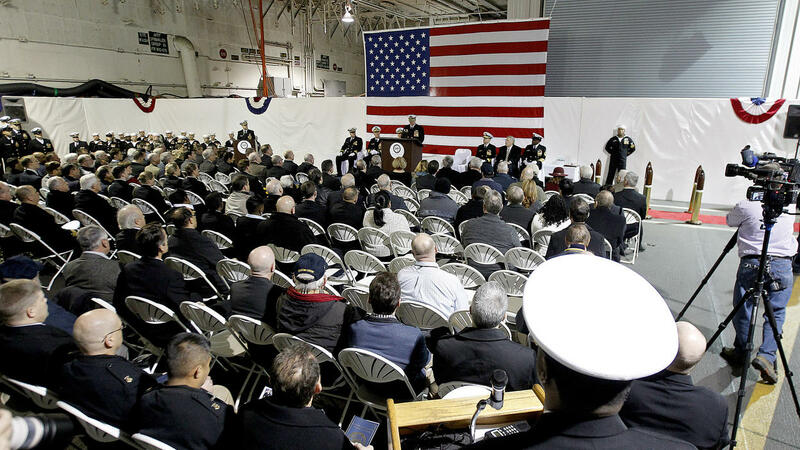 "We Are Legend"
The decommissioning ceremony held on Enterprise's hangar deck, 3 February 2017. The ceremony took place at Newport News Shipbuilding, one day before the 59th anniversary of Enterprise's keel laying. 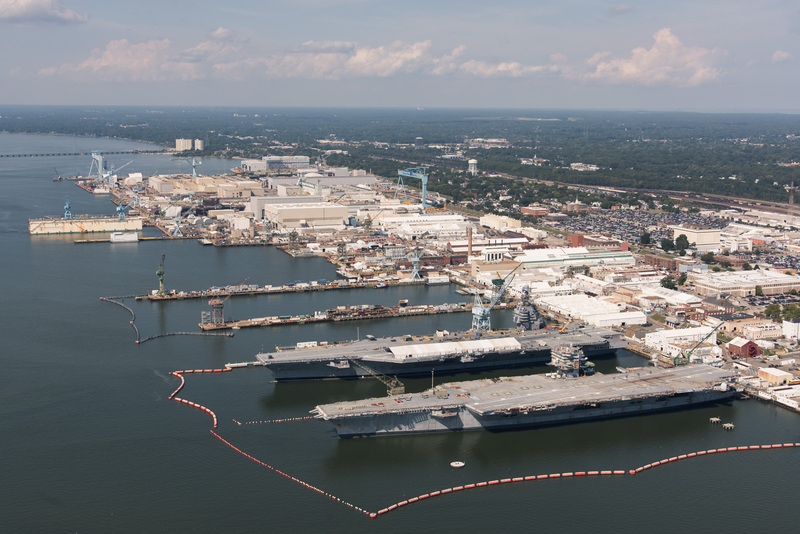 Newport News Shipbuilding, 27 July 2018. 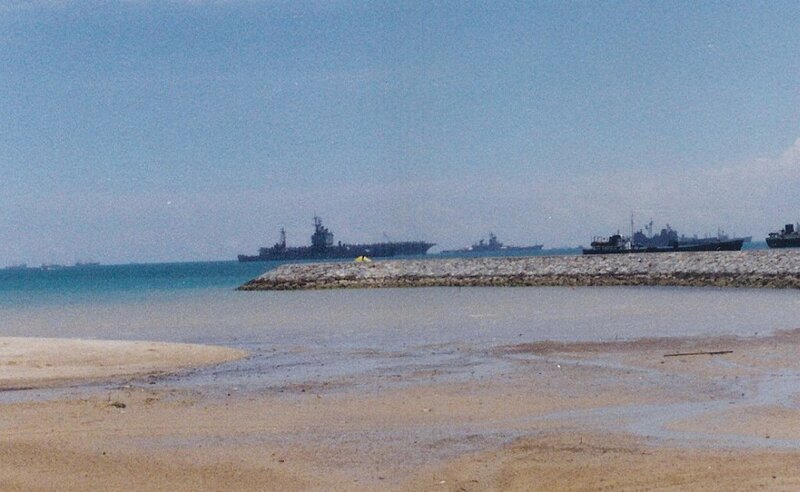 Ex-USS Enterprise (CVN-65), left. 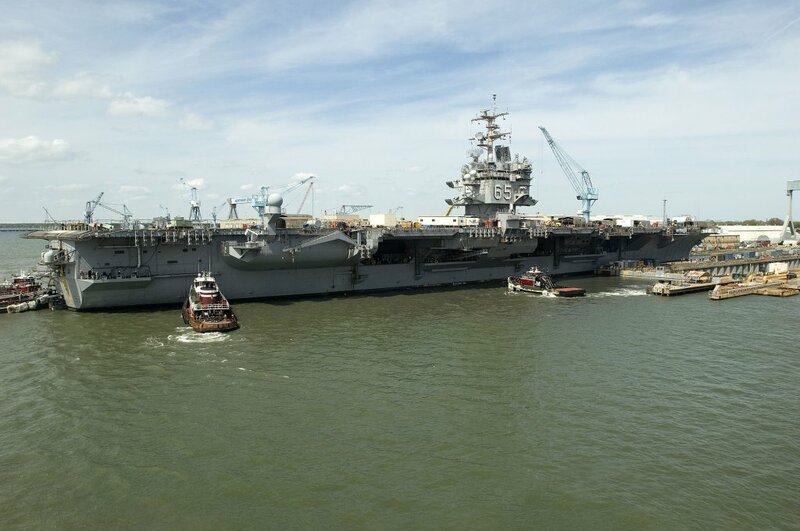 USS Gerald R. Ford (CVN-78) undergoing her post-shakedown availability. Huntington-Ingalls Industries-Newport News Shipbuilding (HII-NNS) photo by Matt Hildreth. Newport News Shipbuilding, 3 October 2018. 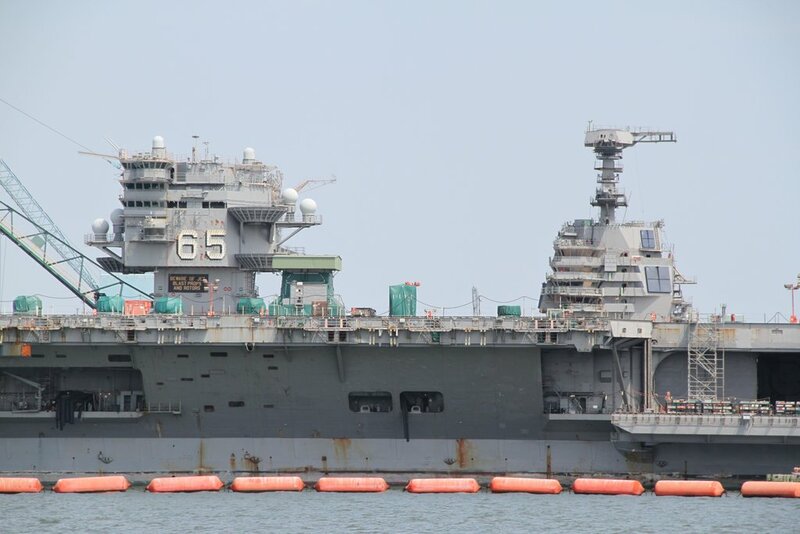 Ex-USS Enterprise (CVN-65)—closer to camera—, and USS Gerald R. Ford (CVN-78) undergoing her post-shakedown availability. Huntington-Ingalls Industries-Newport News Shipbuilding (HII-NNS) photo by Ashley Cowan. 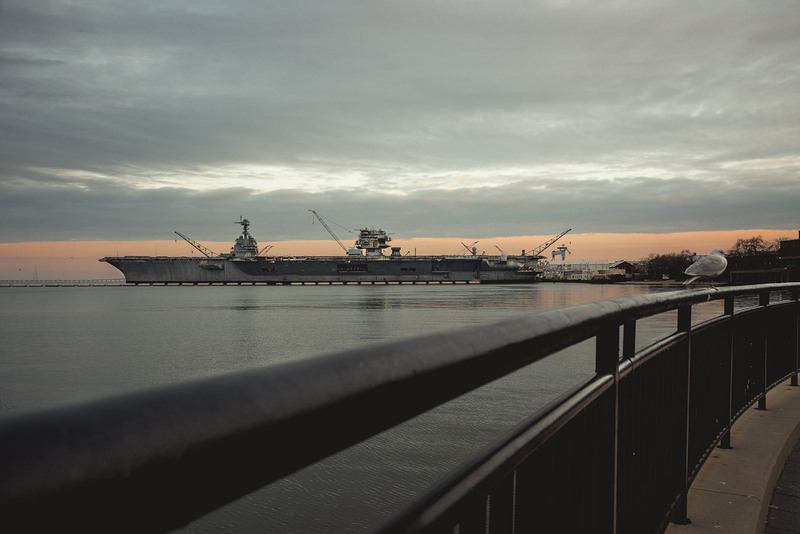 View from Victory Landing Park as the sun sets on the shipyard, 3 December 2018. Huntington-Ingalls Industries-Newport News Shipbuilding (HII-NNS) photo by Matt Hildreth. View from Victory Landing Park, 20 March 2019. 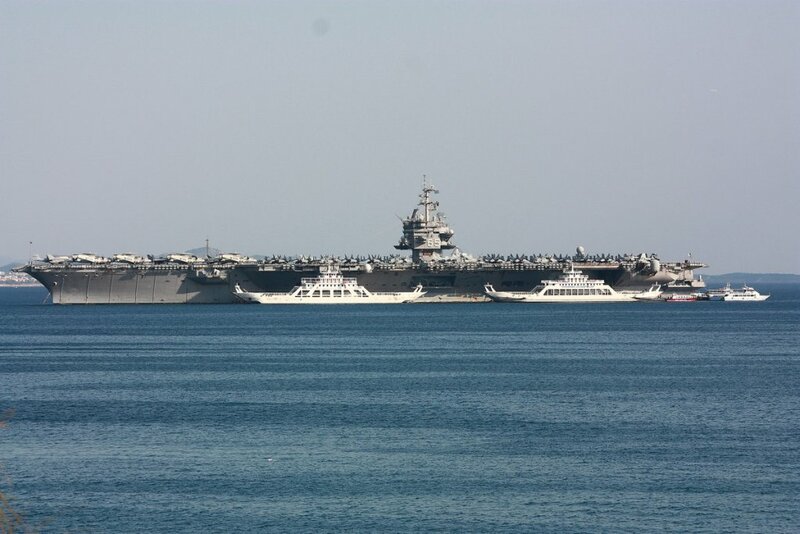 Ex-USS Enterprise (CVN-65) and, partly visible, USS Gerald R. Ford (CVN-78). Huntington-Ingalls Industries-Newport News Shipbuilding (HII-NNS) photo by Matt Hildreth.